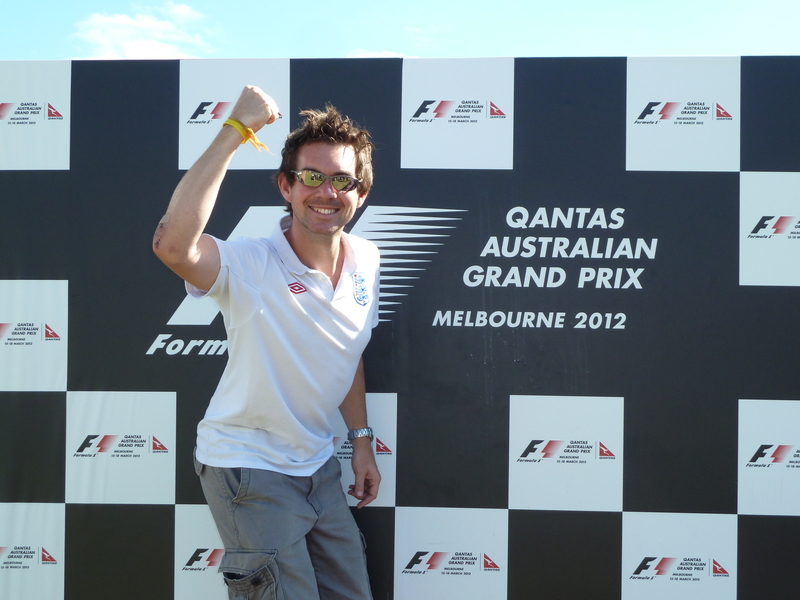 Got myself a few championship points in Melbourne - and another skinned elbow! About a month ago, when I first arrived in Melbourne, I had a sudden realisation during dinner one night. 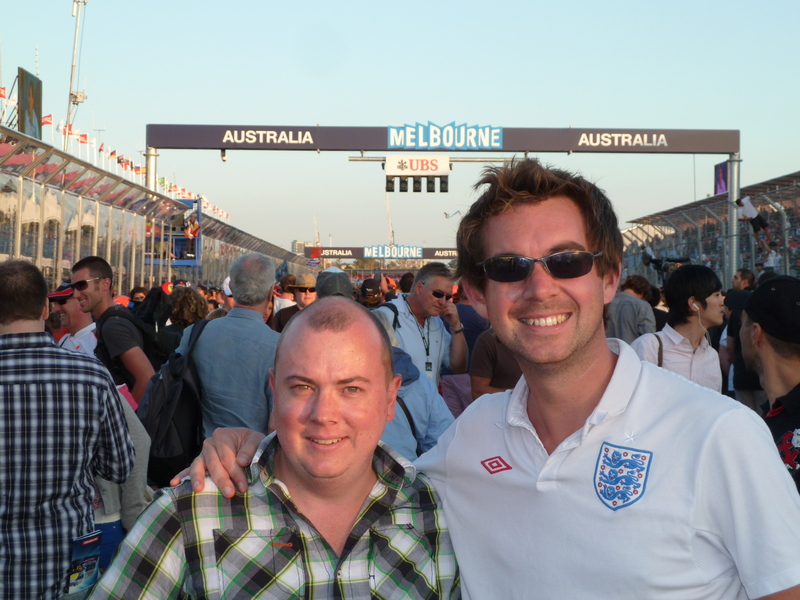 I was with my mate Ian and his parents, talking about how I could be about to spend a few months in the area, when it popped into my head about the Australian Grand Prix. “When is that held here?” I asked Ian. “In just over a month,” came the reply. 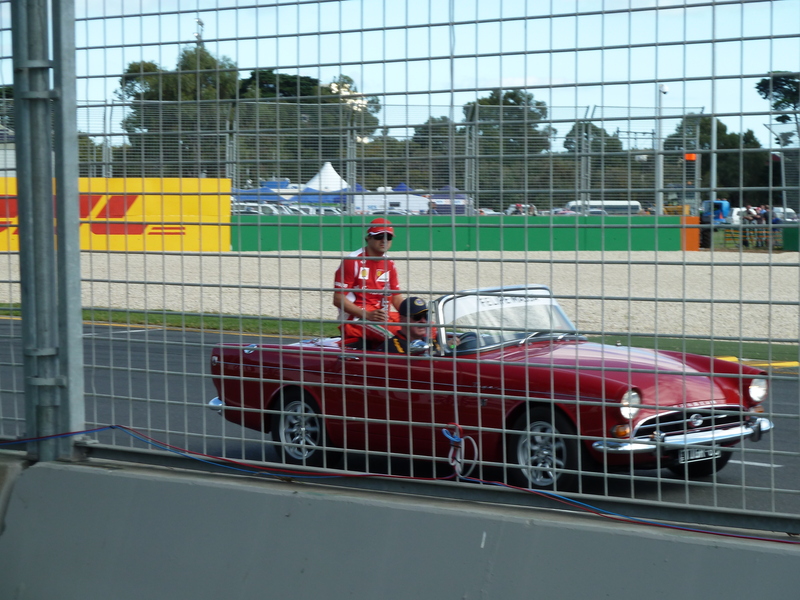 The deal was almost done there and then – wherever I was, if I was within a few hours of Melbourne, then I’d be by the side of the track when the world’s finest drivers come to town. 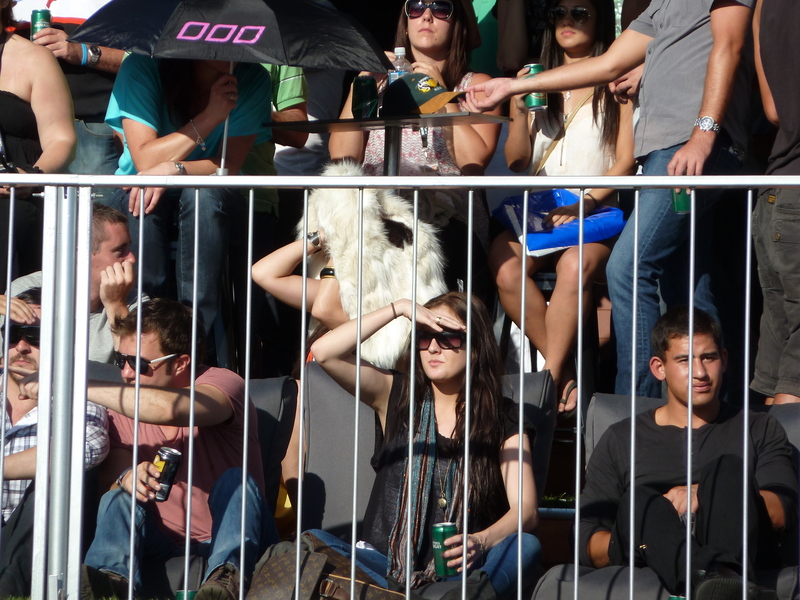 Fast forward a few weeks, and it was Grand Prix day. 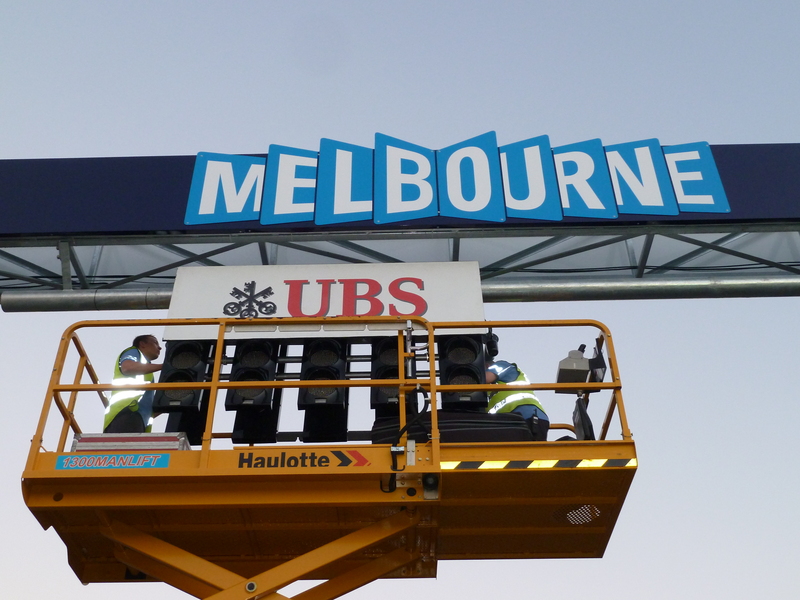 Thanks to a mainly European audience, the start isn’t until 5pm Australian time, which works out quite well when it comes to getting to Albert Park, the picturesque home of the Formula One circuit. However, the trains from Ballarat to the city are messed up for the weekend thanks to engineering work, meaning it’s a bus from the delightfully named town of Sunshine and into Melbourne city centre. I’d agreed to meet Ian at about midday, and so allowing extra time, I decided to catch the 9.17am service from ‘the Rat’. Up early, England shirt on to support our boys, and a cheese and Vegemite sandwich made and packed into my backpack, I got Nat’s bike out of her shed and powered my way down her drive for the short 10 minute ride to the railway station. And that’s where the day went wrong, more or less before it had even started. Standing up on the pedals, and trying to get as much speed as I could before a hill at the end of Nat’s street, I felt a sudden crack beneath my foot. Simultaneously, my foot flew off, struck the floor, my whole body lurched downwards, got swung over to one side by my rucksack, and then the front wheel turned on itself. I was flung off onto the gravel track, sliding along the surface with the bike. I came to a halt. 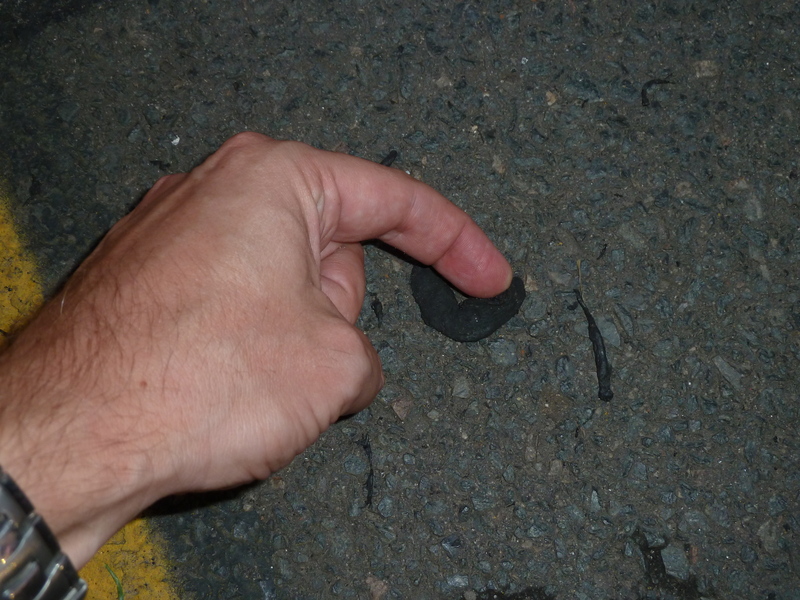 My arm was already starting to hurt, and then there was a warm trickle starting to make its way to my hand…. 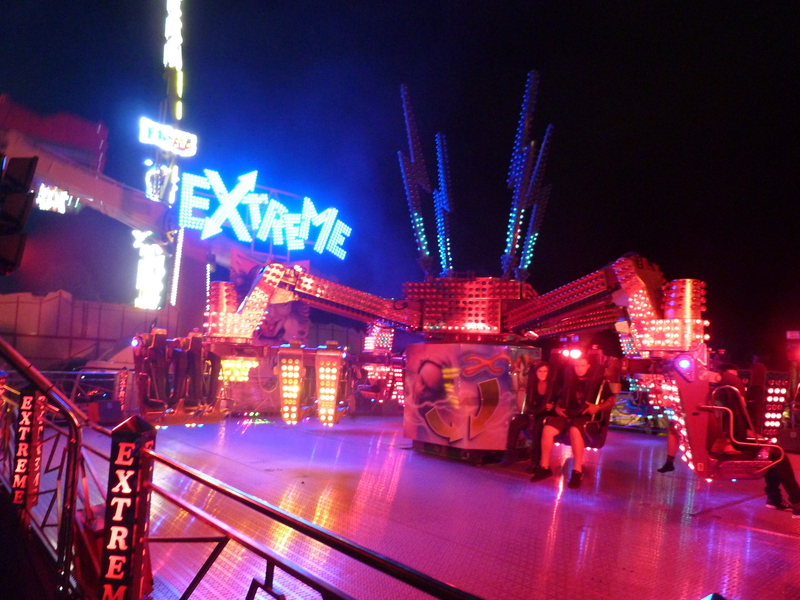 On the ground, a bike on top of me, blood pouring from my right elbow…I’ve been here before! I picked myself up and looked around to see if anyone had seen. Not a sausage. 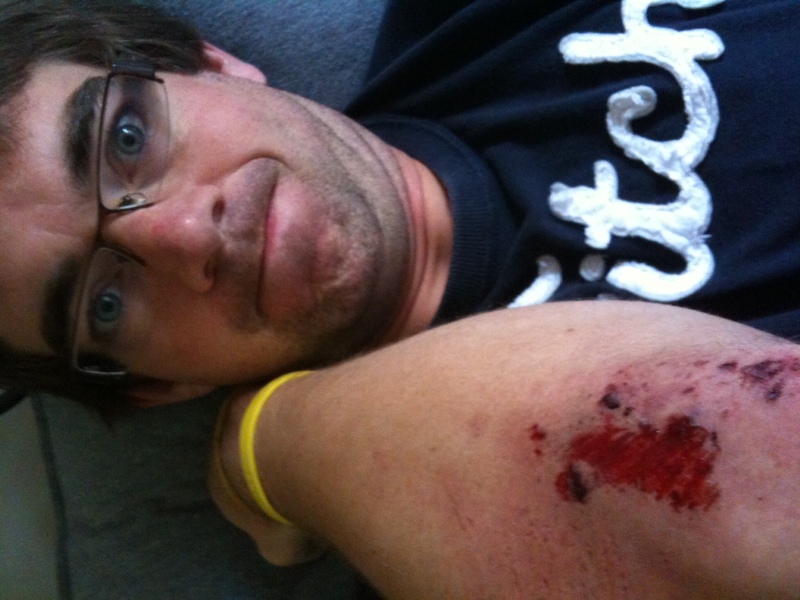 It’s a shame, because as two-wheeled catastrophes go, I’m sure it was quite spectacular. To make matters worse, I was also locked out, having secured the door behind me because Nat was still in bed. “Naaaaaaaaaat,” I called outside her room. “What…where are you?” came the confused reply. Her blinds opened, and as she squinted, she saw I was doubled over in pain – and then she saw the blood streaming down my limb. It was dripping all over the floor, and it made me wonder if I’d done some serious damage. I knew nothing was broken, but the amount of blood was perculiar. Nat disappeared inside to get some tissue, while I had a look at the bike. A pedal had snapped. Something I’ve never experienced before. Inside, I was stripping off to get the dust-covered clothes off me and to examine the rest of the gravel rash that had covered my right thigh and leg. Thankfully, my bag took the brunt of the force, but I’d managed to rip a small hole in my England top. It was also covered in dirt. By now, the pain was building in my elbow. 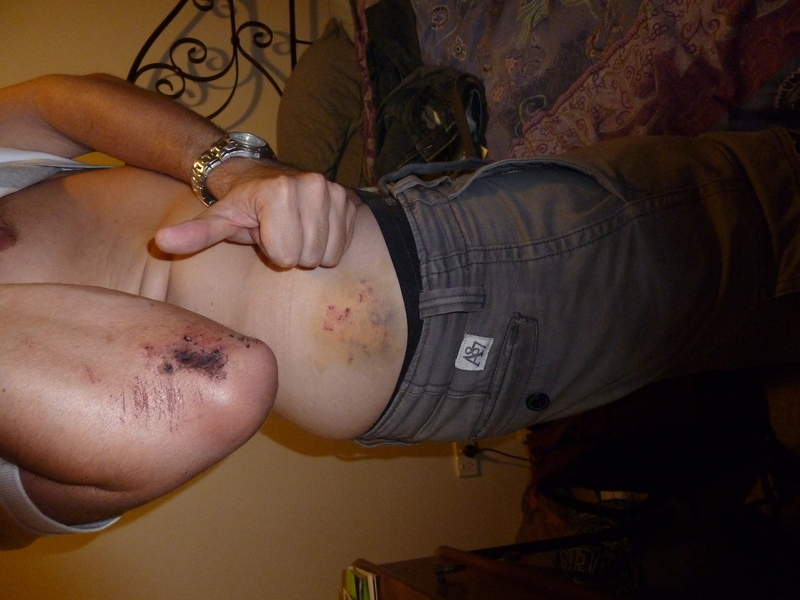 Unlike when I came off the motorbike in Thailand before Christmas, the pain seemed so intense inside my arm. I’d obviously given it a hefty whack, and right on the funny bone. It was far from funny, and there was no way I could catch the train. Instead, I spent the next hour laying down, drinking tea (cure for everything?!) putting my England top through the wash and mopping up my weaping wounds with bits of tissue. I’ve ripped off all the nicely healed scars from my Thailand mishap, and no doubt this lot will leave my elbow in a right mess now! Ironic, considering there was no engine involved! Taken a couple of days later, minus the back scrapes! Anyway, an hour later and I was ready to give getting to the station another go, but this time stayed on four wheels thanks to Nat giving me a lift. With a dust-covered bag, a nasty-looking arm and a soggy footy shirt, I took my seat on the train and headed south. After an hour, we arrived in Sunshine and swapped onto a replacement bus. I don’t know if its anything to do with the name of the town, but the clouds had started to thin and the temperature was rising. 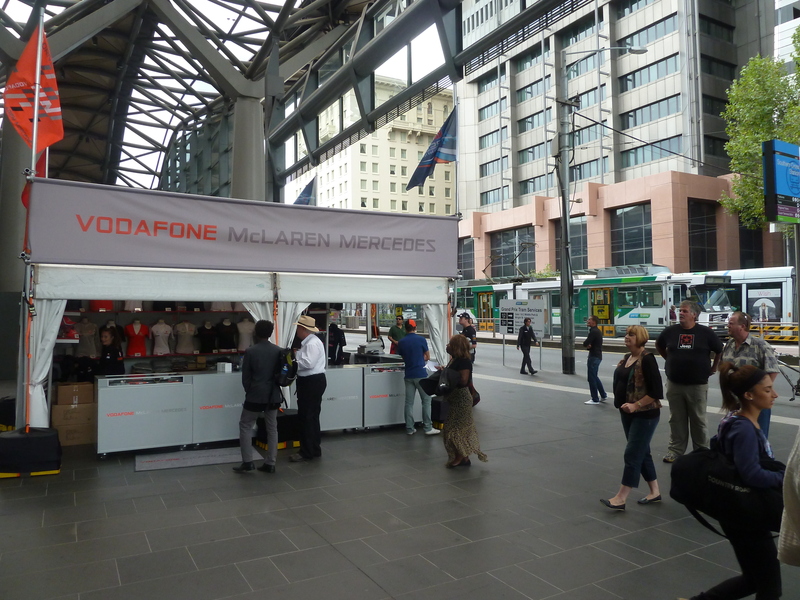 I met Ian at Southern Cross Station, where stalls of Formula One merchandise had been set up eager to get the early dollars off racegoers. 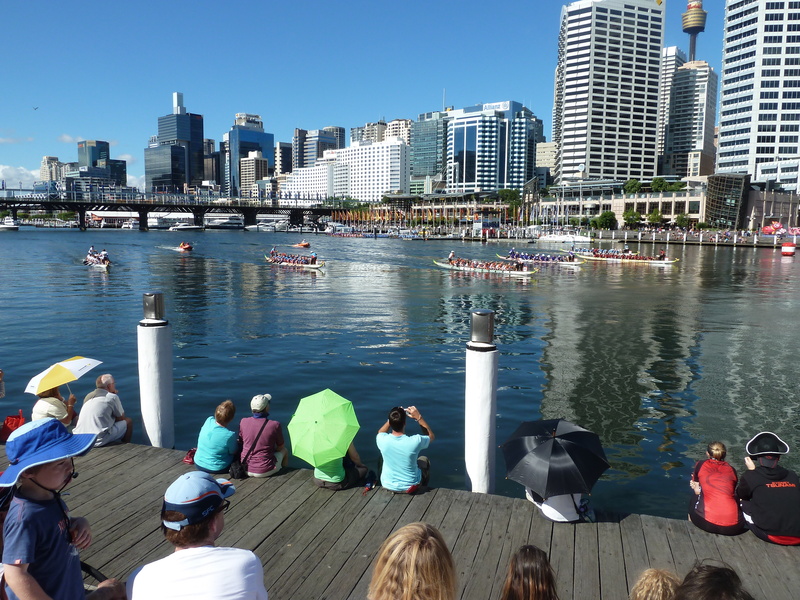 The whole city had been focussed on the race, with huge streets and stations closed off to enable trams to operate a direct service to the track. 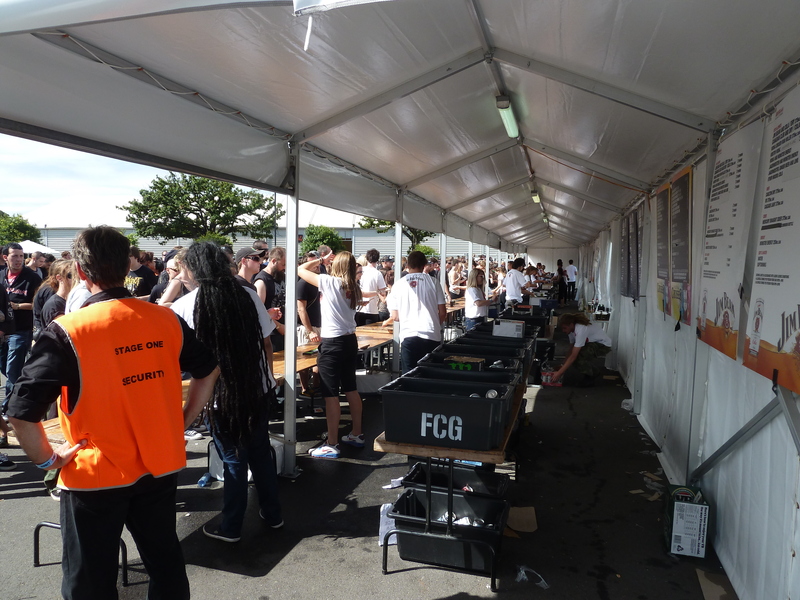 I have to say, the organisation was superb – despite thousands of people arriving for the event, we didn’t have to wait for transport thanks to a huge line of trams ready and waiting along the street, each rumbling forward to fill up and quickly moving away with passengers. We arrived just a short ride later, and went through Gate 2 to find thousands of people watching a V8 support race that was already well underway. 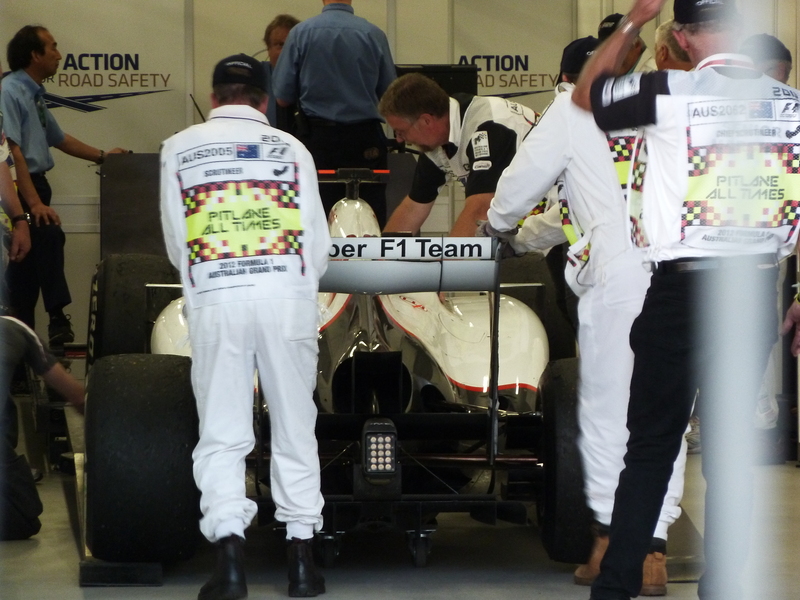 Its been a few years since I last went to a Grand Prix at Silverstone, and its always easy to forget the incredible speeds even the support cars can reach before Jenson, Hamilton and co take to the track. 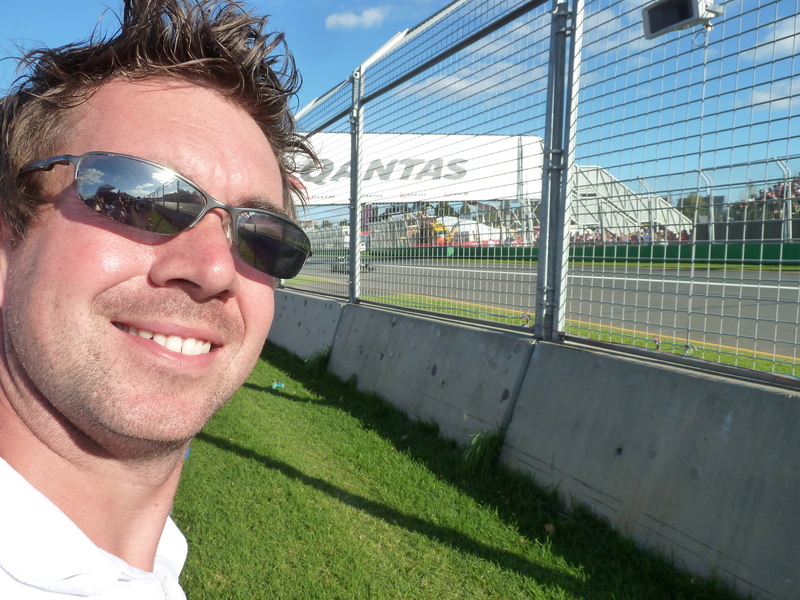 The first huge difference I noticed in Melbourne, compared to Silverstone, is just how close you can get to the track. 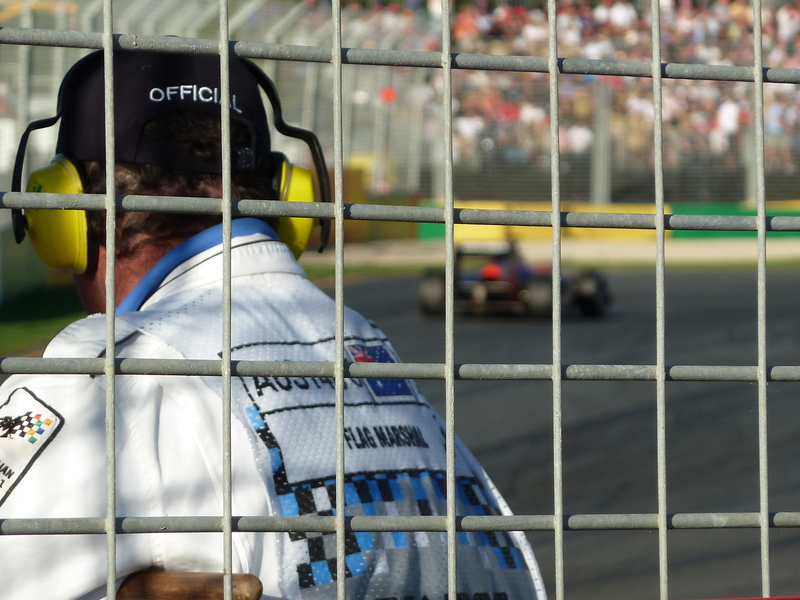 With just a flimsy cord fence keeping you a few feet back from the steel protective mesh, you’re just a few metres away from the action. It is very much ‘trackside’. Ian told me the part of the track we were at was where Martin Brundle famously flew into the air and flipped over a few years back, and as I looked down the track, it all suddenly seemed very familiar. 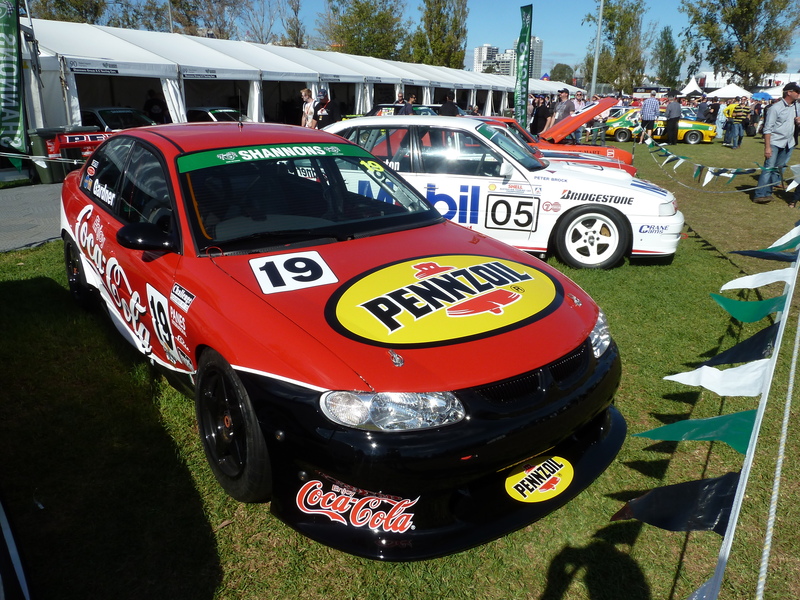 Great spot at the front on the main straight! 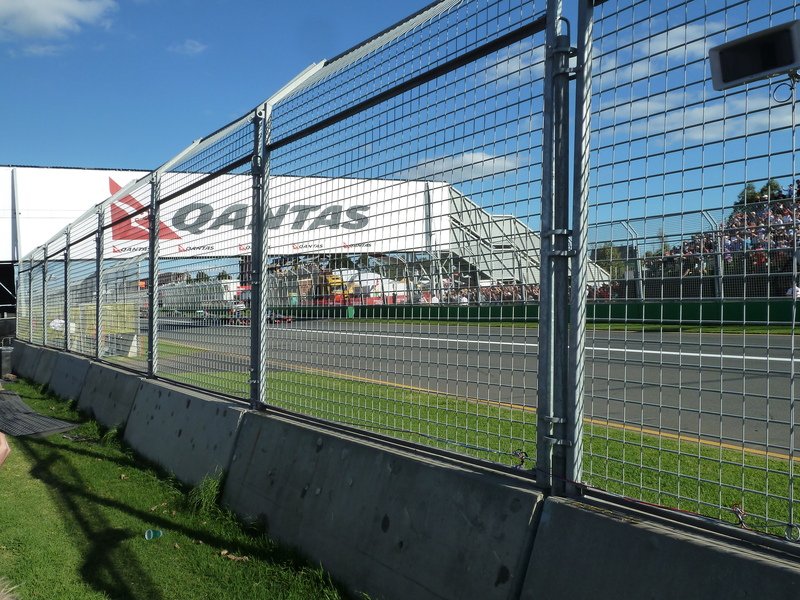 We wandered further towards the main start and finish straight, through the crowds and up to the fence at the end of the straight, right beside a huge bridge plastered with Qantas, the Australian airline sponsor of the race. As I watched the action on a big screen behind me, I realised just how familiar the camera shot was as the current support race flew around the final corner and down the long finish straight in front of me. It’s a shot I’ve seen so many times on the television back home, with so many vital points won or lost at the Australian Grand Prix. It’s the largest single annual sporting event in the country, and its usually on in the middle of the night in Europe thanks to the time difference. Nevertheless, once I saw the Qantas bridge in the foreground, memories of watching the world’s most famous drivers get the chequered flag at the famous circuit from the comfort of my sofa back home came flooding back. And I had a front row position, just metres from the Porsche support cars flying past and slamming on the brakes as they darted into the first corner. 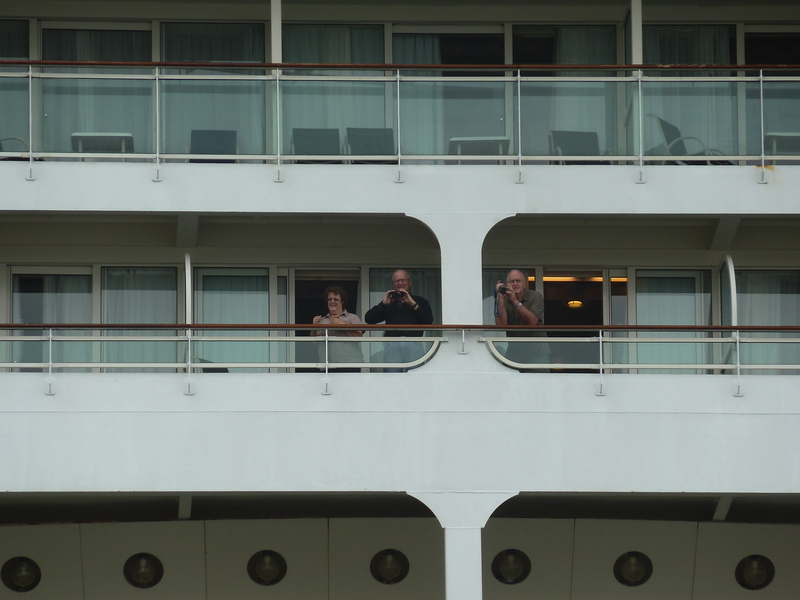 Others had their own great views! 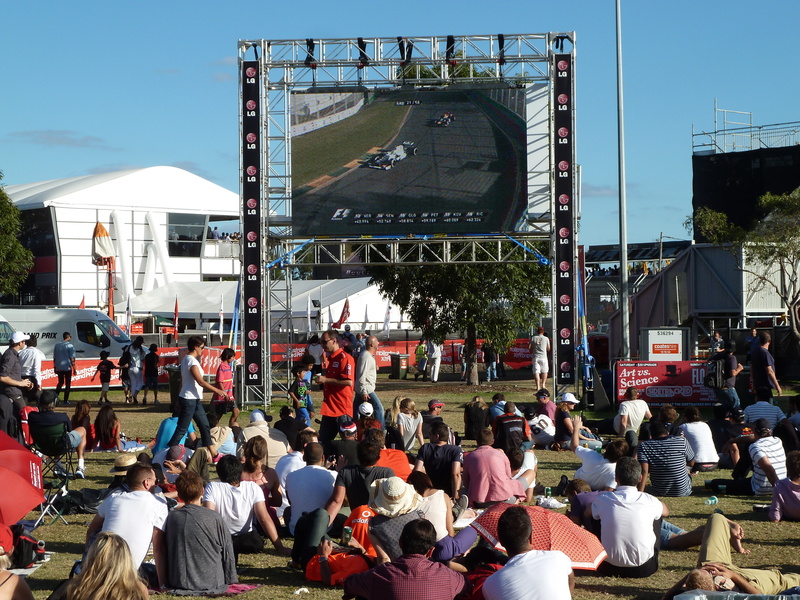 Another thing that felt all too familiar from watching the Australian Grand Prix on television was the weather. The early morning clouds had given way to glorious sunshine, and it wasn’t too hot either. We’re at the back end of the Aussie summer now, and temperatures have definitely cooled off in recent weeks, but it was still warm. It was the usual weather that you see back home, normally while huddled around a warm fireplace and wishing to be in the sun by the track. 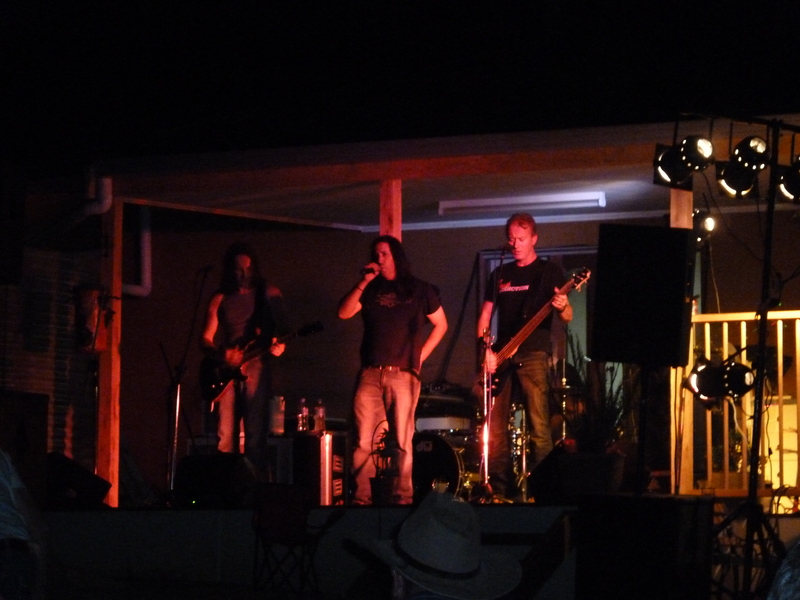 Everyone was there for the Formula One, but before the big race of the day, there was plenty of other entertainment. In one video shown on the screens it was explained how the latest F1 cars produce so much downforce to keep them on the road, that if they ran at full speed on a ceiling, it would easily stick to it. 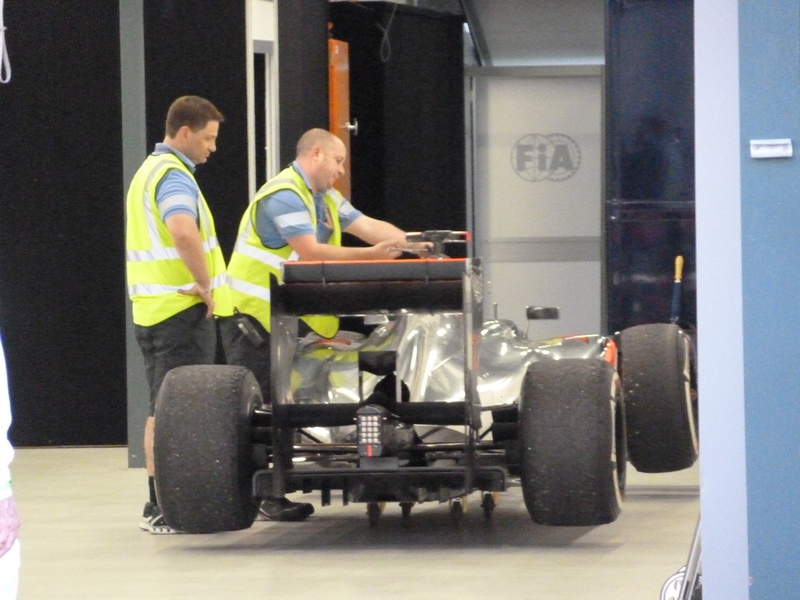 Three tonnes of downforce – enough even to attach another car to it and still remain in contact with the ceiling. Quite how they would get it up to full speed upside down is clearly a problem, but a fascinating example of some of the forces produced in the high speed sport. To demonstrate the power of an F1 car further, a great support race was held. A fast Mercedes road car was lined up against a V8 sports car and last years’ Mclaren Formula One model, but instead of being set off at the same time, they were given a staggered start. As the roadgoing Mercedes sped past, it was another 40 seconds before the Mclaren was given the green light. Amazingly, all of the cars hit the final straight at the same time, with the Mclaren making a cheeky overtake just before the finishing line to take the win. Despite a 40 second handicap, it had caught up on both of the other cars and easily won. 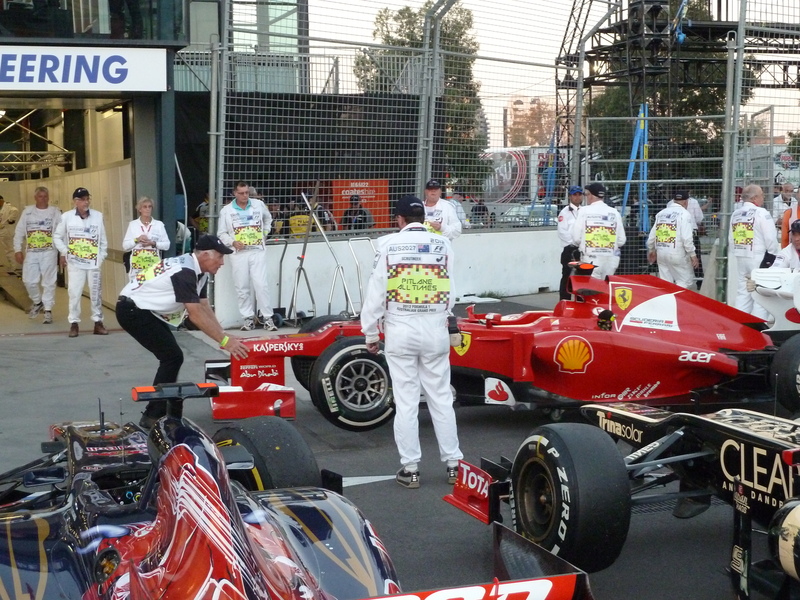 It was a brilliant demonstration of how the F1 cars, and their drivers, really are in a league of their own. Ian and I went for a walk around the track, stopping by at the St John Ambulance first aid station for a plaster thanks to my cycle-related injury that for some reason will not stop bleeding. It was interesting to see just how much paperwork I had to fill in for one single Band Aid, and even more interesting to wonder just what would have happened if I’d let the cadets have their own way with me. 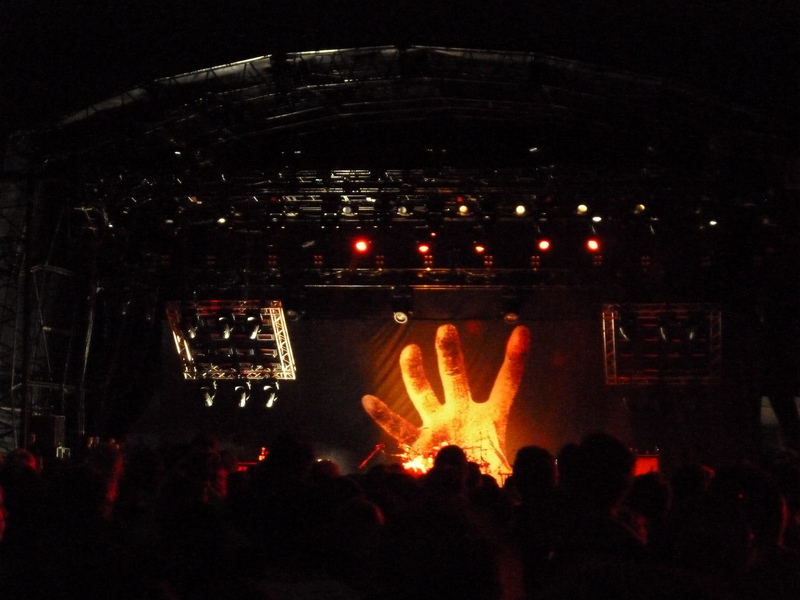 It was clearly one of the most exciting things to happen during the day for them, and I think I was one step away from being sent for an MRI scan of the head and X-Rays at the hospital, such was the seriousness they dealt with me. I jest of course, but it did all seem a bit over the top! Thankfully it didn’t take too long, and we walked over to the lake, making our way across a clever little floating bridge and to the opposite side of the track. It took us to the long, high-speed, gently curved section by the lake, another part of the circuit which leaves you feeling incredibly close to the action. 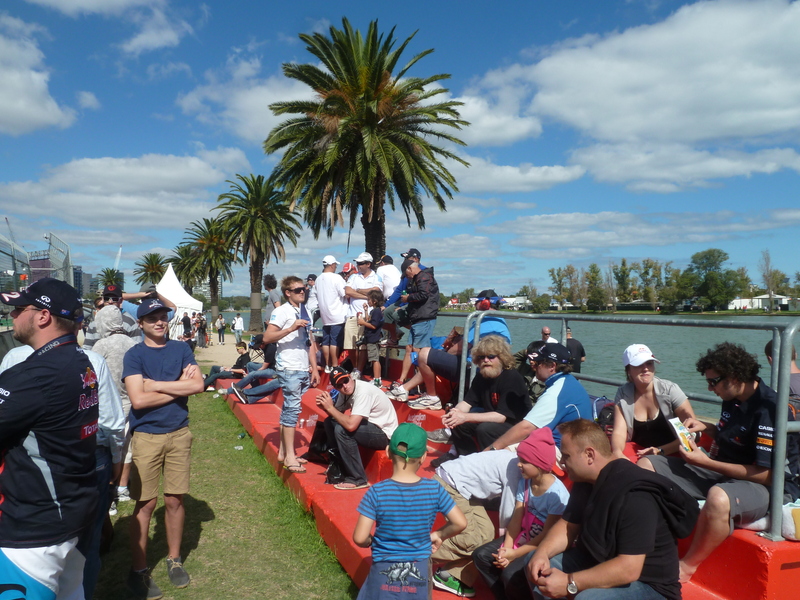 We continued walking all around the lake, and by the time we reached the start of the pit lane, the drivers’ parade lap was underway. 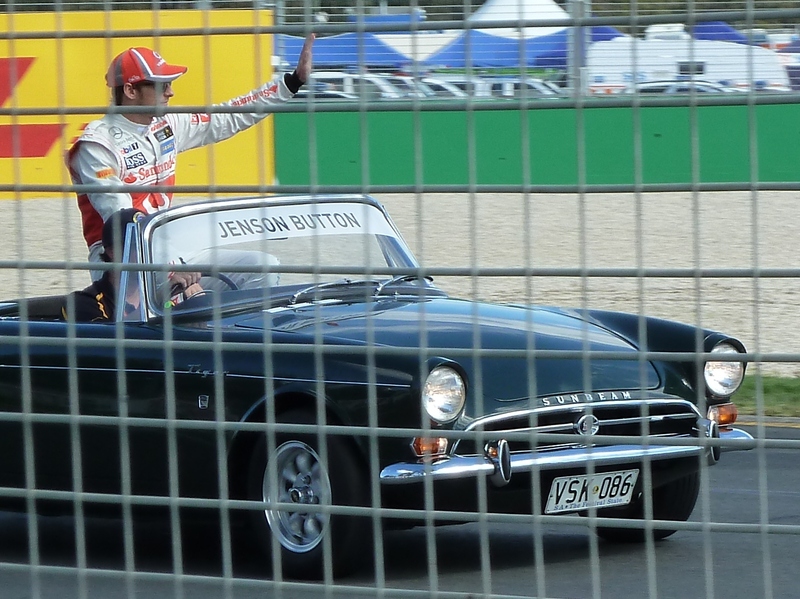 I managed to get a photo of Jenson Button, but was too busy loudly shouting “Come on Lewis” as he passed in a classic convertible to get another photo. I think he heard me too – there were not too many British fans around me, it was all a bit quiet on the corner I was at, and he quickly waved back at us! With time ticking on, and just an hour to go before the start, we started walking back to the first corner. Overhead, Australias equivalent to the Red Arrows were performing their display – not a patch on our Reds of course, mainly due to slow propeller engines and the fact there aren’t as many of them – and I managed to peer over the fence of the international television compound. 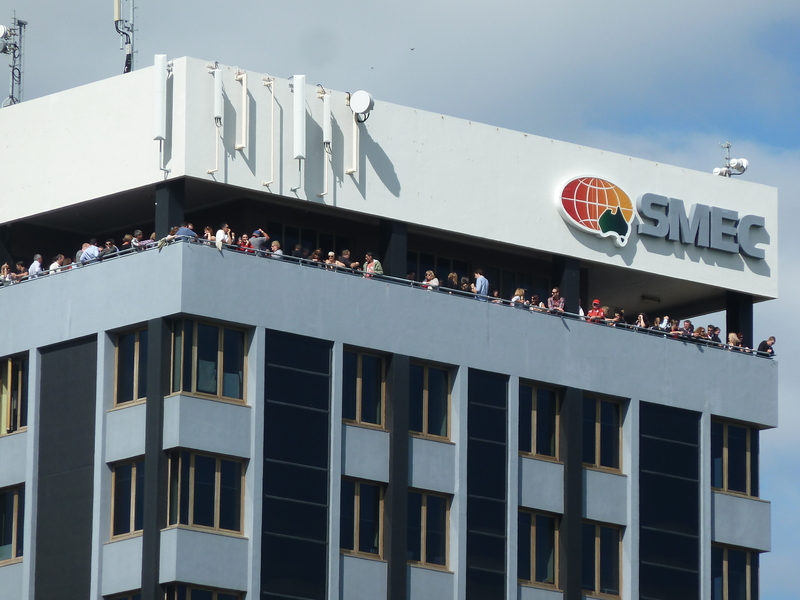 There were rows and rows of impressively large satellites, beaming all the action to countries around the world and to millions of viewers. For someone who works in television, the geeky side always comes out, and its always fascinated me how they bring such huge events to an even bigger audience so well. 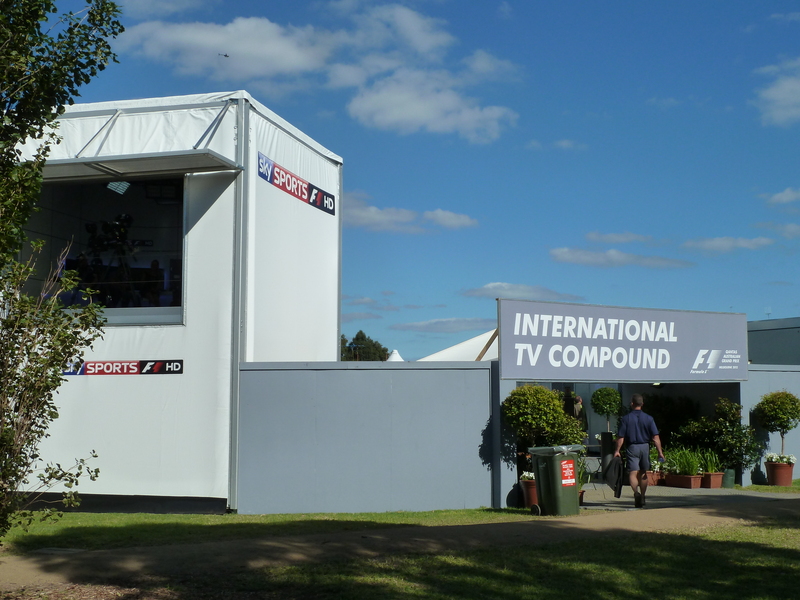 Even new boys Sky Sports had a scaffold tower studio, although by all accounts, their coverage wasn’t a patch on the BBCs…but then I would say that. Back at the start and finish straight, and with 40 minutes to go, we managed to grab the same great spot to watch the start, right by the famous Qantas bridge and with enough sight of the first corner to see any drama unfold. 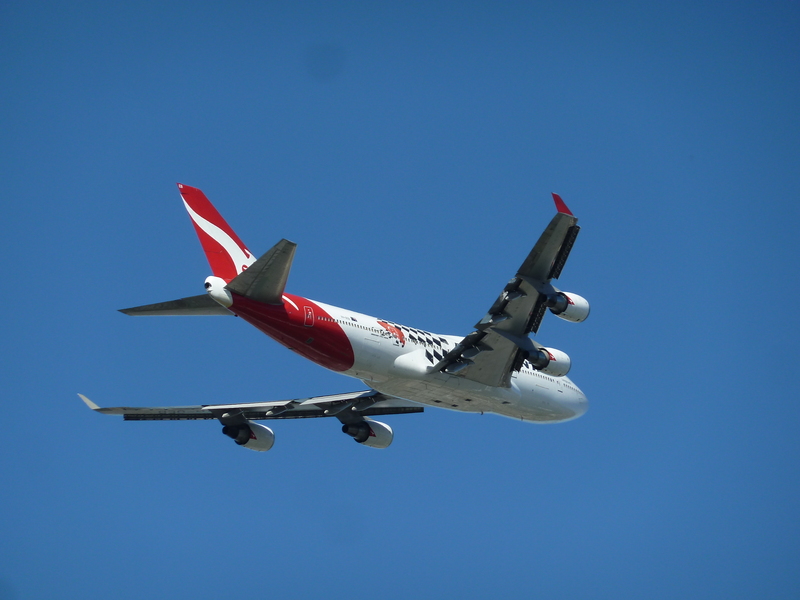 There was yet another aerial display before the start, this time by the Grand Prix sponsor Qantas who threw one of their Boeing 747-400 jumbo jets, complete with F1 markings, into the sky for a bit of an air display. Its fair to say it was a bit of a show stopper – most people can relate to the aircraft as long-distance routes from Australia almost always use a huge airliner like the 747, but to see one being flown so low, so slow and being turned around on a sixpence was just so different. I’ve never seen such a display by a passenger aircraft, and it was great to watch as it did about four circuits, each time performing another new manoeuvre to please the crowds. Finally it made one last flight over before the pilot threw it into full throttle and accelerated high into the sky and away, no doubt back to the nearby airport. 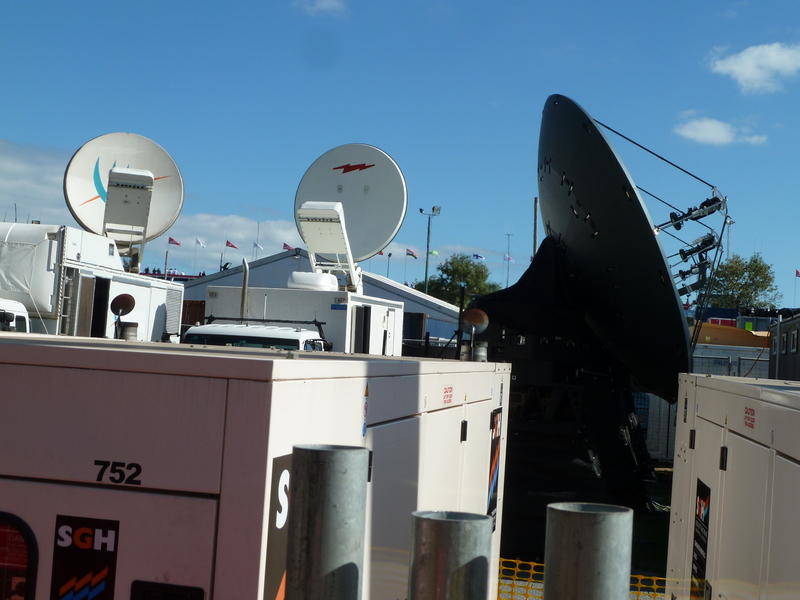 And then another sound filled the air, as the unmistakeable scream of an F1 engine approached from the pits. And then another. And another. 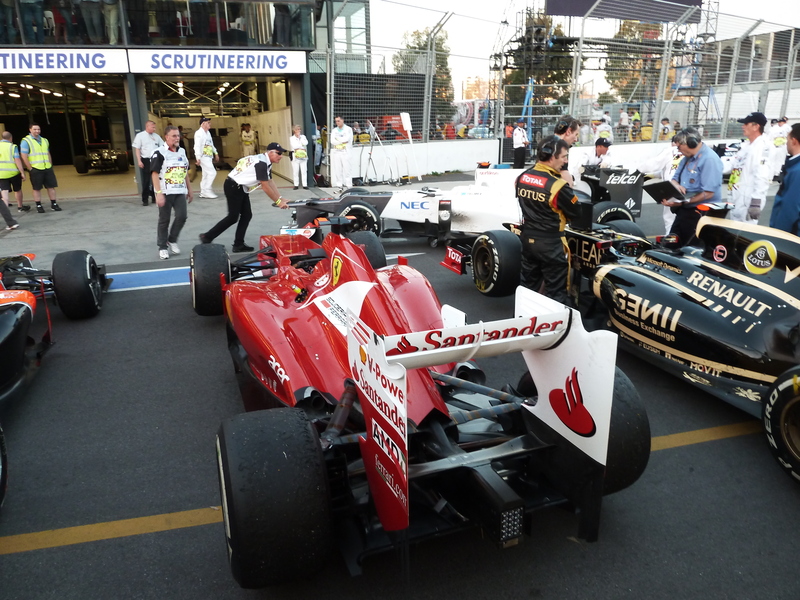 Before long, they were all out on the track and heading around to their start position on the grid. The tension mounted as the parade lap got underway, each of the cars filing past us and lining up back on the grid. I watched as the last cars got into position and the lights went red. The feed was the same shot the viewers back home, wherever home may be in the world, were watching. Just a couple of hundred metres to my left, the unmistakeable sound of more than 20 multi-million pound cars screaming through the revs grew into a crescendo, and then they were off. Within two seconds, they were right in front of me, the deafening noise filling my ears as Jenson Button led the pack into the first corner. There was drama straight away, as a number of cars clattered into each other on the first turn, prompting one to make an early pit stop. As they disappeared from view, the sound quickly disappeared into the distance as they made their way around the back end of the track. Just a minute later, they’ve covered the 3.3-mile circuit and the sound grows yet again before the unmistakeable howling, screaming engines fly past in the blink of an eye. The noise truly is deafening – an ear-ringing-inducing level that is impossible to describe without having actually experienced it in person. Its also hard to explain just how fast the cars pass. You barely have time for your brain to process who the driver is before they’ve passed on yet another of the 58 laps. 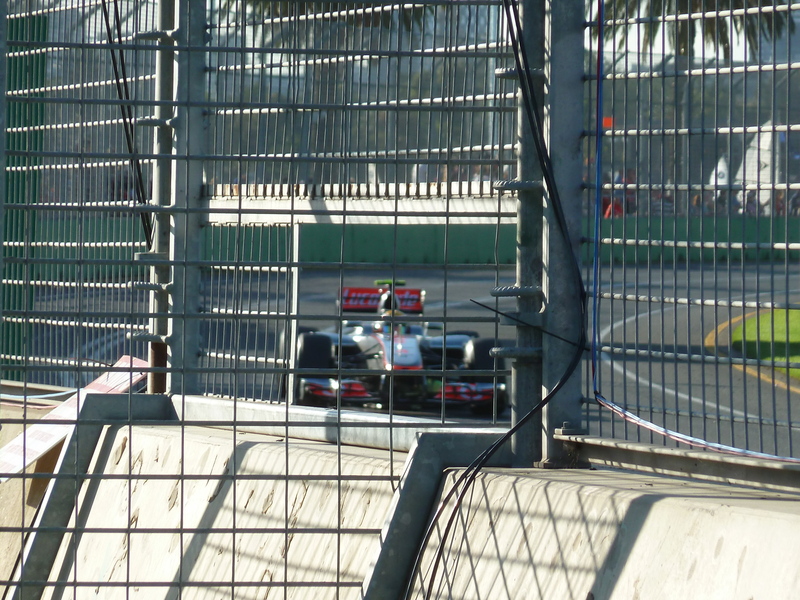 Taking photos is almost impossible, especially from behind the steel safety fence which prevents my camera from focusing on the track behind, let alone an object moving along at 180mph. Undeterred, I did manage to get a couple of photos around the circuit which I feel summed up the day, including a few from the other side of the lake where we stayed for the final stages of the race, cheering Jenson Button on to victory, much to the disdain of my Aussie companion and the rest of his countrymen around me cheering on their man, Mark Webber. 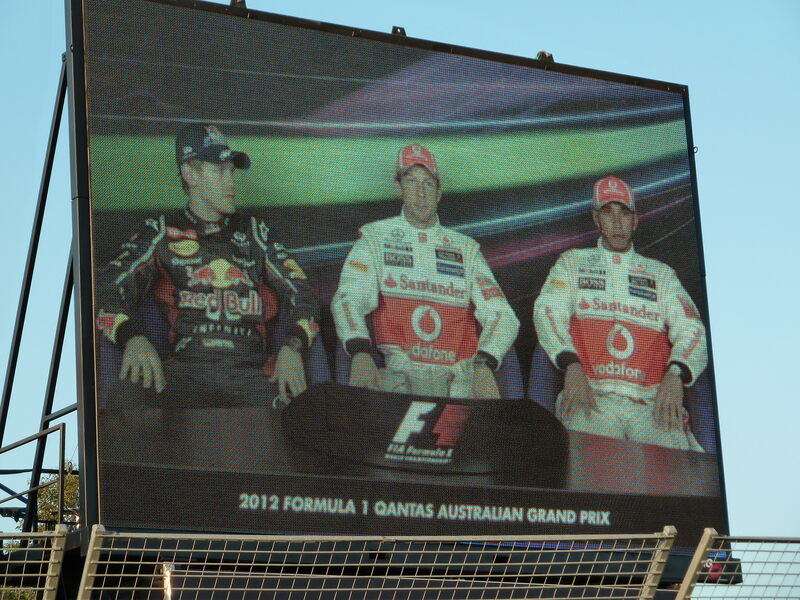 In the end, Webber finished fourth, but up on the podium were Jenson Button and Lewis Hamilton. Jenson led from start to finish, and who knows, perhaps it’s the first win of many this season. 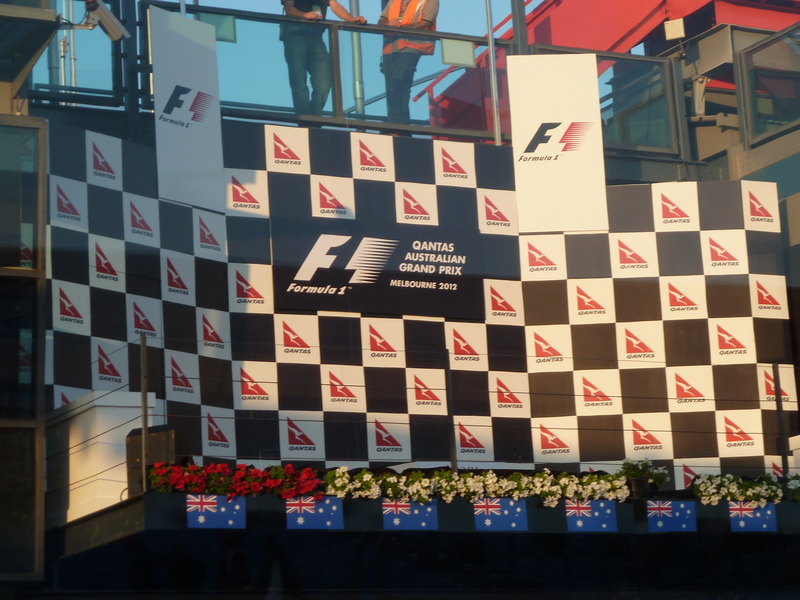 It would be great to look back on the season if he won the championship and know that I was there, trackside in Australia, to see his first win of the year. As the British national anthem sounded around the track, we made our way towards the pit lane as thousands of people spilled onto the circuit. 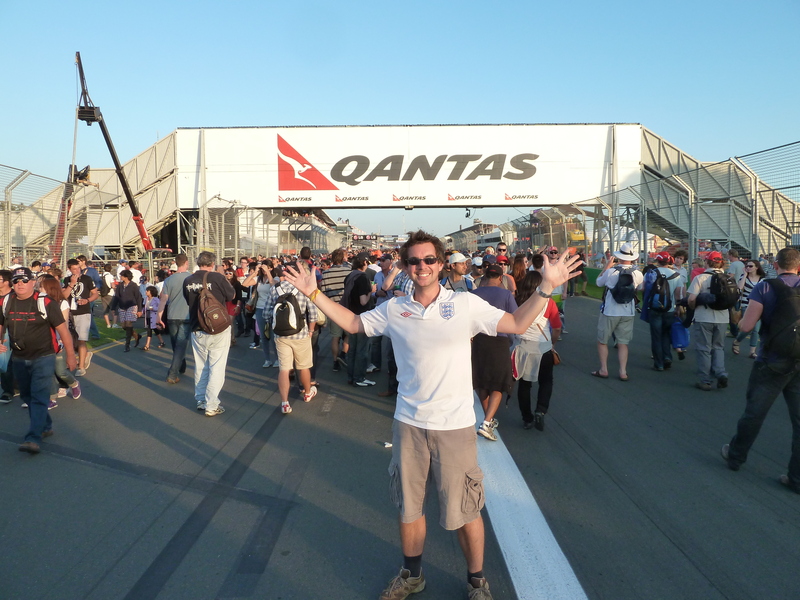 I joined them, climbing over a metal marshalling railing and walking along the main straight to the lights. 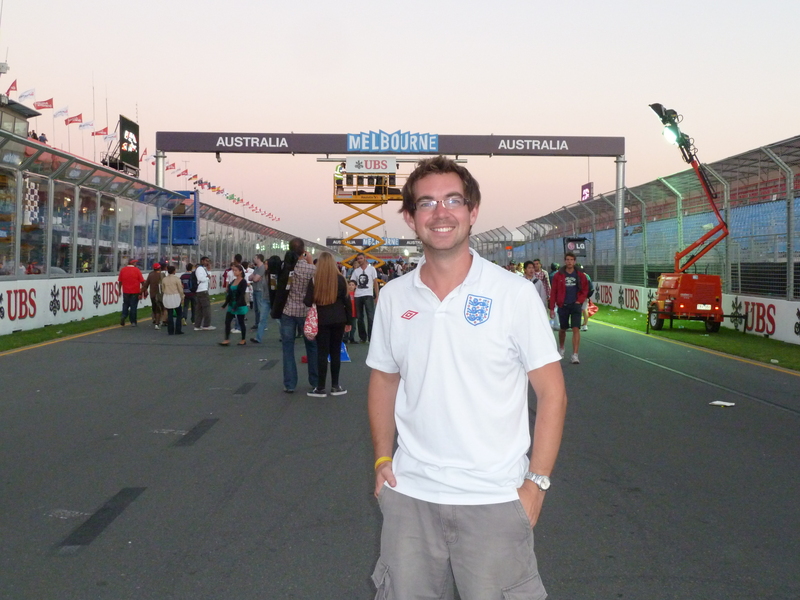 It was a great feeling, walking along the famous straight that just a few moments ago, the likes of Michael Schumacher, Fernando Alonso, reigning champion Vettel, Jenson and Lewis had been guiding their mega machines along. 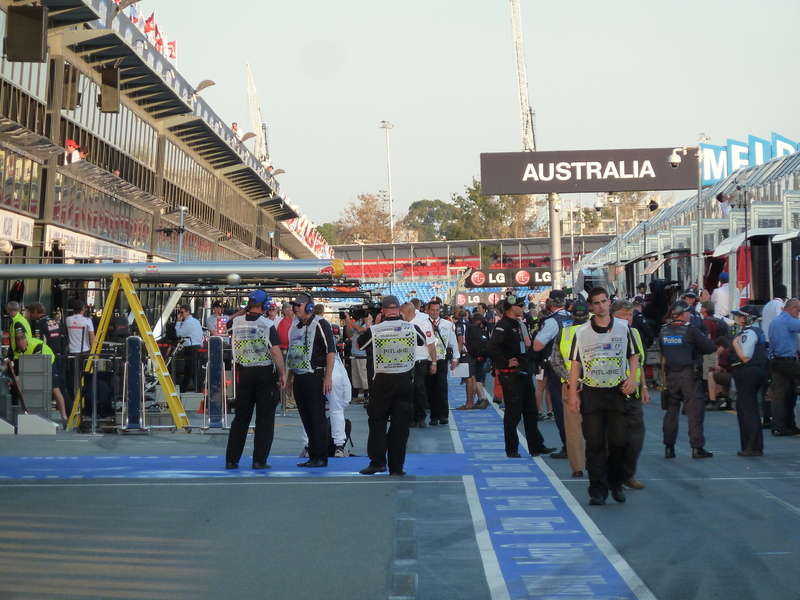 The skid marks were still fresh, the smell of burning rubber was still in the air, and as the sun began to set, I watched as the F1 teams in their garages began packing away their travelling circus. 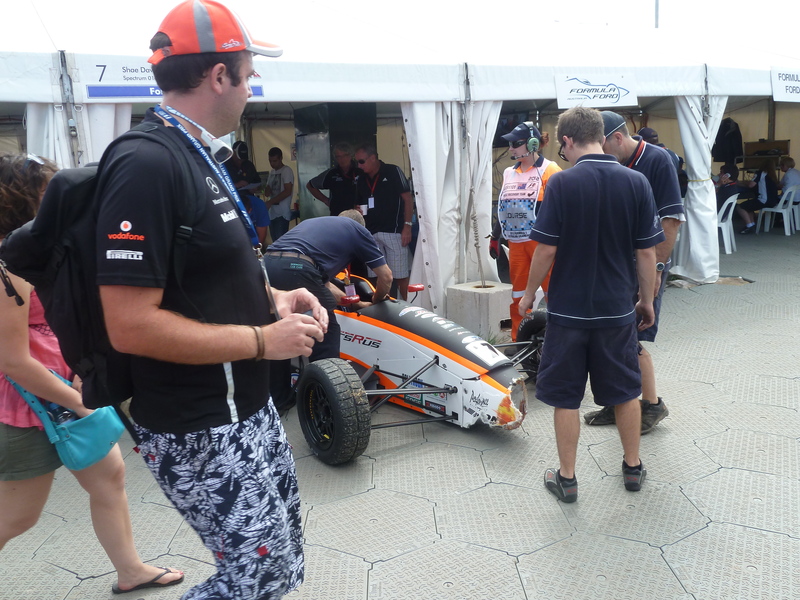 Further along, scrutineers were still picking over the cars, analysing them to check they fall within racing guidelines. 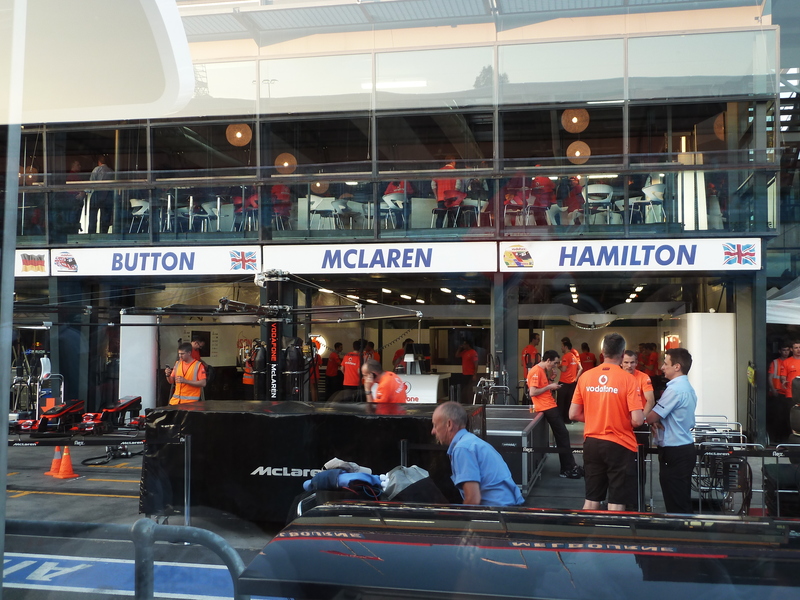 Jenson’s Mclaren was still in one of the garages, fresh from its winning race, while on the other side of the fence, just two metres away from me, Alonso’s bright red Ferrari was still making a range of clicking noises as it cooled down. Soon it too was put onto a trolley and rolled into the bay where it was weighed and measured. It’s the sort of stuff you would never see on the television, and interestingly, it was something you would hardly ever see at Silverstone. Because the race is at the end of the day in Australia, people are almost encouraged onto the track at the end, something that you definitely can’t do back home. It provided a whole range of photo opportunities, and I joined the scores of others capturing great shots on the track – including in the pole position spot where just a couple of hours ago, Jenson Button had lit up his tyres and headed off towards my vantage point, and ultimately, the first win of the season. 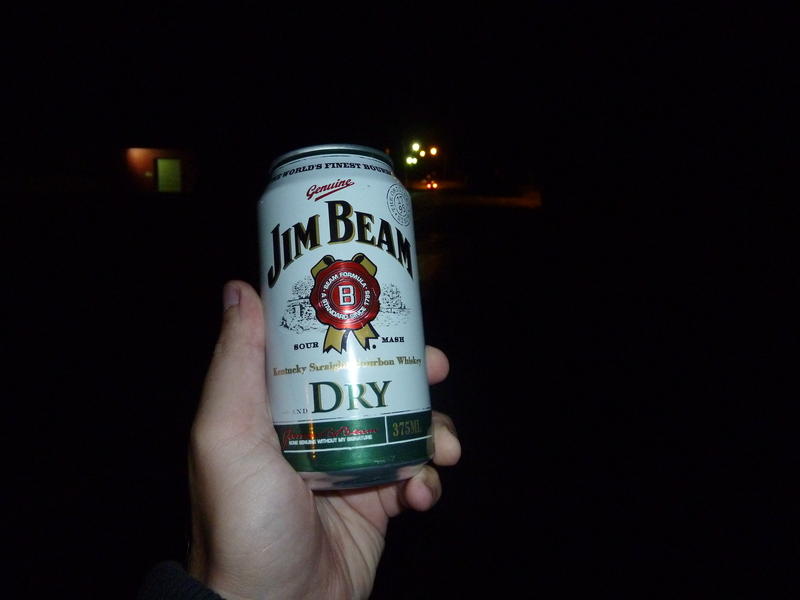 As darkness fell, I picked up a souvenir to take home – quite literally. If you watch F1 on the television, you often hear commentators talking about ‘the marbles’ at the side of the track, the small pieces of rubber that fly off the huge tyres as they wear down. 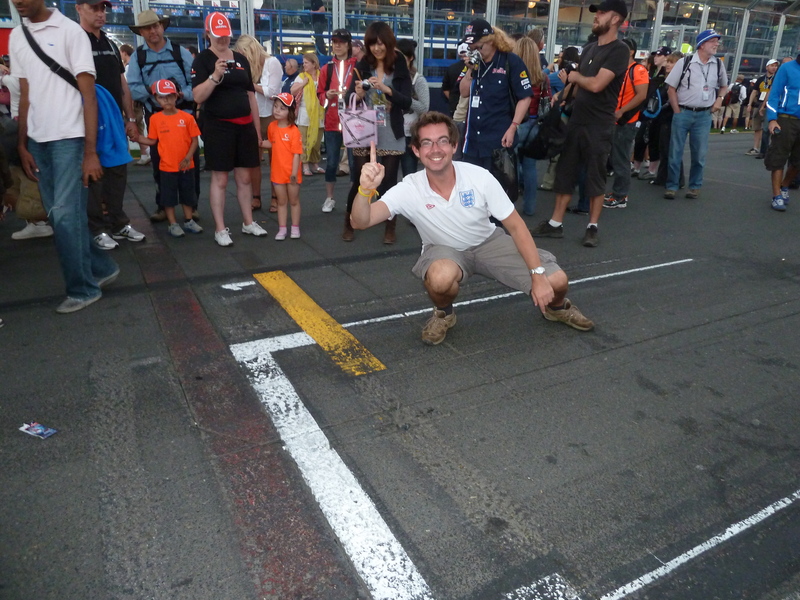 Before I left the track, I bent down to peel a few bits off the tarmac, and gathered a few loose bits at the side of the straight. 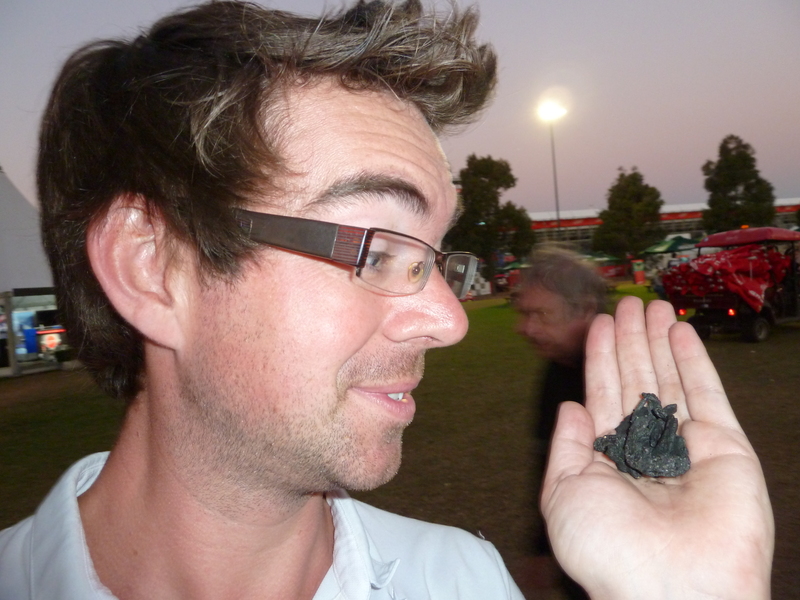 Gathering some free souvenirs...F1 tyre rubber! They had a similar consistency and feel to Blu-Tac, and I put a small handful into my pocket. It’s yet another unique souvenir that for me, money can’t buy. It’ll go home with me, and take up a place with other bits I’ve picked up around the world, like my bullet casing from HMS Grimsby when I sailed onboard in the Gulf, volcanic rock from the Canaries, sand from the Normandy beaches and various other keepsakes. Some might call it tat, but for me, every item has a story behind it. A bit of rubber to take home! 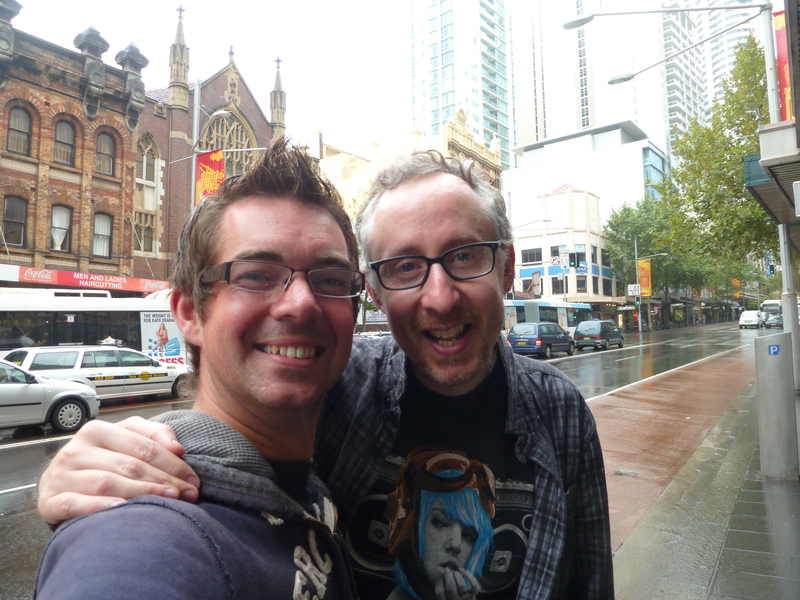 Ian and I walked to the tram stop, still catching up on what we’re both up to and talking about the days events. Next week, the Grand Prix will happen all over again in Malaysia, with yet another audience of millions around the world. Its one thing watching on the television, being lulled by the constant hypnotic sound of the engines as the whiz around the track, but it’s an exhilarating, exciting and thrilling day to see the world’s best drivers fly past your eyes, almost within touching distance. Next year, and for years to come, I’ll be watching the sun-drenched spectacle from the opposite side of the world, probably huddled in front of a fire away from the cold outside, and no doubt remembering the time ‘I was there’. Sometimes Mother Nature reminds you who is boss. And more often than not, she wins. And so, seemingly running for my life away from a giant wall of water that was bearing down on me, I suddenly felt very small. As I’m running, my friends on the beach are laughing and pointing. I glance behind me, and the backwash is swirling upon itself, building into a huge blue and white frothing mountain, getting ever closer to my heels. To my right, a French guy has already been consumed by the watery mass charging at the shore, his feet disappearing into the froth. 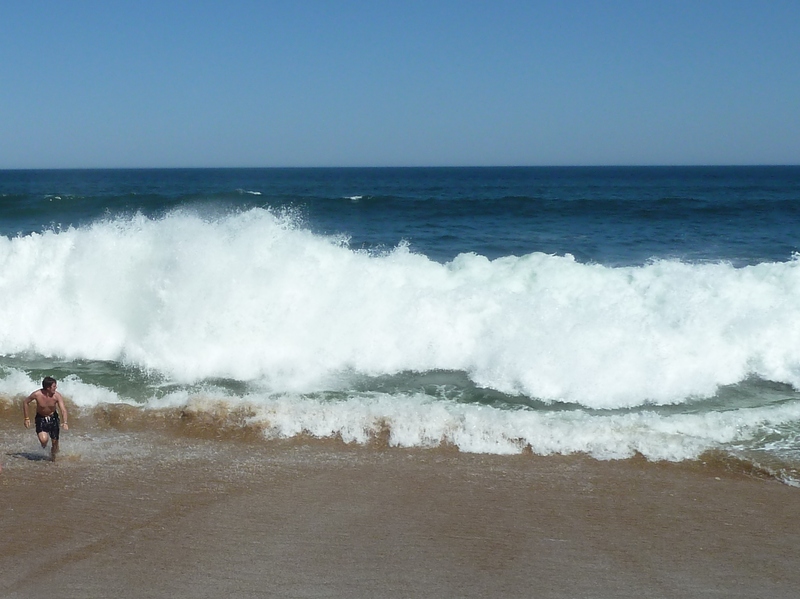 By now, a huge wave has formed, about twice my height, and there’s nothing I can do to get out of the way. Whooosh. I’m dumped down to the hard, gritty beach and within seconds, I’m washed up like a ragdoll at the feet of my friend Jess. We all laugh, I get up, dust myself off and run back down towards the sea. The process repeats itself all over again, and I love it. 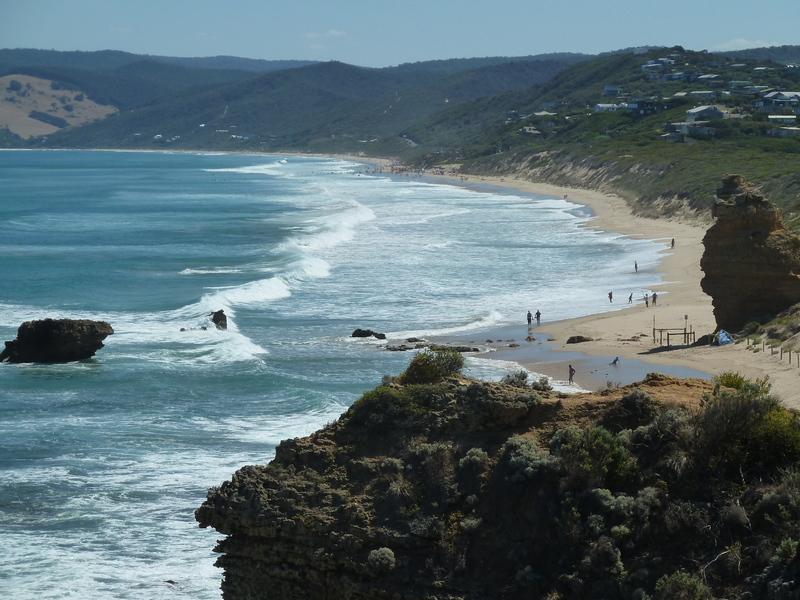 We’re at Bells Beach, part of the famous Great Ocean Road area and home to the Ripcurl Pro Surfing Championship, such is the quality of waves that pound the beach here. It was the end of a brilliant day of getting out of Ballarat and seeing a bit more of Victoria. I’ve been in Ballarat for a couple of weeks now, settling into a routine of waking up, doing some housework for Nat, having lunch together when she returns home for her break and then being dropped off in town for the afternoon as I go in search of places with decent internet. Not that there are any – if there’s one thing I have now realised, it is that this country’s internet seems light years behind every other country I have been to so far. Very few places have free Wifi, apparently due to few companies offering unlimited data deals to businesses, and when you do find one of those that do offer some form of internet, the quality is usually slow and poor. Take McDonalds, where in return for a dollar cheeseburger, I can sit and use the internet. Except its painfully slow and only offers a 50 megabyte limit – no good for trying to upload countless photos and blogs over the next few months. 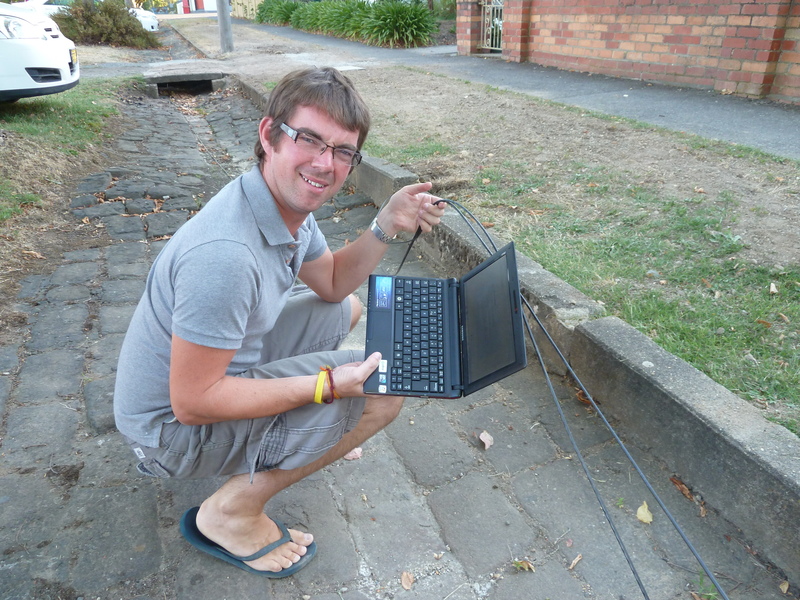 Investigating why Australia's internet is so bad...flimsy rubbish wires laying in the streets could be the answer! Thankfully I found a bar called Seymours, which not only provided some of the least temperamental wifi I’ve found here so far, but also serves a mean lemon lime and bitters (the addiction is still going strong) and it’s a relaxed place to hang out and work my way through a blog backlog. While Nat has been at work, I’ve also been spending a lot of time with her best friend Jess, her 12-year-old daughter Liv and friend James. It was on one of our trips out together that I found another way to occupy my time in Ballarat. Jess was treating me to coffee at a great little restaurant and bar called The Lake View, which, funnily enough, has a great location overlooking Lake Wendouree. While we were enjoying a latte, Jess began speaking to the owner and manager, Nathan, who she knows. Suddenly she asked if he needed any help around the place, and then pointed straight at me. That’s when he asked what experience I had and asked if I could come in the following week for a shift. I agreed – it would be great to do a bit of hospitality work again, even if it is just for a few hours. There was a catch though – in order to lift a finger in the restaurant, I had to complete a compulsory course. 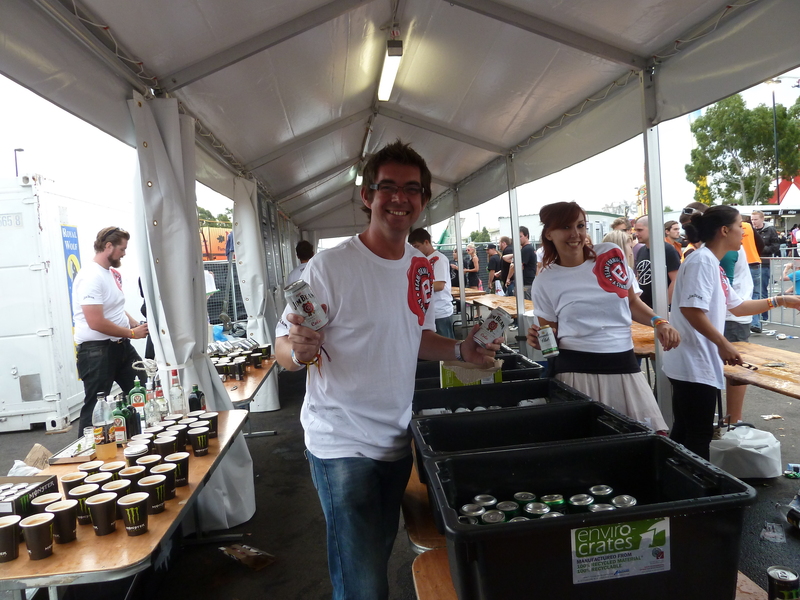 Whether I was volunteering or working full time, anyone in Australia who serves alcohol has to complete an RSA, the Responsible Service of Alcohol certificate. 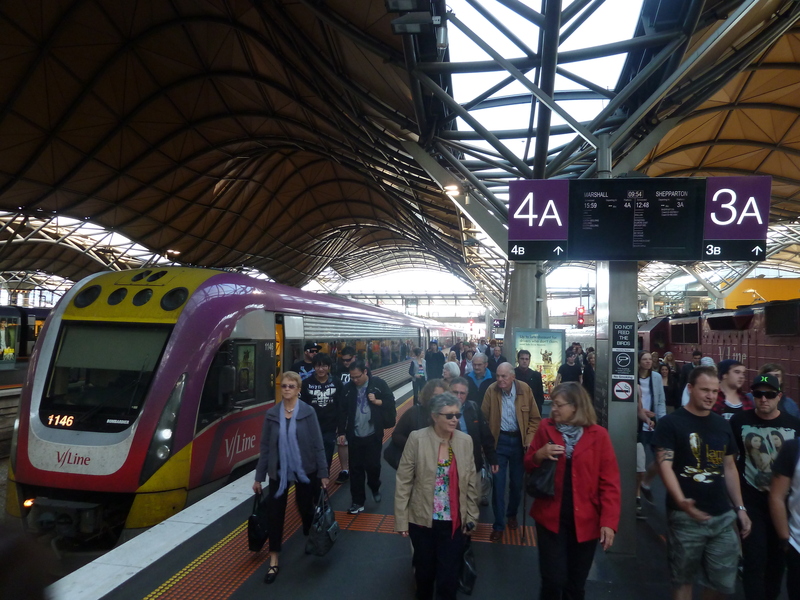 It meant a trip back to Melbourne where I had found the course for $40, and so caught an early morning train to the city. I made my way on the tram to a training centre to the east of the city, and took my place in a lecture room. 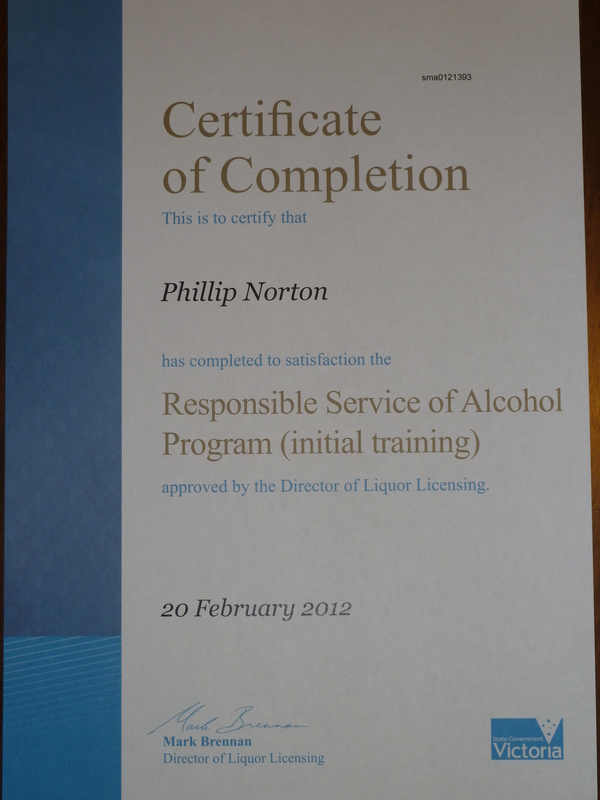 In a nutshell, the course taught me all about how to spot if someone has had too much to drink, how to deal with intoxicated customers, how to avoid conflict and the Australian laws and regulations when it comes to legally serving the amber nectar. As a result, I learnt how the state of Victoria is currently home to 13,000 people seeking treatment for alcoholism, how more than 3,000 people died of alcohol-related injuries between 2009-2010, and how the drink-drive limit is surprisingly lenient compared to the UK. A basic rule of thumb is you’re allowed one alcoholic drink an hour before getting into a car. Far from scientific. After being awarded my certificate, I got talking to a girl called Esther. We spoke about our travels and the work she was doing, when she told me there was an upcoming music festival that desperately needed more workers. In return, you got into the festival, but also got a bit of pocket money too. It sounded like a great thing to do, so I put my contact details into her phone, and that night I got an email from her, along with contact details for the staffing manager at the festival. 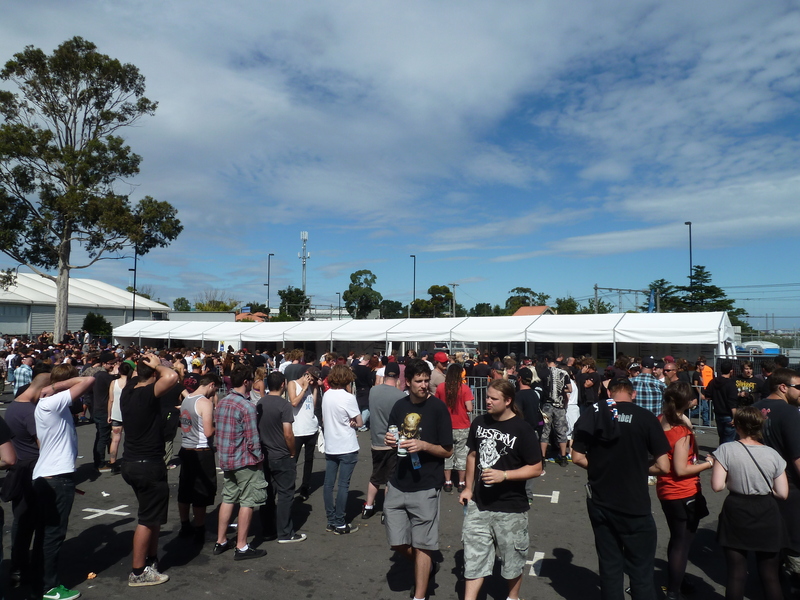 A quick email later, and I had myself a place working on a bar at the Soundwave Festival in a few days time. 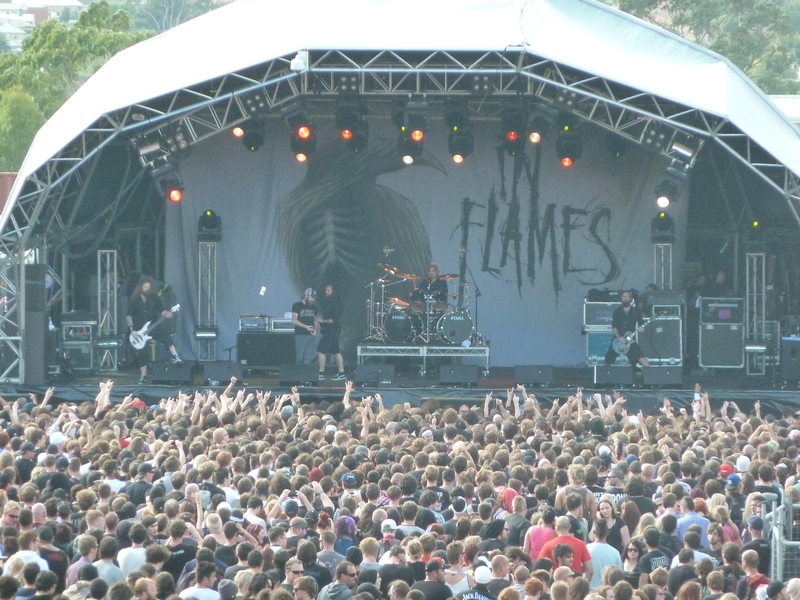 It was in Melbourne, with acts such as Slipknot and Queens of the Stone Age topping the bill. 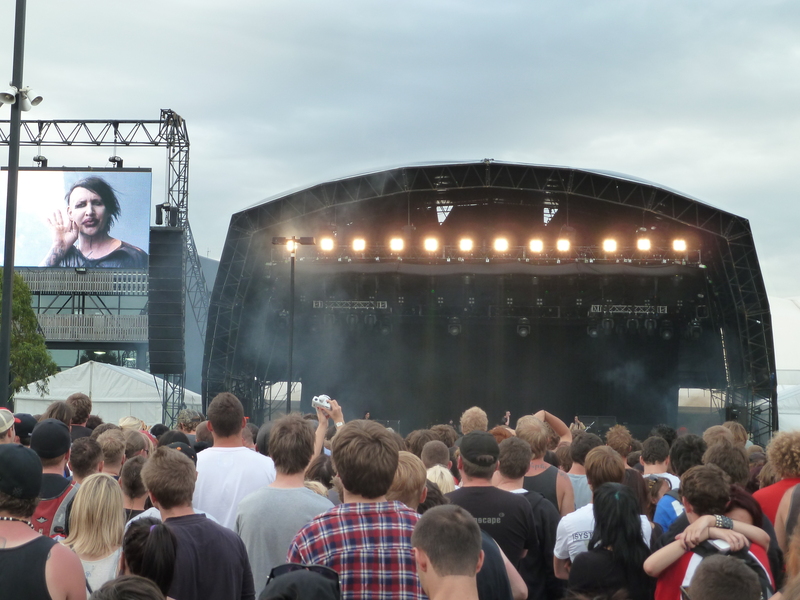 It’s a bit heavy for my liking, but after working at and reporting on quite a few Leeds Festivals over the years, I know it will have a great atmosphere either way. It will be yet another experience to take home with me, and already I’m looking forward to it. 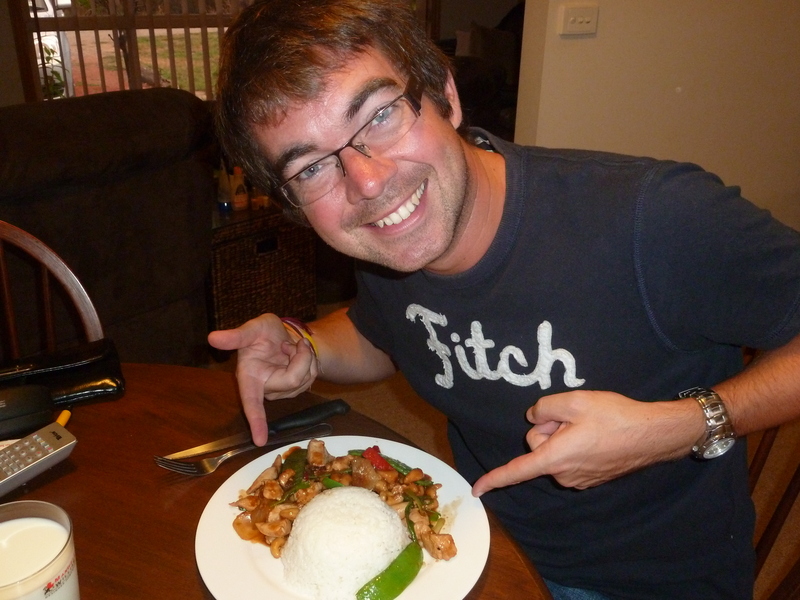 Putting the Thai cooking skills to the test! 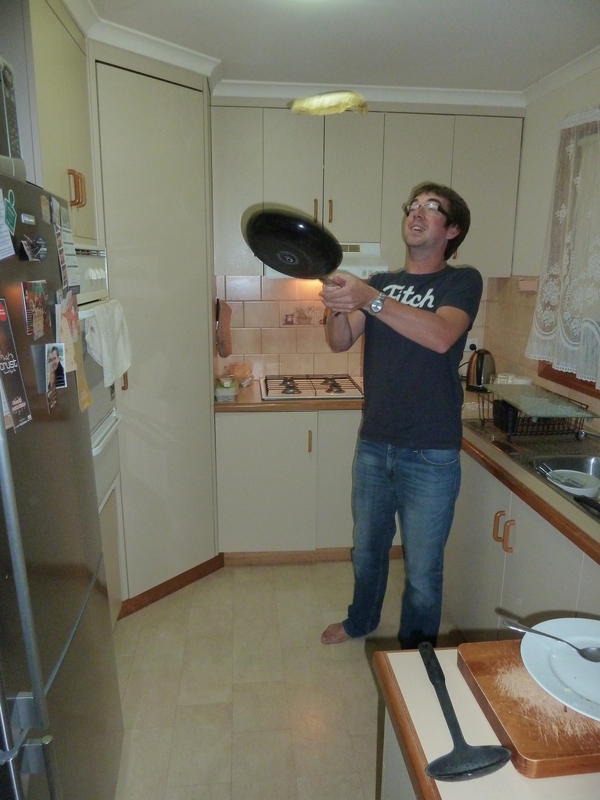 Back in Ballarat, it was pancake day, and I took the opportunity to cook for Nat. I put my newly acquired Thai cooking skills to the test, with a delicious meal of Chicken with Cashews that seemed to go down a storm. Surprisingly, it tasted exactly the same as the one I made at the Thai cooking school in Koh Lanta a few weeks back, and Nat wants me to make it again sometime. It was followed by some pancake fun in the kitchen, and introducing Nat to the all time favourite topping of lemon and sugar. Its not a big combo in Australia, but I think she liked it! 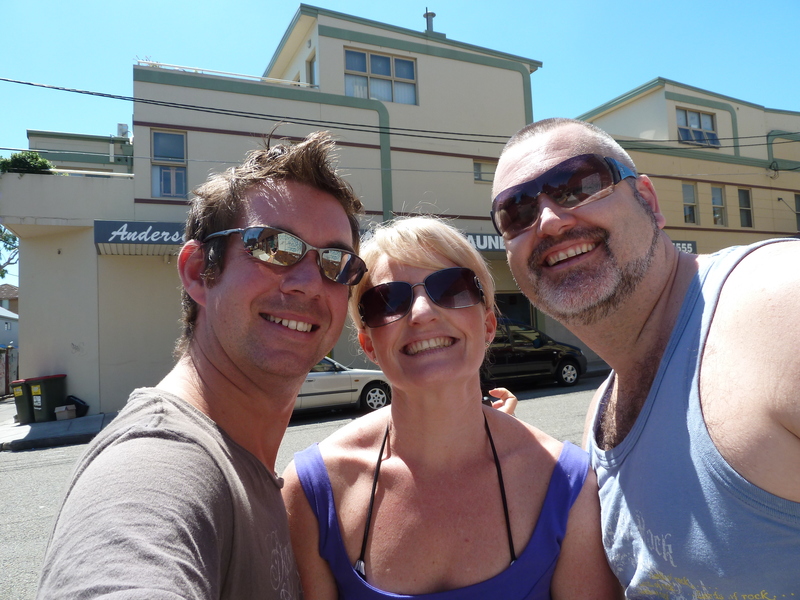 And so, with a weekend of scorching hot sun upon us, we agreed to go see a bit of Victoria. 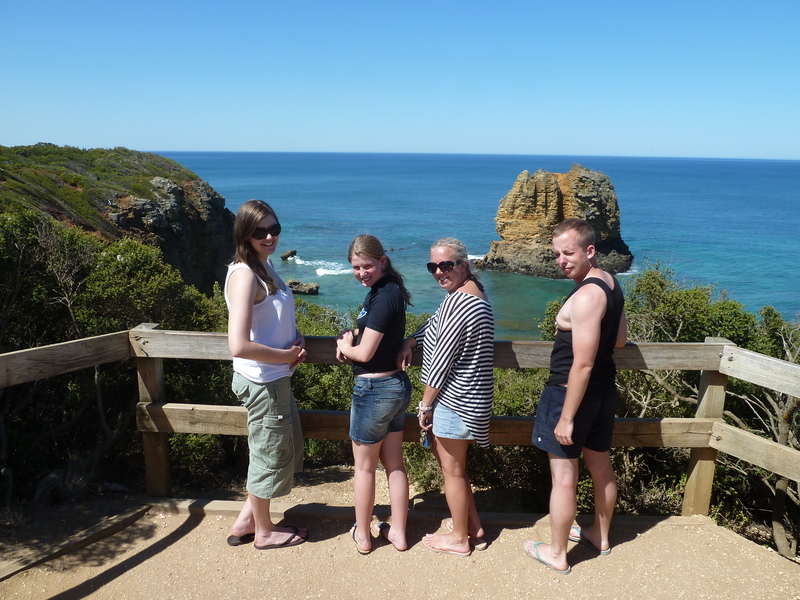 We jumped into Jess’s car and headed to the beach, stopping first at Torquay. Jess’s mum has a house there, so we parked up and headed to the sea. With temperatures reaching above 40-degrees, the sand was red hot. It made the walk to the sea more of a sprint, and even though the ocean was freezing cold, it was very welcome to cool off by the time we reached it. 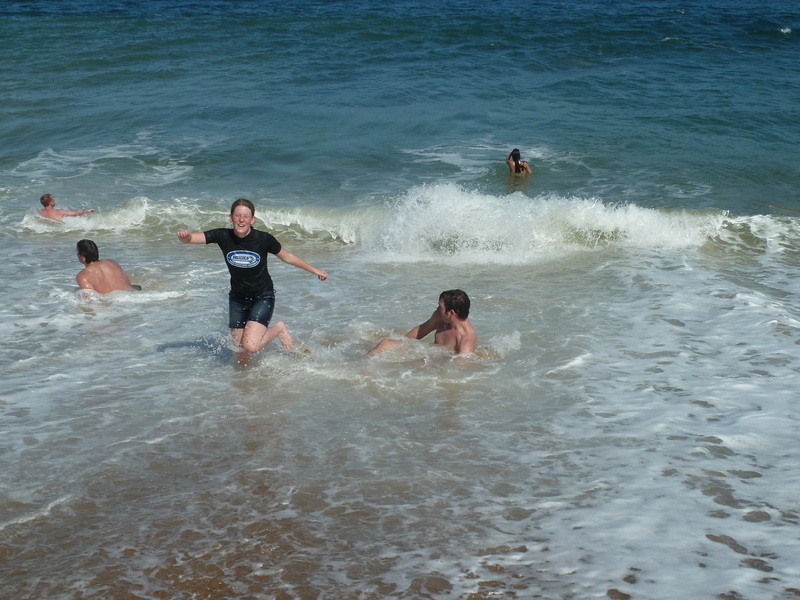 Perhaps the highlight was making a 12-year-old believe she was being chased by a shark, which sounds a little cruel. Infact, it was very cruel, but it was incredibly funny too. 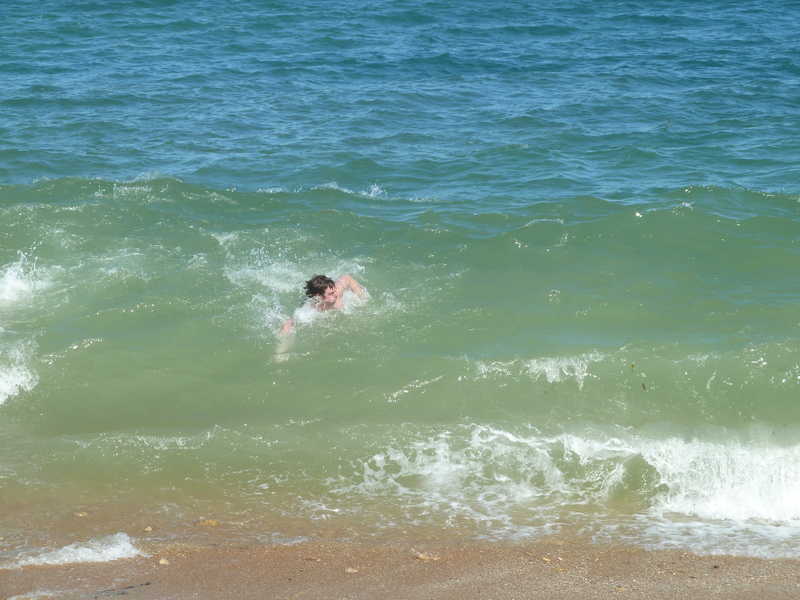 James had simply shouted “Liv, is that a dolphin fin,” which then produced one of the most blood-curdling screams of terror I’ve ever heard, followed by some speed swimming that any Olympian would be proud of. Thankfully, she saw the funny side – eventually – after a comforting hug from mum, and there were more smiles when the chip shop nearby failed to charge us for half of the food we ordered for lunch. There's no such thing as a free lunch...unless the shop forgets to charge you. Free food Saturday! 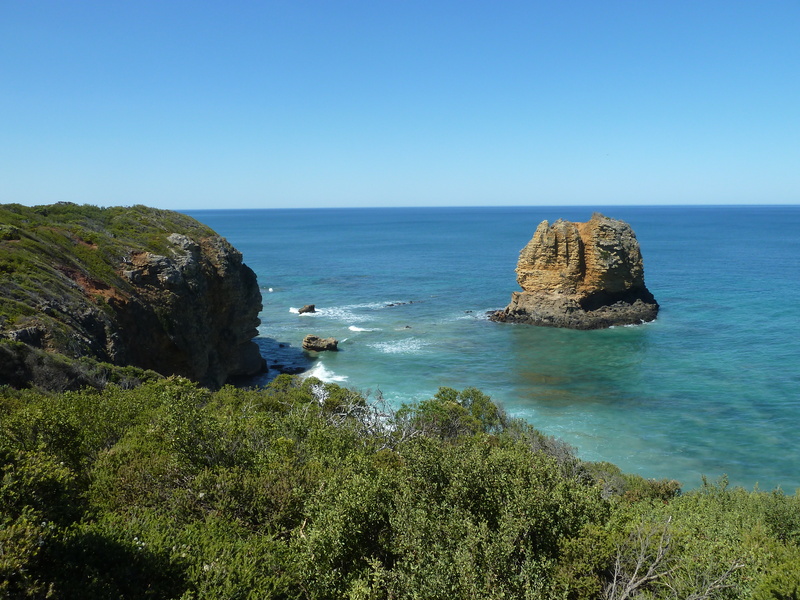 After lashings of chips, cheese and gravy, followed by chicken baguettes all round, we headed to Split Point Lighthouse and officially began driving along the famous Great Ocean Road. Its actually a fairly famous lighthouse, immaculately looked after and maintained, standing out like a bright white beacon against the deep blue cloudless sky. Have you ever, ever felt like this?! 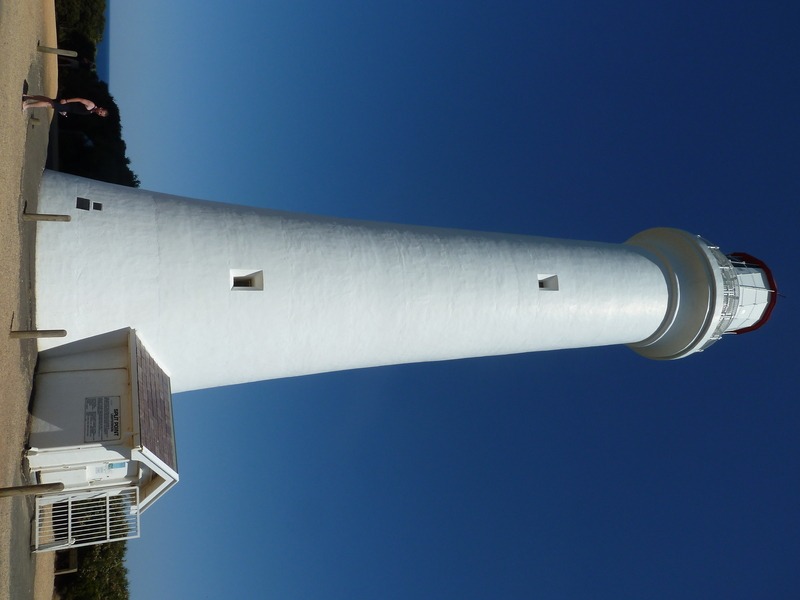 For anyone who remembers the childrens show Round the Twist from years back, it’s the lighthouse that was used in the show. Its also appeared in other films and series, mainly due to the beautifully picturesque setting it finds itself in. Located high above rocks and cliffs, the waves below crash all around, while there are stunning beaches everywhere you look on the horizon. We spent a good half an hour taking in the views together, and I made a mental note to return here with my friends in a few weeks time. 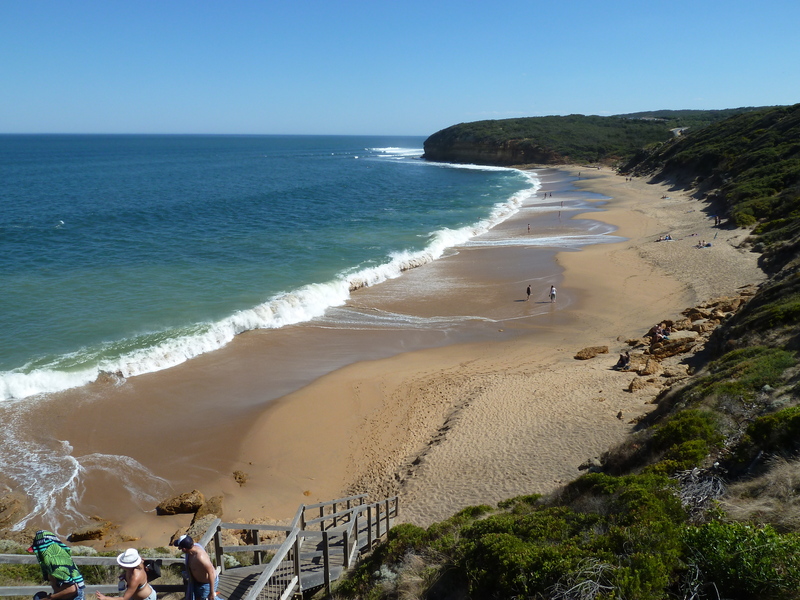 The next stop was Bells Beach, a place where James had been raving about and was getting him slightly excited as we got nearer. We soon found out why. From a viewpoint high above the beach, we watched as huge waves rolled in from the ocean and crashed onto the sand. 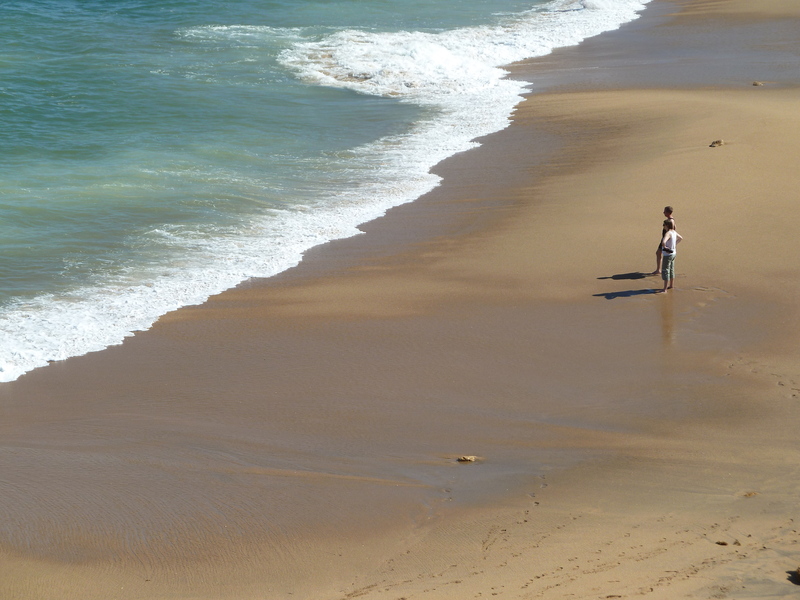 In the midst of the white surf below, small figures were leaping over the waves and being washed up onto the sand. Surfers were bobbing around on the swell, waiting for another roller ride to shore on, while others were simply watching in awe at the sheer power of nature. James and Nat walked down to the beach and before long, James couldn’t resist the urge of jumping into the foaming mass himself. The rest of us walked down the remaining steps and watched for a while. 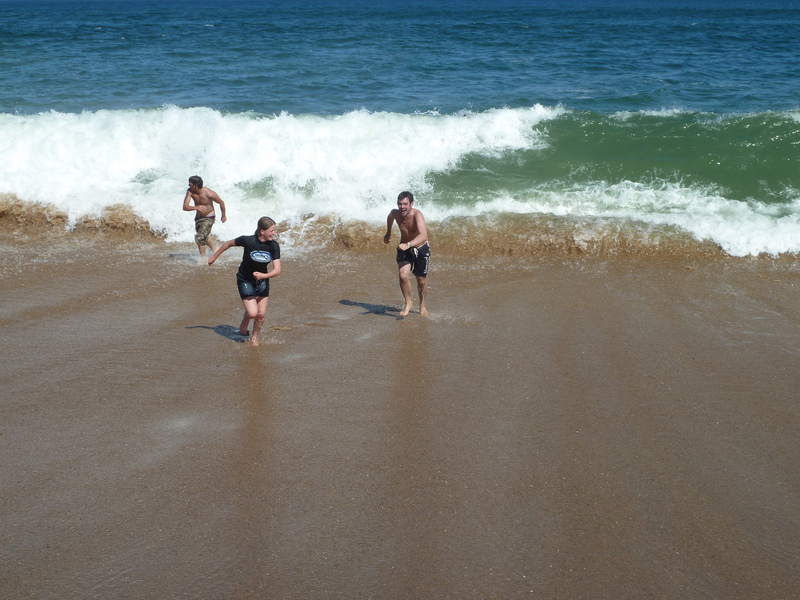 I must admit, while slightly dangerous thanks to numerous rip tides bubbling away, it did look like a lot of fun. 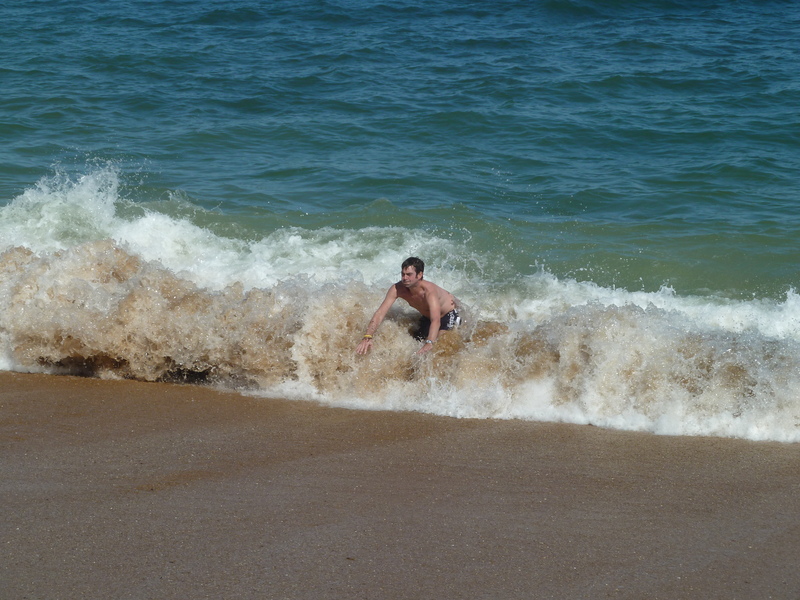 James had already got a few grazes from being rolled along the gritty sand by a few waves, and soon a huge wave crashed to shore, sending water far, far up the beach. As it swirled around my feet, I could feel the power of the wave pushing against me, swiftly followed by the strong pull of the water as it rushed back down the steep beach and back into the sea. It wasn’t long before the t-shirt was off and I was nervously bounding down towards the water with James. Its probably one of the most exhilarating things I’ve done on my trip, launching myself into the biggest waves I have ever seen and not knowing exactly when I would see the surface again. I admit, it was pretty daunting to see each wave rapidly growing behind me, and there were a few times when I wondered whether I’d pushed it too far, but there were a few others doing the same, and everyone else had huge smiles on their faces. 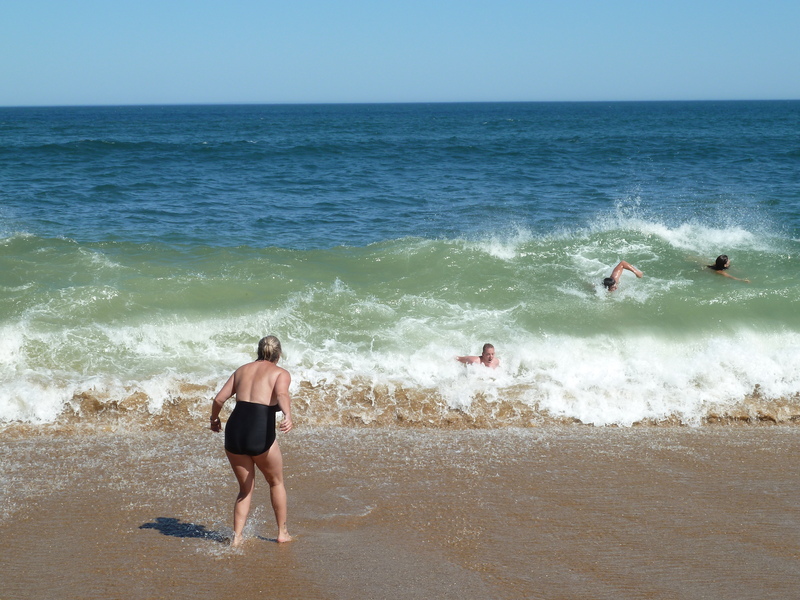 It did feel a bit like being slid along the roughest side of a cheese grater when the wave washed you along the sand and dumped you onto the shore, but there was something slightly addictive about it. The gravel rash would heal, but the memories would stay with us all. Heading for a bit more gravel rash! 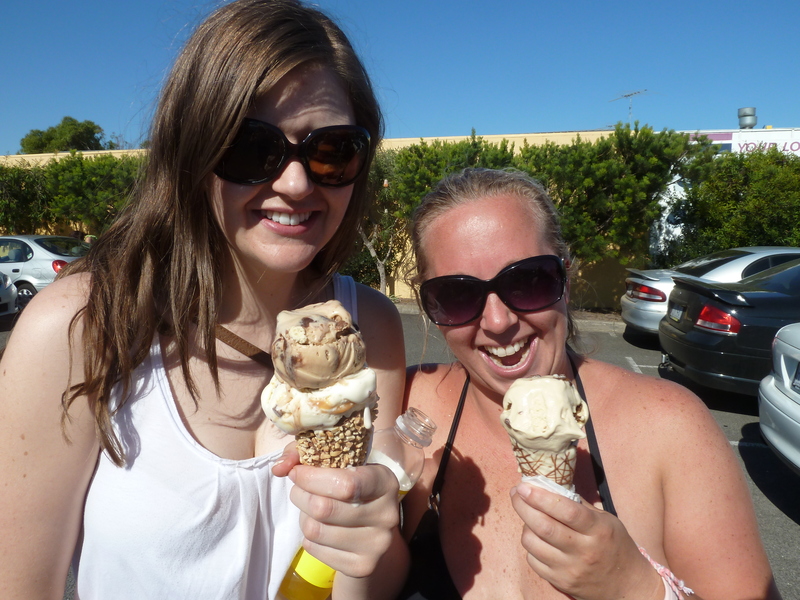 After a brief stop in Torquay for ice creams, we headed off back to Ballarat. 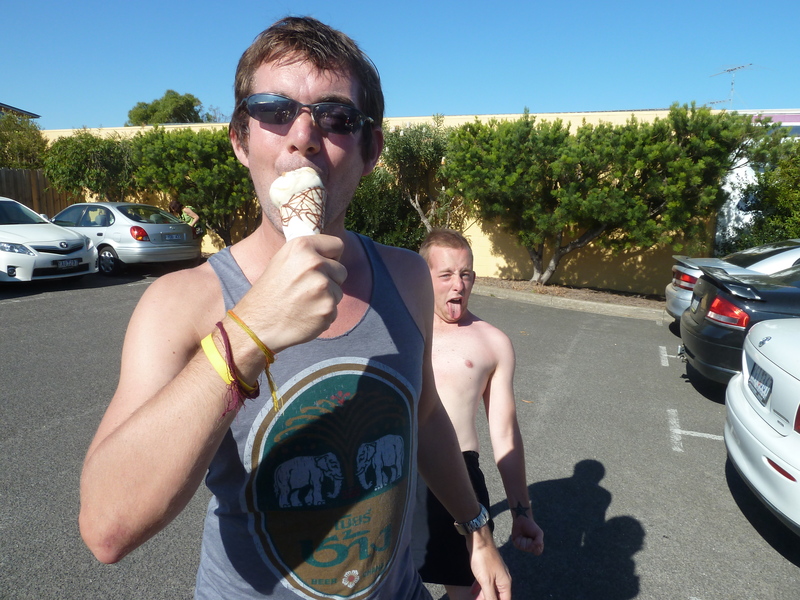 Our shorts – and various parts of our bodies – were full of sand, the ice creams had dripped everywhere in the heat and there were varying degrees of dehydration, but it had been a fantastic introduction to the Great Ocean Road, and a sign of yet more great times to come in Australia. There's always one in the background! 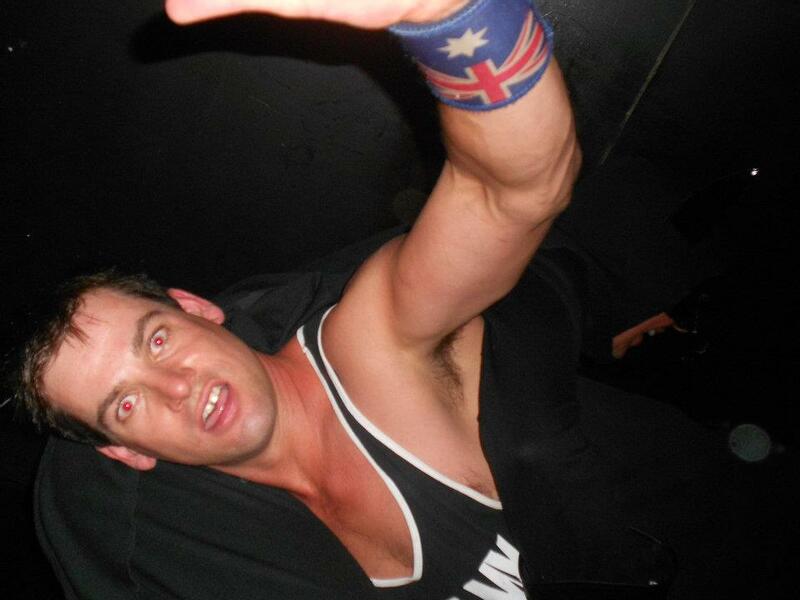 Its my first night out in Ballarat. I’m with a friend who I have known for years. I could be about to spend a month or so in the city, and i’m meeting her friends for the first time. I’m conscious of first impressions. 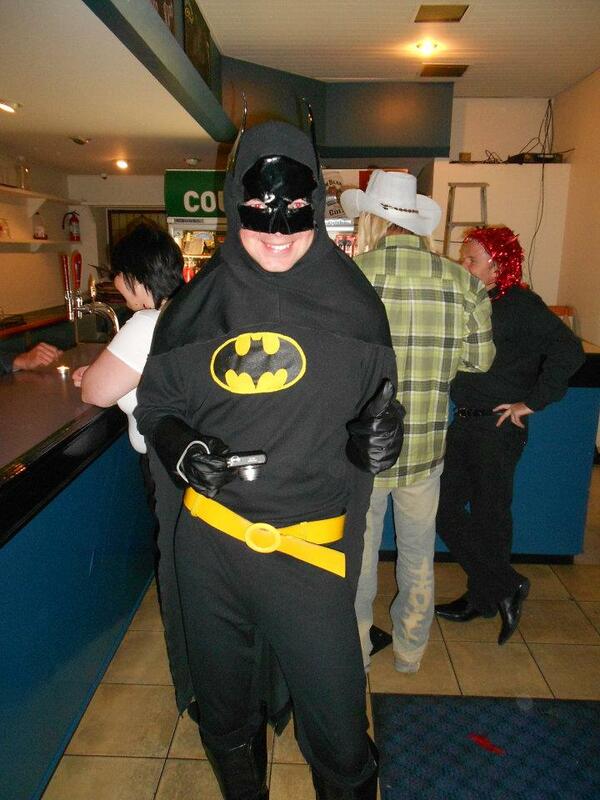 And I’m dressed as Batman. 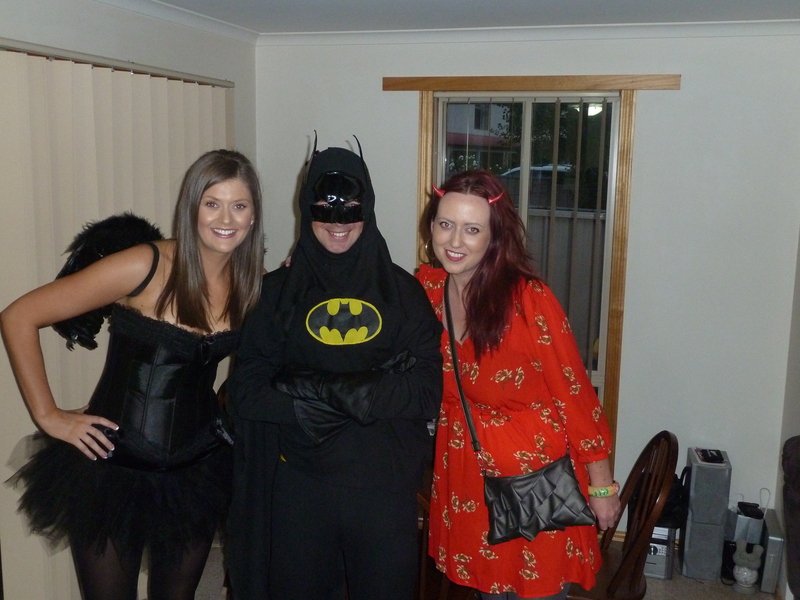 With Nat (left) and her friend Koa before heading out for some superhero antics! I’ve arrived in Ballarat, a city around 110km northwest of Melbourne, site of a huge gold rush in the 1800s, famous for the Eureka stockade, the only armed civilian uprising in Australia’s history, and for being the home of Steve Moneghetti, the nation’s most famous Olympic marathon runner. 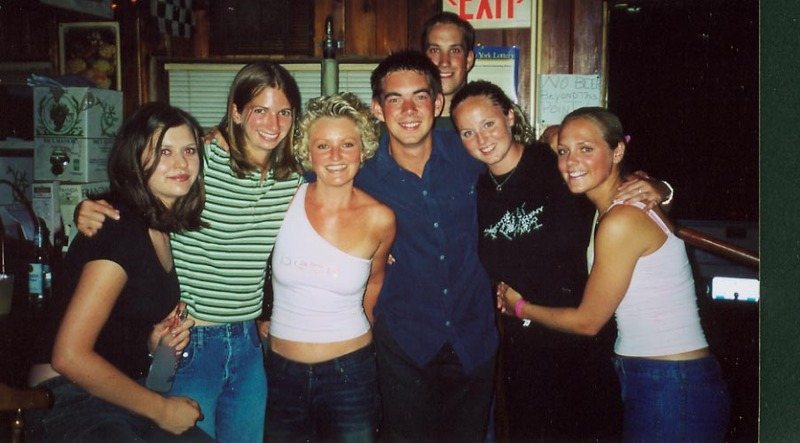 It’s also where Nat lives, a friend who I worked with for a summer on a childrens’ camp in the States back in 2002. I actually visited Nat in 2005 on my first visit to Oz, but since then we’ve only had sporadic messages on Facebook, much like many other friends who live overseas. Nevertheless, she was still looking forward to meeting up, as was I, and my visit had suddenly come earlier than planned after being let down by the roadhouse. 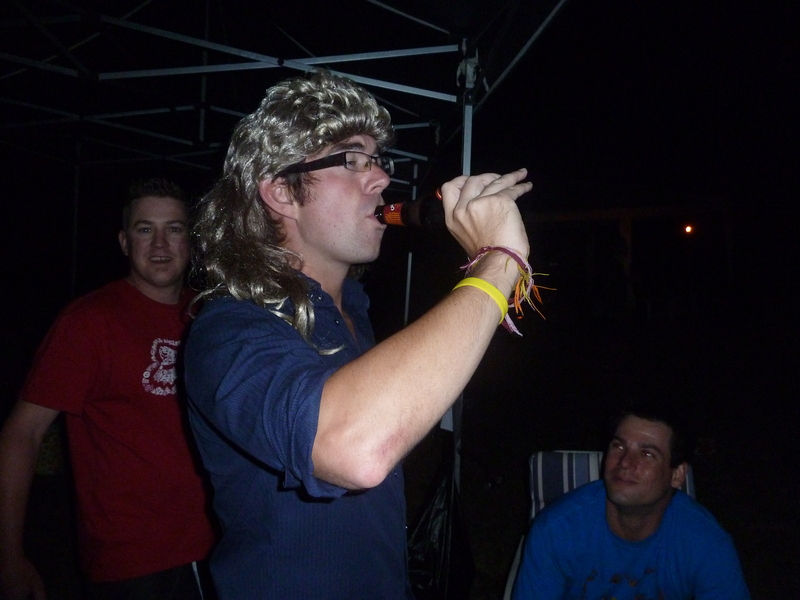 “There’s a friend’s 30th birthday party I’m heading to on Saturday night, and you’re invited. Its fancy dress – creatures of the night – I can get you an outfit,” she added. “Do your worst,” I wrote back, basically giving the all clear to make me look as daft as possible. Sure enough, it was kept as a surprise until I reached Ballarat. Nat met me in the Bean Barn, a coffee shop I’d taken refuge in next to the town hall after arriving on the train. She walked in, smartly dressed and straight from work, but she hadn’t changed a bit. It might be seven years since we last saw each other, but we immediately began chatting and laughing as if I’d been away for just a few days. We had a lot of catching up to do, mainly as we knew very little about each others’ lives over the last few years. Nat laughed about how she suddenly noticed my blogs from places like Russia and wondered what on Earth I was up to. I had no idea Nat had bought her own house, a gorgeous one at that, had changed jobs, and had also recently had a break up from a long relationship. It’s the kind of stuff that close friends know all about each other, yet we had no idea, but somehow we remain the close friends we had become as we watched kids race around a go-cart track 10 years ago. To explain, we both ended up as specialist counsellors at Camp Na Sho Pa, a summer camp in upstate New York, in 2002. I was taking part in something called Camp America, straight after finishing my journalism degree in Southampton. I bagged a place after being interviewed at a recruitment fair in London, where I was asked if I could fix a lawnmower. Thinking of my dad’s electric mower back home, where the biggest problem is a lump of mud getting stuck in the blades, I said yes, and somehow got offered a place running the go-cart and quads activity. Fine, I thought, but it all got a bit sketchy on the bus when I arrived and the boss of the camp asked me if I was any good with the Honda something or other engine. 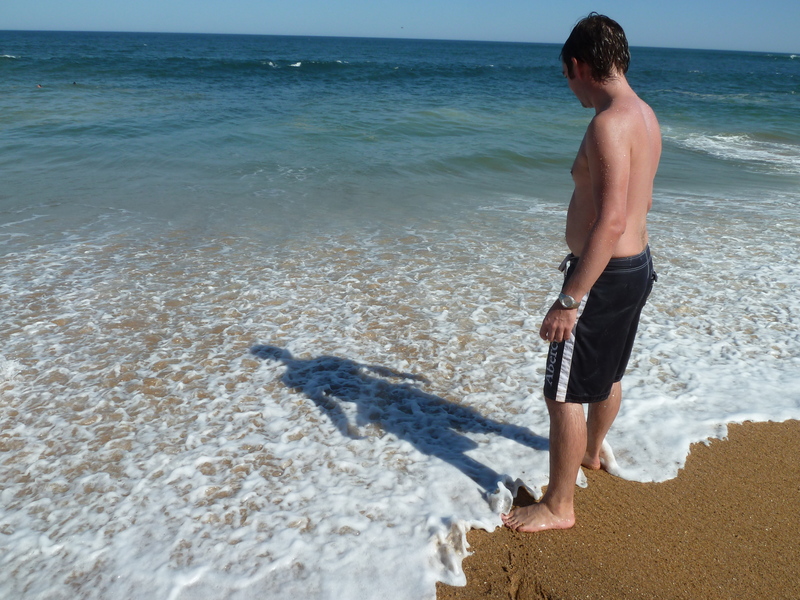 I nodded, hoping it wouldn’t see me heading straight back home across the Atlantic before I’d even arrived properly. It didn’t, thankfully, and I found myself teaching kids how to ride go-carts safely around a track, and taking groups on quad trails through some fantastic woodland in the Catskill mountains. I was also expected to strip down and repair the machines when things went wrong…but thankfully there was another guy called Mark who actually knew what he was doing with a spanner. And then there was Nat, someone who I spent a full eight weeks with laughing, joking, teasing and getting to know so well, you’d have thought we’d known each other for years rather than living on opposite sides of the world. Nat also had no idea how to repair go-carts, for she’s clearly as good at blagging as me, but we made a great team together. It might have meant us dragging Nat out of bed on a few occasions, but then she also turned a blind eye to my ‘sunbathing’ sessions on grass in the middle of the track. They were actually naps. 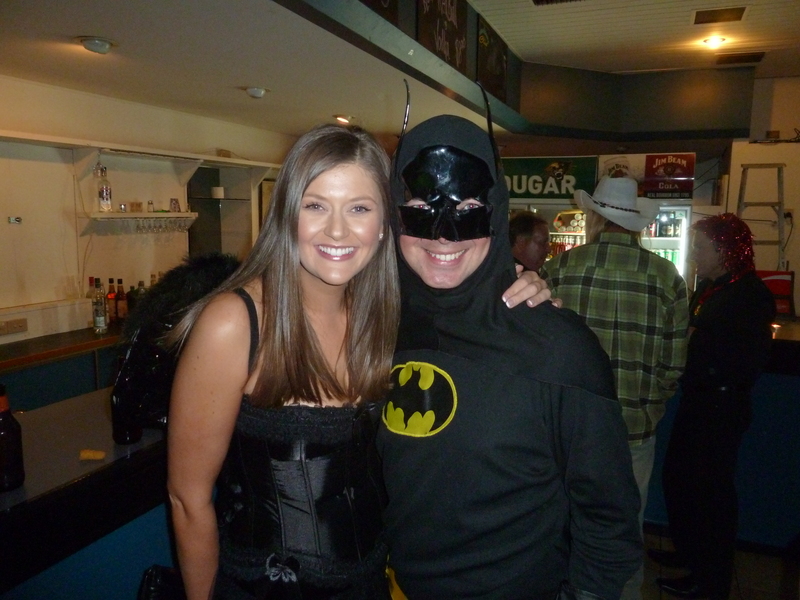 Moving on 10 years, and here I am meeting all her friends dressed up as Gotham City’s finest crime fighter. It was a joint celebration for her friends Jess and Merran, who both turn 30 within a few weeks of each other, and it promised to be a great night. Nat’s friend Koa was also staying over, and before we actually got out the ice had been firmly shattered thanks to a few beers and whisky. We ordered a taxi to the venue, and within just a few minutes of arriving, one of the birthday girls approaches with a question. There were a few blank faces, but back home I use a mixing desk every day. It might only be to push a couple of faders up and down while editing a story, but I guess it counts. I offered to have a look. It was a loose connection. After a few minutes of twiddling everything, moving faders around and rebooting the computer, we worked out a bright green wire was playing up. A bit of sellotape later, and it was working perfectly. I might make a BBC engineer yet. Merran and Jess hugged me – it meant they could play their own carefully crafted playlist on a USB stick, and I was christened ‘Lucky Phil’. who for the night was Freddy Kruger and took a lot of pleasure from sticking his pointy fingers up people’s noses and across their faces, and there was Jess’s friend James, originally from Northampton back home but who has been in Australia for four years and is now training to be a paramedic at the university in Ballarat. 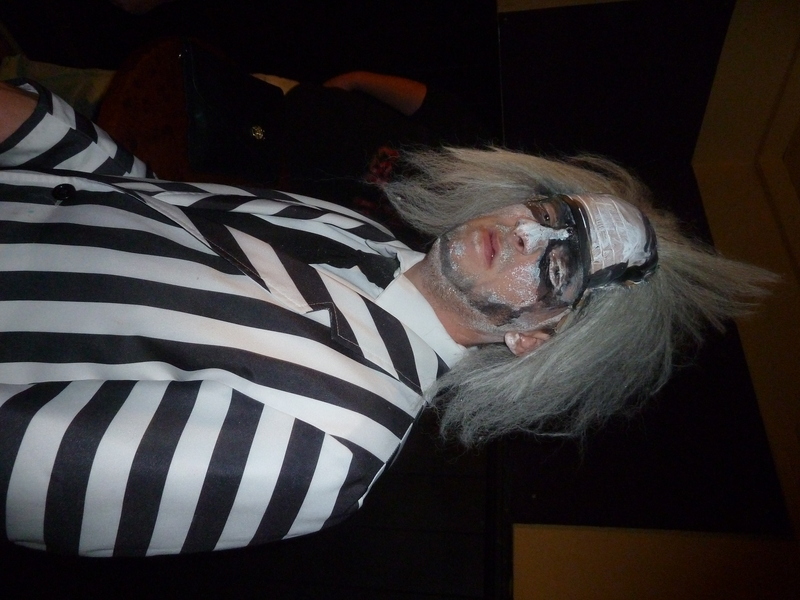 Tonight, he’s Beetlejuice. Then there’s Jane, a police officer, who was Wonderwoman for the night, there was a Catwoman, various vampires and even an evil fairy. But that was Nat, so we all knew she wasn’t too evil – at least until she decided to drop kick a mini pie across the dance floor. 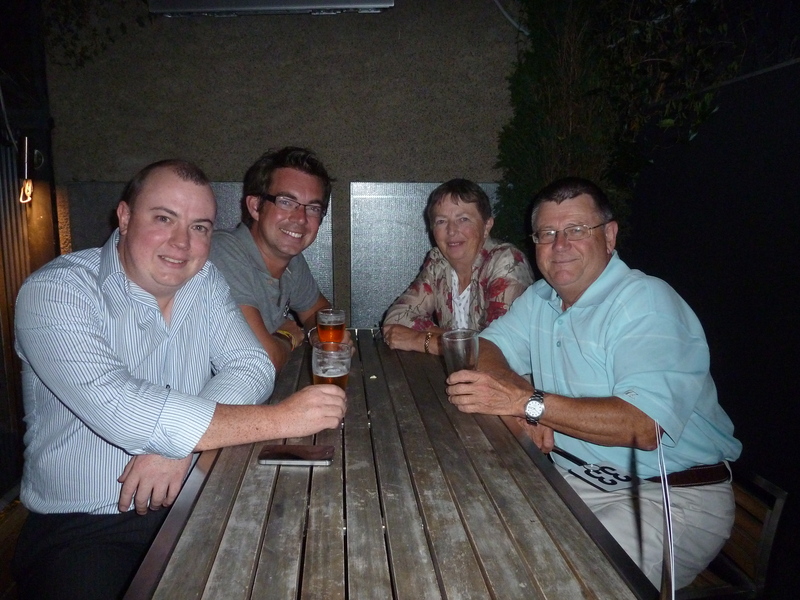 Infact, the night got quite messy, and we moved on to the Karova Lounge, one of Ballarat’s busiest nightspots. Paul, who by day is a builder and labourer, decided it would be great fun to lift each and every one of us onto his shoulder and spin us round for a while, which not only left you dizzy, but also fearing a broken neck as we got dangerously close to being dropped on our heads. Nat managed to find drinks from somewhere despite running out of money, her fairy wings getting more and more featherless as the night went on. 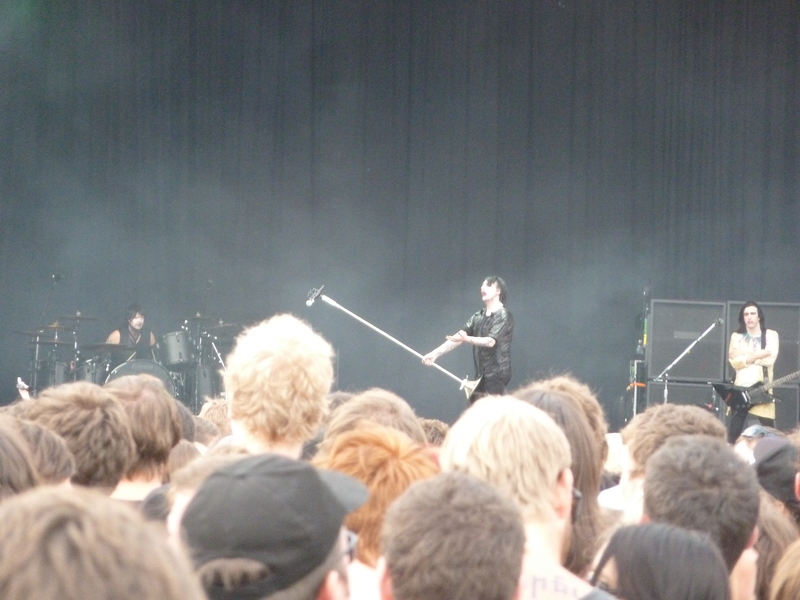 Paul tried to pull my PVC ears off. Countless strangers tried their hand at the Batman theme tune, usually accompanied by someone shouting ‘Batman’ and shaking my gloved hand. The whole ‘Batman’ thing actually provided one of the funniest moments of my trip so far, when outside the Gravy Spot, the local late night drunken food shop, yet another stranger staggered up to me and proceeded with the ‘dinner dinner dinner dinner, dinner dinner dinner…’ theme tune, complete with a few bits of half chewed chips spat in my direction for good measure. Suddenly, Nat appeared from nowhere, scrunched up her face and launched probably one of the strangest, funniest noises towards the guy that I and everyone around has ever heard. It was a cross between Tarzan’s call and a whale’s mating cry. Weird, but memorable. It was a brilliant night, and a great way of meeting Nat’s friends. And by the end of it, as we headed back at 4am, very few of them still actually knew what I properly looked like thanks to the costume, while for the next few weeks, I had an easy way of knowing who was who. “We’re just popping round to Jane’s house,” I’d be told. Cue my blank expression. Who’s Jane? Ah, it all made sense, I know exactly who Jane is. Over the next few days, I spent a lot of time with Nat, Jess, James and Jess’s daughter Liv. We all hit it off straight away, and it was as if we had all known each other for years. We’d meet for coffee, have dinner together at each others’ houses and laugh at the same things. 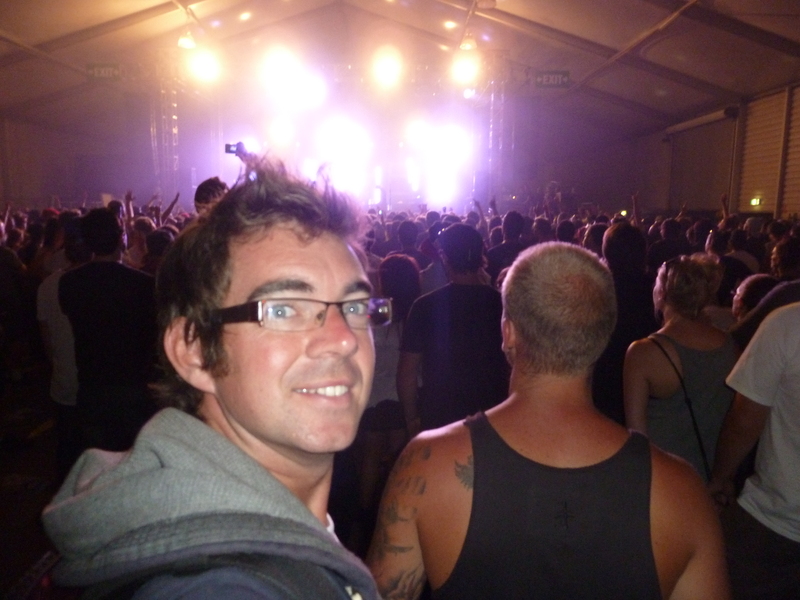 The following weekend, we were invited to the Funky February music festival in Linton, where I was able to meet most people again without my big pointy ears and yellow belt. I’d suddenly made a great group of new friends, and one where I felt at home. At the same time, Nat was enjoying my company, and said I could stay as long as I wanted as it meant she wouldn’t be at home on her own. “I’m sure you could find things to do to or a bit of work here and there to pass the time,” she said. It was a brilliant offer, and one that would mean I could stay in this part of Australia at least until my friends Matt and Siobhan arrive in Melbourne at the end of March. In the meantime, and in full appreciation of Nat’s generosity, it was my duty to earn my keep around the house – and so I got my domesticated head on for the first time in quite few months. 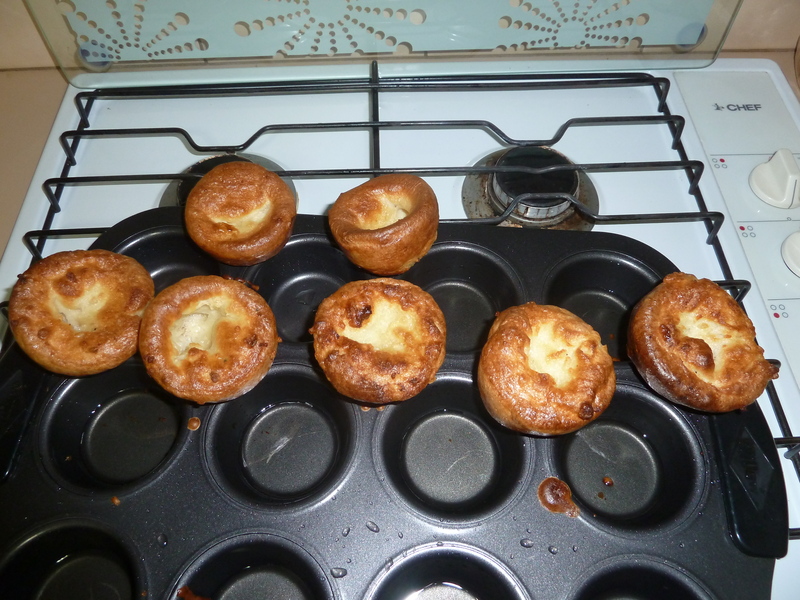 Yorkie puds...introducing Aussies to some proper food! With that in mind, I introduced Nat to a few things from home, namely Peter Kay, The Inbetweeners, Yorkshire pudding and a couple of my desserts I’ve now perfected. They have all gone down well, especially the Yorkshire pudding and strawberry and vanilla pana cotta. I’m yet to make a cheesecake, to go along with a certain comedian’s catchphrase I have now managed to get caught on Down Under. In return, I was introduced to a few Aussie staples – Nat’s homemade chicken parmagiana is incredible, being a whole chicken breast, beaten flat, crumbed and then covered in a special tomato, bacon and onion sauce, and finished off with a good helping of cheese. I’m not a salad fan either, but I could eat hers, scattered with snow peas, roasted pumpkin and beetroot, until the cows come home. One of many Lemon Lime and Bitters so far. 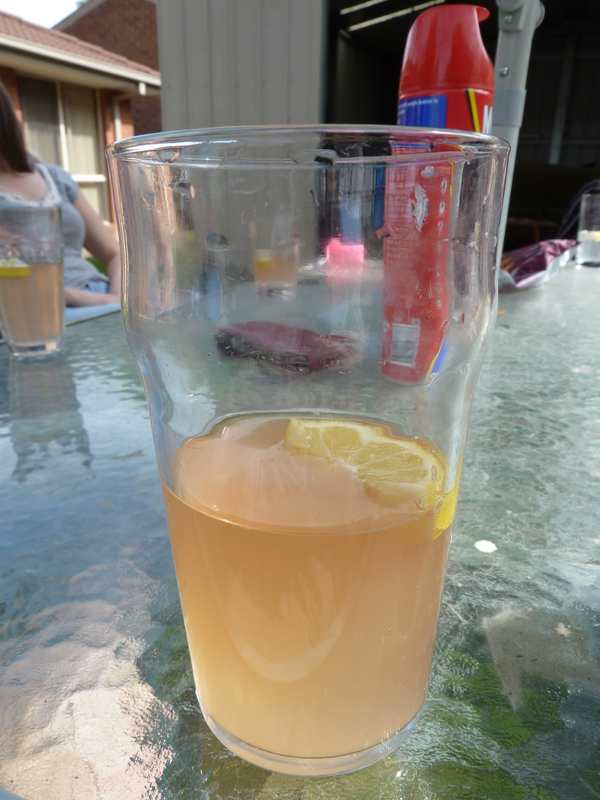 Then there’s lemon, lime and bitters – a drink that has suddenly knocked the usual Coke off my favourites top spot. I’ve never had it before, and infact, never heard of it before back home. Over here, its almost a way of life, with a bit of lime cordial, filled with cloudy lemonade and then a few dashes of Angostura Bitters. As a certain Peter Kay would say, it’s a taste sensation, and one that I found myself hooked on. Refreshing, summery, almost alcoholic tasting, its definitely a drink I’ll be stocking up on back home. I’m assured it’s not even a girly drink. Time will tell. Then there’s a couple of combinations I was introduced to – aside from sweet chilli and sour cream together, a big Australian dip combo (at the same time – try it!) I was given a piece of toast with both peanut butter and honey on. At first, the whole idea of both on a piece of toast just seemed a bit odd, but then I tasted it. It shouldn’t, but it actually works! There was also the usual Vegemite / Marmite argument, as to which was better. Naturally, Marmite wins hands down for me. Aussies claim not and defend Vegemite every time. It might taste similar, but the consistency is all wrong for my British tastebuds. 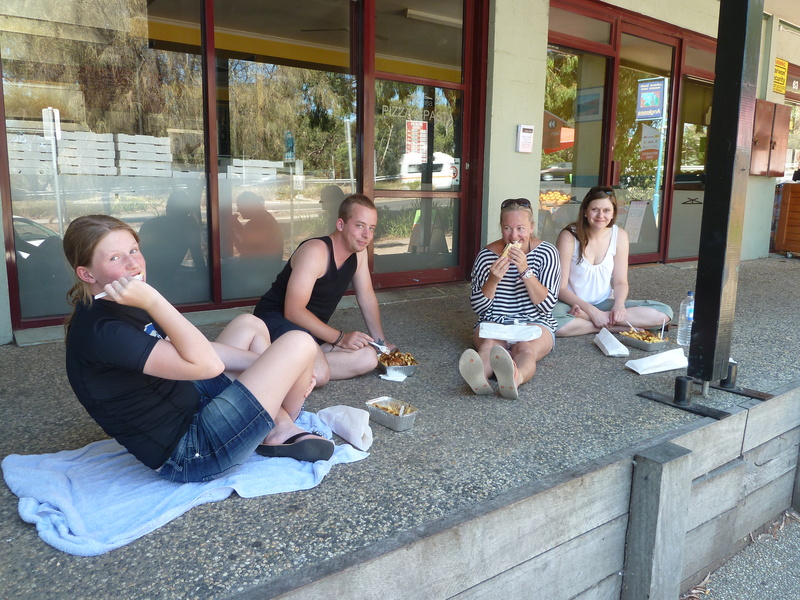 These Aussies just don’t know how good yeast extract really can be! In any case, it’s the nearest thing I can get to it, so there’s been plenty of Vegemite and cheese sarnies to keep me going. And I’ve needed them to keep me going – I have been doing plenty around Nat’s house in return for the roof above my head. Mountains of washing up have been disappearing for her, there’s been a fair bit of cleaning up around the house, and on one hot sunny day, I got busy with a pick axe and shovel in the back garden to dig out a flower bed and vegetable patch that she’s been wanting to get sorted out. 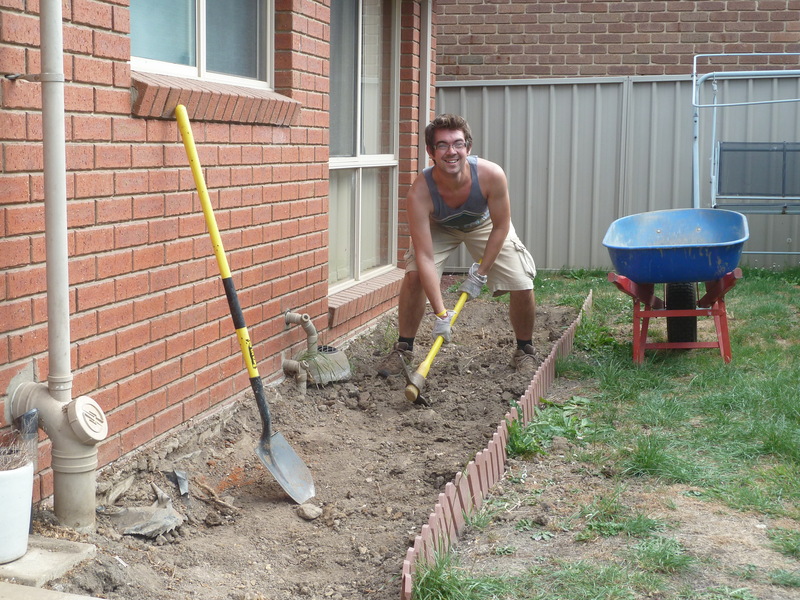 It was hard work, thanks to a similar clay soil we have at home, but I was fuelled by a few lemon lime and bitters (of course, a proper working man’s drink!) and a day of ferrying barrowload after barrowload of heavy soil to the nearby creek left a huge hole in the ground. With sweat pouring off my brow as I hacked my way through the clay, I found myself with a puzzling question. Back home, some smart alec would probably have said at some point “Are you digging to Australia,” with it being on the opposite side of the world. But where on earth would I dig to if I carried on going? Sometimes I worry about how my mind works. Or maybe its a Bitters overdose? I could be about to find a solution to paying my way in Australia for the next few months. I had to reply to an email from Chris, a guy who runs a roadhouse down in Mount Gambier. I’d replied to an ad on the Gumtree website asking for a hand around the place, in return for free accommodation and food. It sounded like an ideal solution to the problem of my quickly depleting finances in what is now an expensive country to visit, while at the same time giving me a flavour of life in the outback. He’d asked for me to ring or text him, so I sent a quick text with a few details about myself, my experience in hospitality (always knew five years at Pizza Hut through college and university would come in handy again!) and awaited a response. It soon came – he was interested in what I could offer, and said he’d be in touch again soon. In the meantime, I had some time to enjoy Sydney, and after a great few days catching up with friends from home, I was about to go and meet yet another great friend in the city – and she lives here. I first met Katrina 10 years ago now, working on a childrens’ summer camp in upstate New York. We immediately became great friends in America, and would often spend time together, even travelling around with others on visits to places like New York, Atlantic City and Philadelphia during our time off. 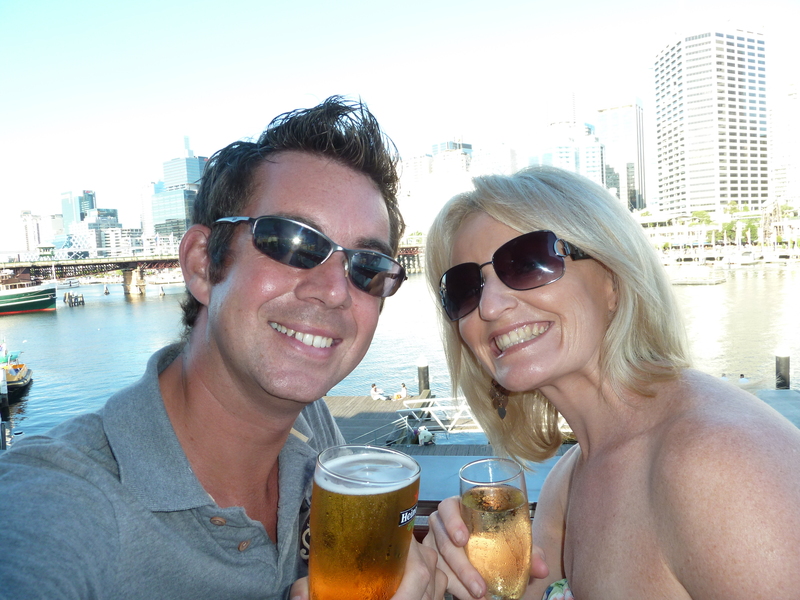 With Katrina and drinks at Darling Harbour on a sunny day! We stayed in touch, with Katrina staying with me at my parents house in Grimsby soon after the summer of 2002, as she was making her way around the world on her own travels. I had visited for New Year a few years later, and then stayed for a weekend on my way through to America from Thailand last year, thanks to a cheap round the world ticket I’d got my hands on. 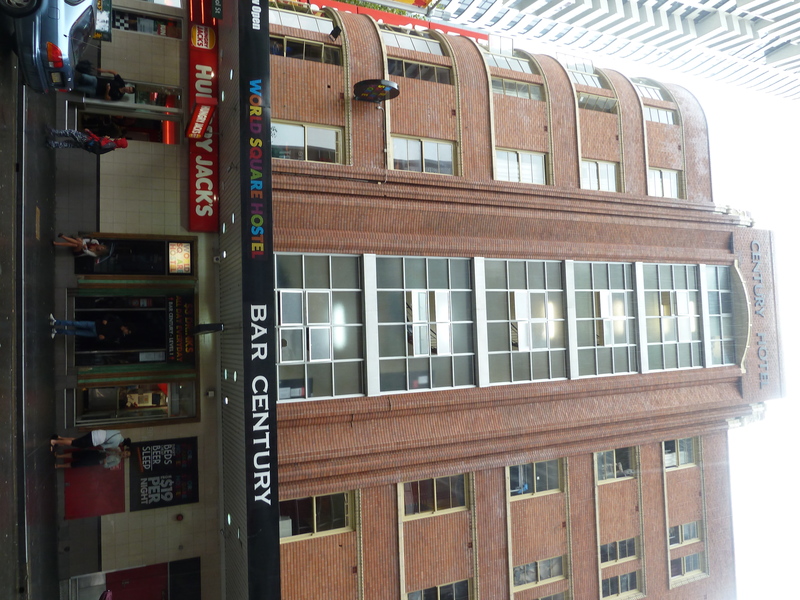 Now I was back, and on my way to the office where she works, not far from Darling Harbour, to meet her. Yet again, the weather had turned. 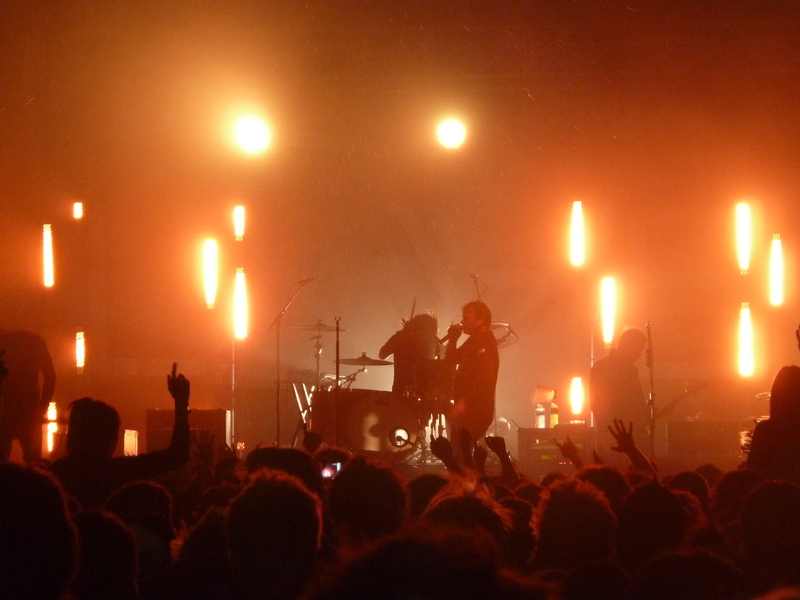 It was absolutely throwing it down, and Sydneysiders were not happy. Everywhere you turn, people were complaining about their ‘abysmal summer’. I overheard so many conversations of people on phones while waiting for pedestrian crossings, and it seemed like everyone was ranting about it. Sydney is one of the world’s most beautiful cities – in the sun – but something has gone badly wrong with the weather this year. Across the news and weather, reports of how it was one of the wettest summers on record were dominating headlines, and apparently the worst was yet to come. The forecast for the next month was almost straight rain, thanks to a weather system stuck over the east coast. Apparently it was all down to El Nino – remember that?! I arrived at Katrinas’ office, and soon the door opened behind me and her radiant smile beamed through. “I told you I’d be back,” I said as we hugged on the steps to her building yet again. We walked down to her car and another marathon catch-up session got underway. We went to a bar and Katrina bought dinner, while we chatted about my journey to Oz, our lives back home, how work was going and what my hopes were for the rest of the trip. Sure enough, it was. My friend Dan, who I was on the way to visit in the States last time I was with Katrina, was on the huge plasma screen in the corner, presenting his show on ESPN. Its funny, I can be on the other side of the world, but somehow it still feels a like a small place thanks to the wonders of technology. For the next few days I stayed with Katrina’s aunt, Ronnie, who lives above her, and we’d spend lots of time chatting about what was going on in the world. Ronnie is a bit of a news fan, and would often have the latest news on the television in the background, or have the latest papers on the kitchen table. We’d talk about stories I have worked on, and I’d give a bit of an insight into the stories in the newspapers in Australia, perhaps how they had been covered or how they were presented on the page. I would often catch the train from the nearby Hurlstone Park station into the city centre to use some of the free wifi I had found, to upload blogs and to keep an eye on my email incase I heard anything back from the roadhouse. After a few days with Katrina, and having not heard anything from the roadhouse, I decided to bite the bullet and just text back. 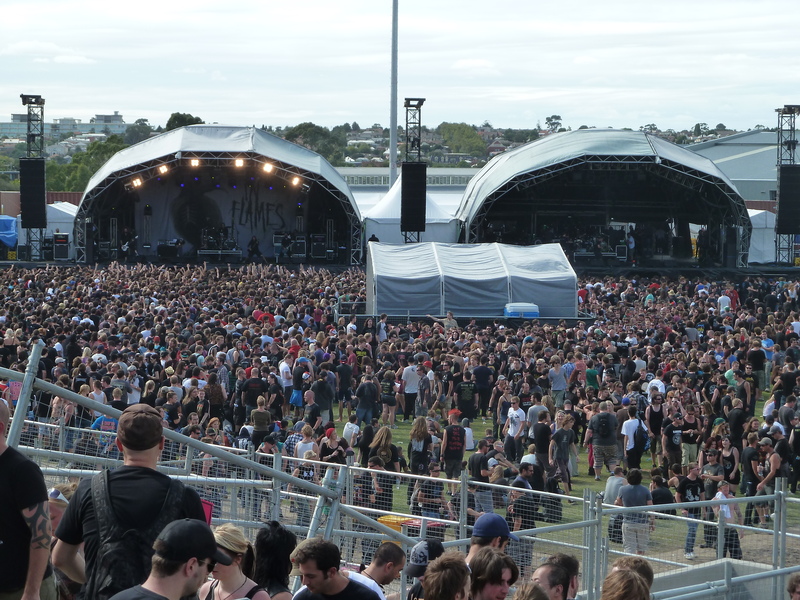 Straight away, Chris in Mount Gambier replied and asked how long I would want to stay. I told him a couple of months, before he then asked if I had worked in a roadhouse before. I said no, but I’d heard all about it and it sounded right up my street. I then had another text. It was a huge weight off my mind, and the perfect way to spend a few months while waiting for my friends Matt and Siobhan to arrive in Melbourne – it was near enough to Melbourne to go meet them, it meant my finances would be ok, and by the sound of it, it would be fun to involve myself in local life and see the real Australia along the way. 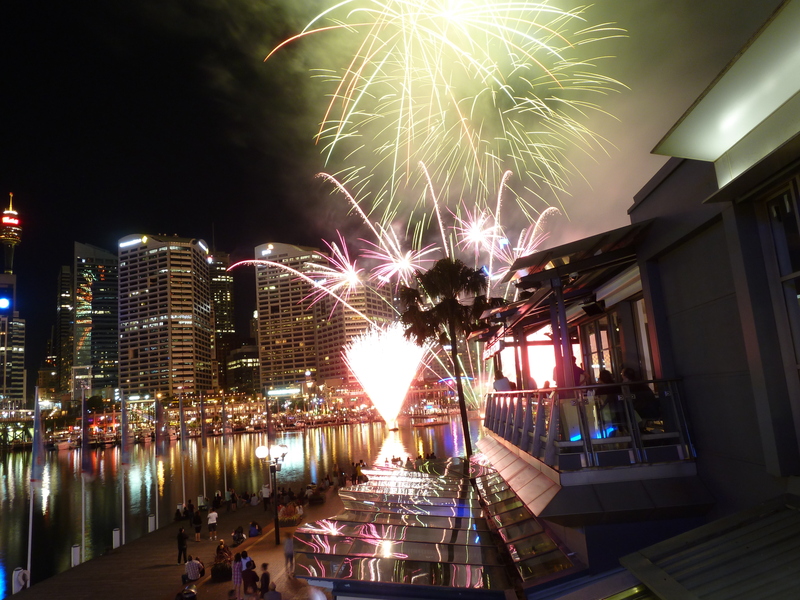 Buoyed by the news, I met Katrina in Darling Harbour and we went for drinks at one of the bars, before going for dinner overlooking the harbour. We spent hours people watching, laughing together at boat loads of hen party girls heading out for a harbour cruise and meal, joking about how a guy in a very flash and expensive speedboat would parade himself around the harbour at least once every half hour, and watching as darkness fell. That night, there was a great fireworks display in the harbour, and we had a brilliant view from the balcony where we had spent a brilliant few hours. 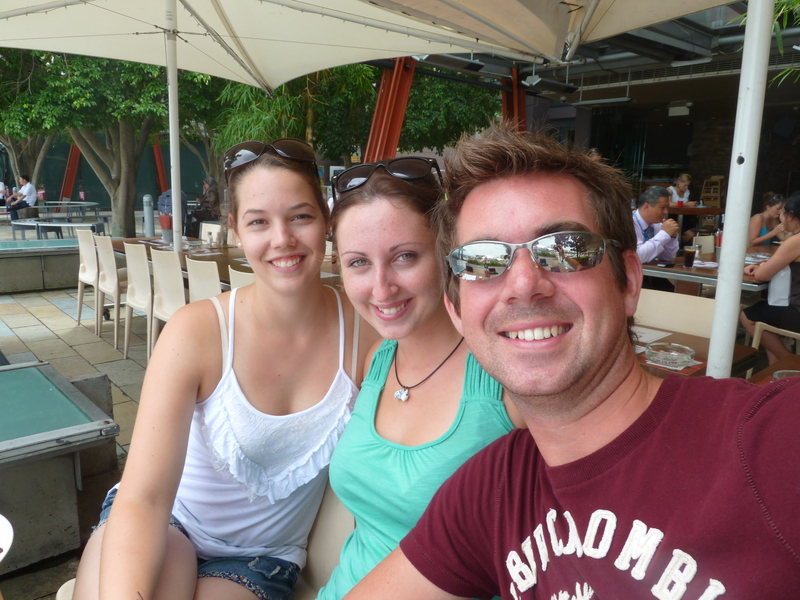 The next day, we met Katrina’s friend Ged for breakfast, another Aussie way of life that I love. Breakfast is a huge thing here, and people go to great lengths to make sure they are up and out, ready to meet up for some of the biggest breakfasts around. Back home after a heavy night, you might struggle to make it out for a late lunch. 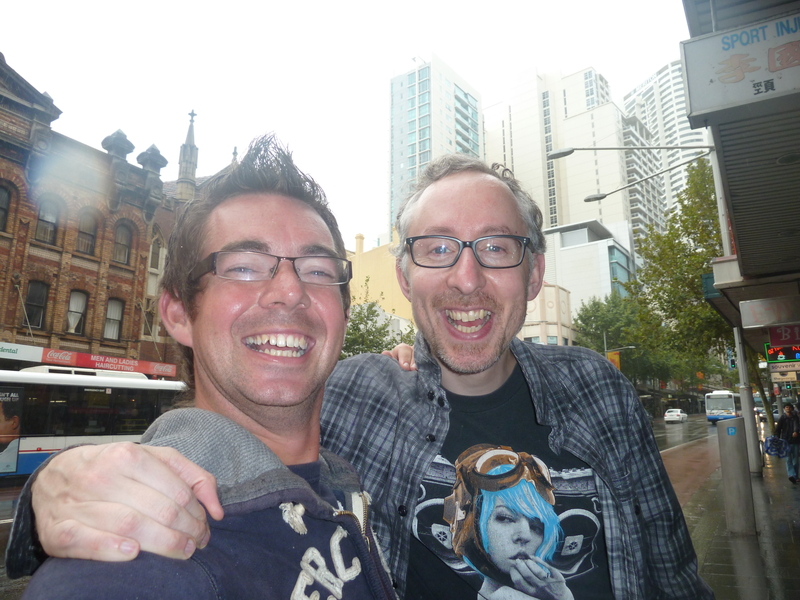 In Oz, a next day meet up for ‘brekkie’ is ‘as common as’ as they say over here. It was good to see Ged again – last time I saw him i’d just stepped off a sleepless overnight flight from Thailand last year, and was entering a strange hallucination stage of jetlag! Full of bacon and eggs, Katrina and I headed to the famous Coogee beach, which was absolutely packed. 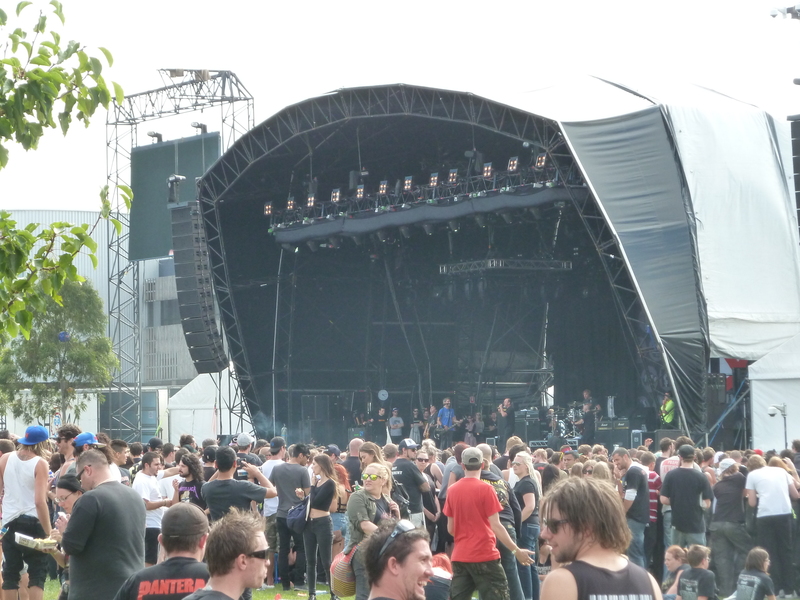 We found a good spot though, lathered up in suncream and relaxed. I was taken back by the size of the waves, something I could tell Katrina was secretly laughing about. “They’re just waves,” she’d say, but like most Aussies, she takes them and their sheer power for granted. If a roller like some of those crashing on the shore hit Cleethorpes, there would be some who would think a small Tsunami just struck the prom! 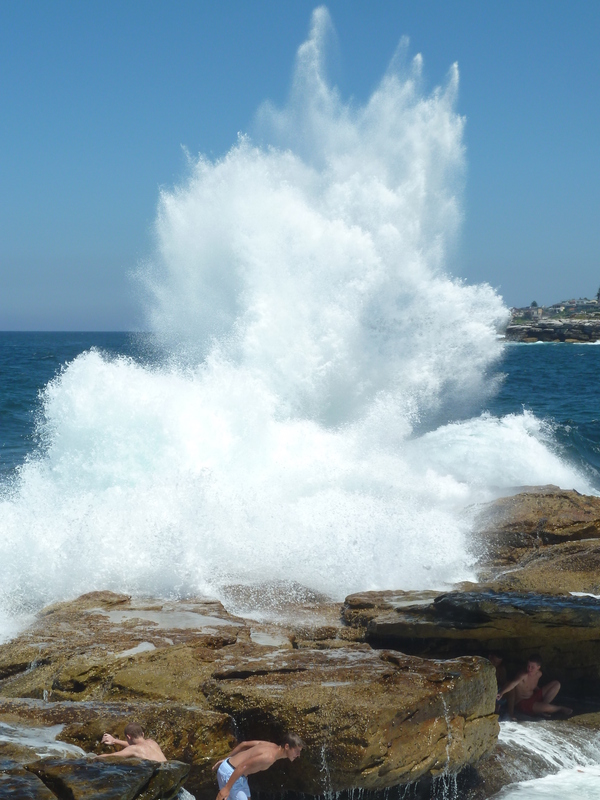 After burning slightly in the sun, we headed round to the rocks where huge plumes of foamy white sea spray was flying into the sky as the waves pounded the coastline. 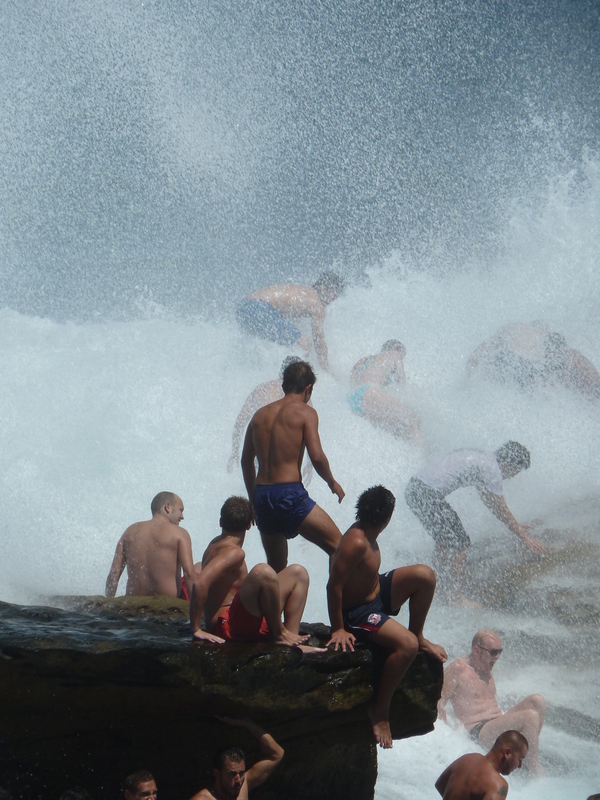 Incredibly, there were scores of people having fun, clinging onto rocks and being hit by the powerful wash. 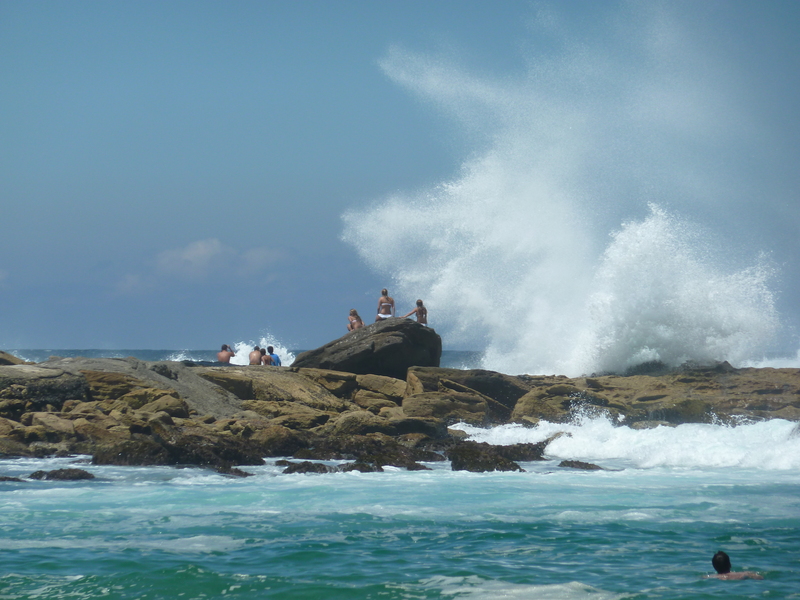 Some were being washed over the rocks and into the bubbling rockpools below. Most had big smiles on their faces. Some had painful-looking cuts, but it didn’t seem to put them off. 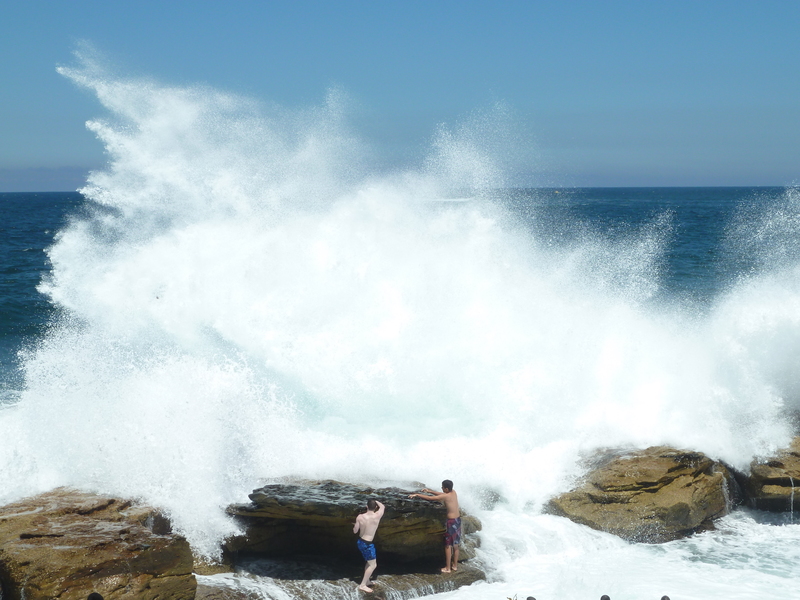 Out to sea, the huge swell meant I could time some great photos of the powerful waves hitting the rocks. 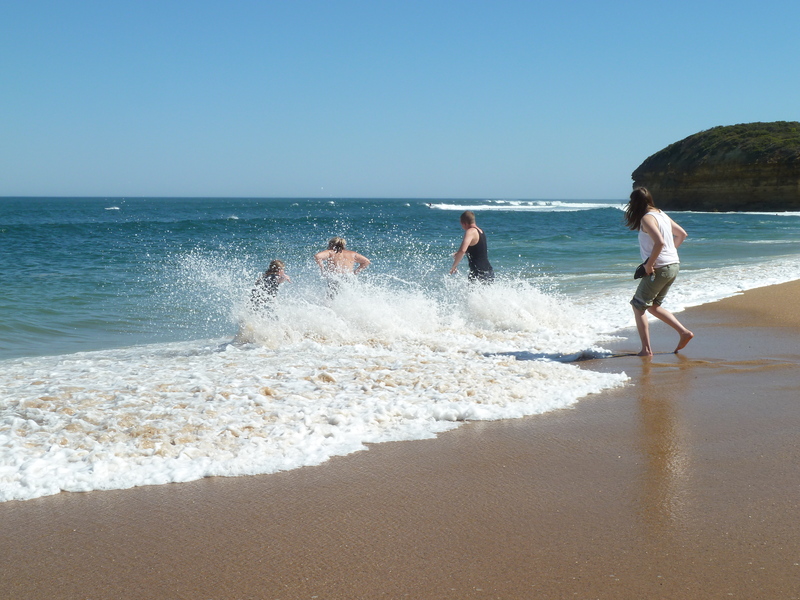 Huge waves, and lots of kids dodging them! I dragged myself away from the photography and went with Katrina back home. That night I was playing ‘dad’ for Katrina who had to meet a friend in the city centre. We drove into the city and to the Rocks district, and armed with some notes about how to find my way back to her house, dropped off Katrina and swapped seats. The directions worked a treat, and thanks to the fact Aussies drive on the same side as us, making my way around the streets and driving back to Hurlstone Park was a doddle. Picking her up at the end of the night, I did smile slightly as I drove under the beautifully lit Harbour Bridge and past the Opera House. 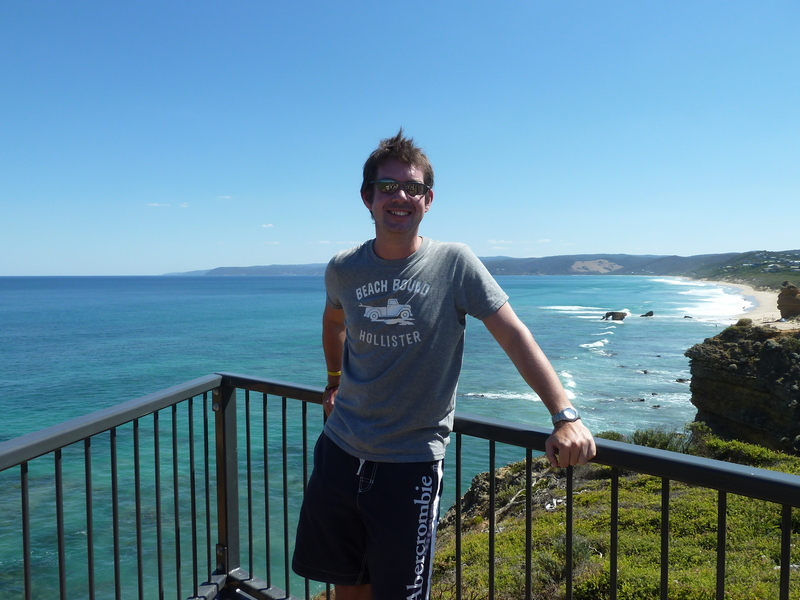 While Katrina was out, I’d been researching how to get to Mount Gambier, and found there was an added bonus. The flights from Melbourne to South Australia were expensive, but there was an alternative – the train. 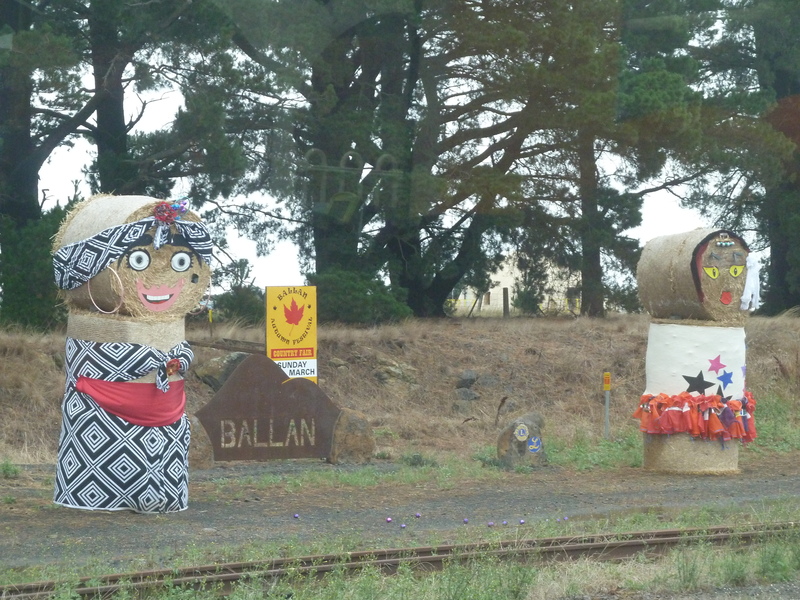 As an extra bonus, it passes through the town of Ballarat, where I’d need to swap onto a long distance bus. It also happens to be where my friend Natalie lives, a girl who I also met on the summer camp in America and who was part of my group of friends with Katrina. I messaged Nat and told her I could be coming to stay for a couple of days a lot sooner than I first thought, on the way through to Mount Gambier. She was delighted. I earmarked a cheap flight, and the day before I was to fly to Mount Gambier and the roadhouse, my phone bleeped. It was a text from Chris. The fact I was in a mobile phone shop, finding out if the mobile broadband network coverage was any good in Mount Gambier, seemed to add salt to the wound. It was a huge blow, and I walked out into the street. I was gutted. I’d actually been really looking forward to the experience, and to the journey over there. Suddenly I felt like it had all been taken away from me, and in a poor way too. Quite why it was done by text I’ll never know. I’d done some research on the internet about the roadhouse, and picked up that it was under new management. Perhaps Chris was new to the game and new to management. Perhaps he didn’t realise how much of a blow it could be to someone who had just planned the next few months around the promise of a placement. Either way, I had some quick thinking to do. 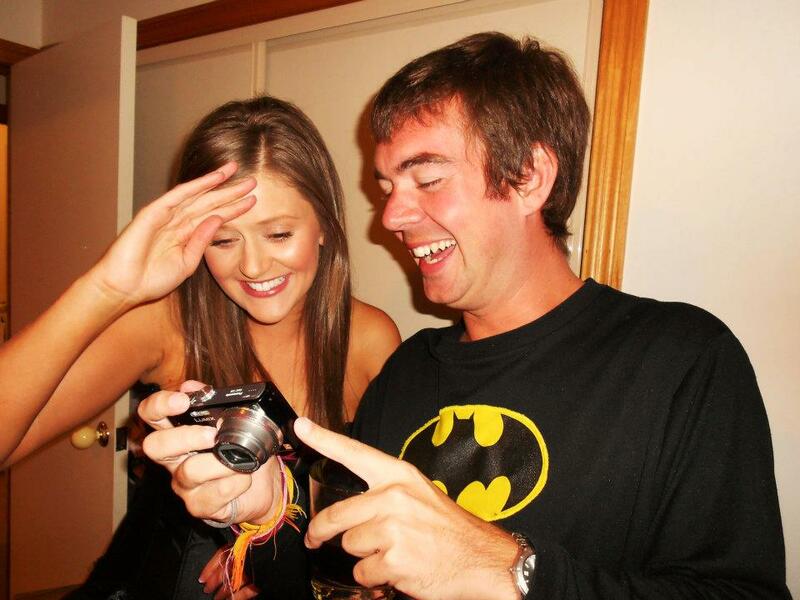 I decided to stick with my plan – I booked the flight to Melbourne as planned, and decided to see Nat for a few days. After a short stop at Sydney’s Apple Store, where they thankfully replaced yet another duff iPhone 3GS, I headed to the airport. 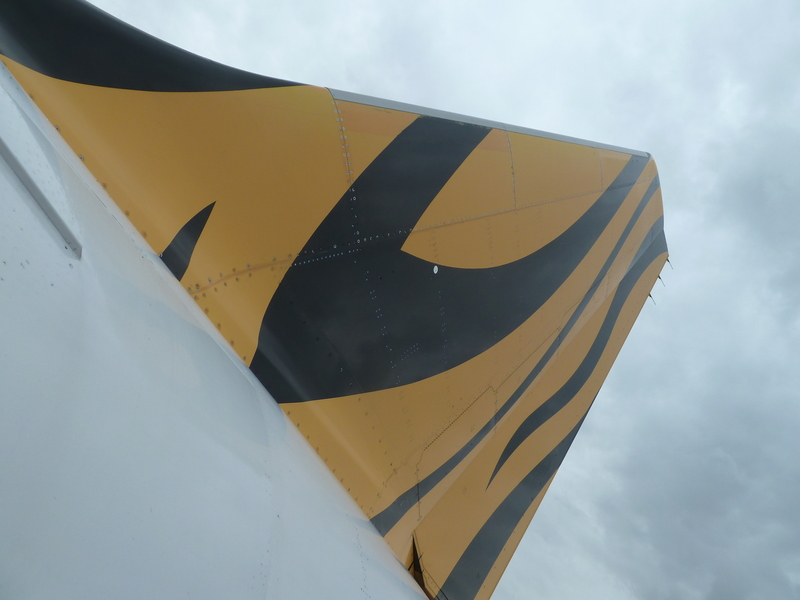 I had booked a cheap flight with Tiger Airways, the company I had flown with from Singapore to Thailand before New Year, and which still made me think of home. 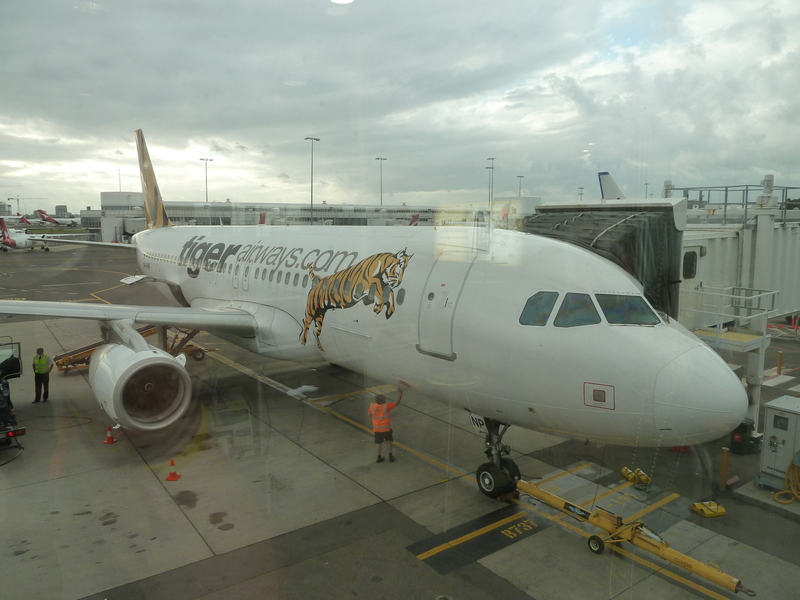 With Tigers being synonymous with Hull City football club back home, I cant help but think of it when I see the paint scheme on the plane. There’s an EYMS bus painted up like it that I often see around the streets of Hull, but this takes it to a whole new level! Not quite knowing what my next move was once I was in Melbourne, I was delighted to make contact with Ian, yet another friend from Camp Na Sho Pa in America, who was one of my fellow bunk counsellors for the summer in 2002. 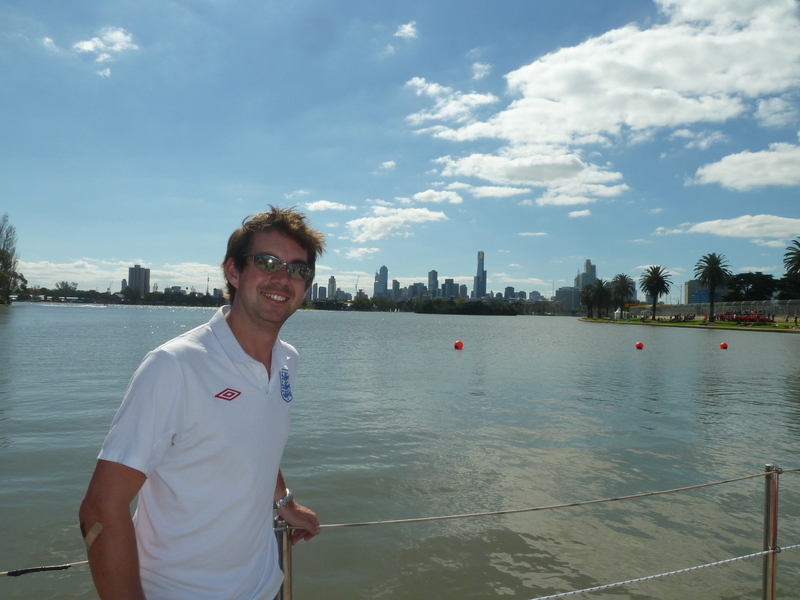 He lived in London for many years, so we’d remained good friends, but now he’s moved back to his homeland and moved to Melbourne a couple of years ago. He offered to meet me at the airport, and it was great to see him waiting by his BMW that he bought in the UK and had shipped Down Under. After checking into my hostel, we had a great night catching up over a few ‘frothies’ as he called them. He’s in charge of some bars in the city and was able to give me some good tips on things to do. 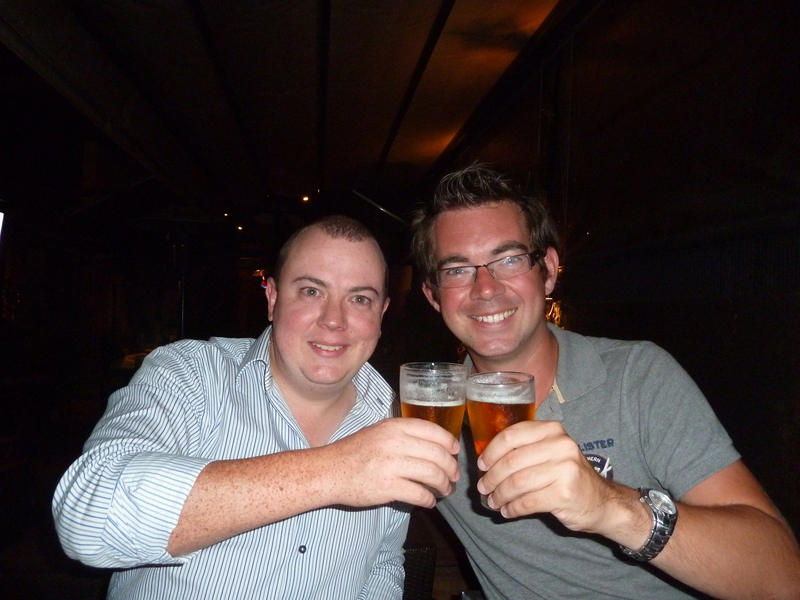 He invited me to meet his parents the following day, and we had a great night at one of Ian’s pubs talking over dinner. I’m certainly winging it, taking each day at a time, and I must admit, it is quite fun. Thanks to two previous visits, I already knew my way around the city somewhat, but even better than that, I had a week of catching up with close friends. My flight from Bangkok was one of the first to touch down at Sydney’s international airport just after 6am. Two hours later and I’d already bagged an Australian mobile sim card for my phone, caught a train and was walking along the city’s George Street in search of the World Square Hostel. Staying there was Cat, the girl who helped inspire my whole trip by inviting me to spend some time in Thailand with her last May. Back then, her year-long backpacking trip around the world was in its early stages, and while I had been back to the UK, worked, planned a trip and then made my way on my own trip for almost four months, Cat had been working on a ranch and was now preparing to leave Australia. We’d stayed in touch, with the original plan being to possibly meet up and spend some time travelling together, but having changed my New Year plans and deciding to spend more time in southeast Asia, there was no time to do that. Instead, she sent me a message on Skype telling me she was flying out to New Zealand at the end of January. 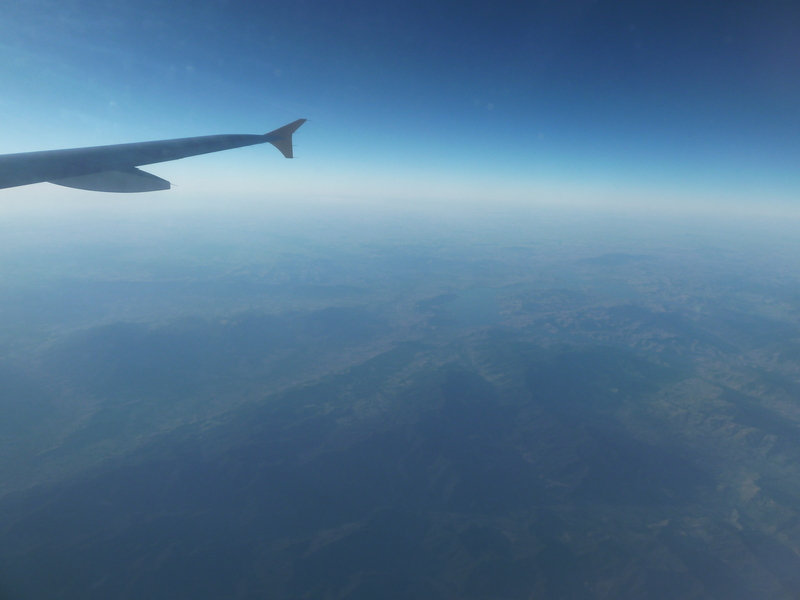 We cross-checked our tickets – I arrived at 6am on January 30, and Cat left on an afternoon flight on January 31st. Our paths would cross for just a little more than 24 hours, which was barely enough time to catch up, but I was grateful – our flights could quite easily have been different, meaning we’d have missed each other completely by a matter of hours. And so with instructions of where she was staying, I got into the lift at the hostel and made my way to the fourth floor, knocked quietly on the door, and as if by magic, there she was. It was a hushed reunion – the whole dorm was still sleeping, but we spent a good couple of hours talking about our journeys barely above a whisper. 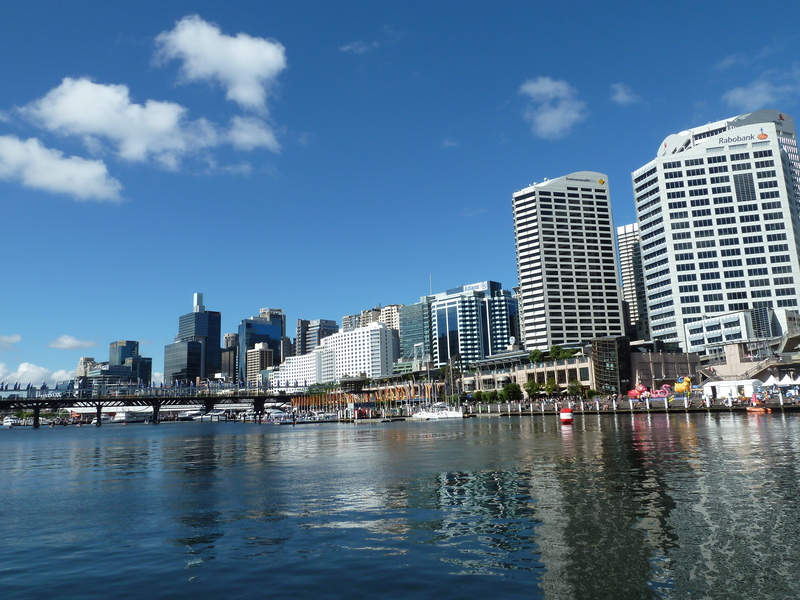 With the sun shining, we headed outside and towards Darling Harbour. 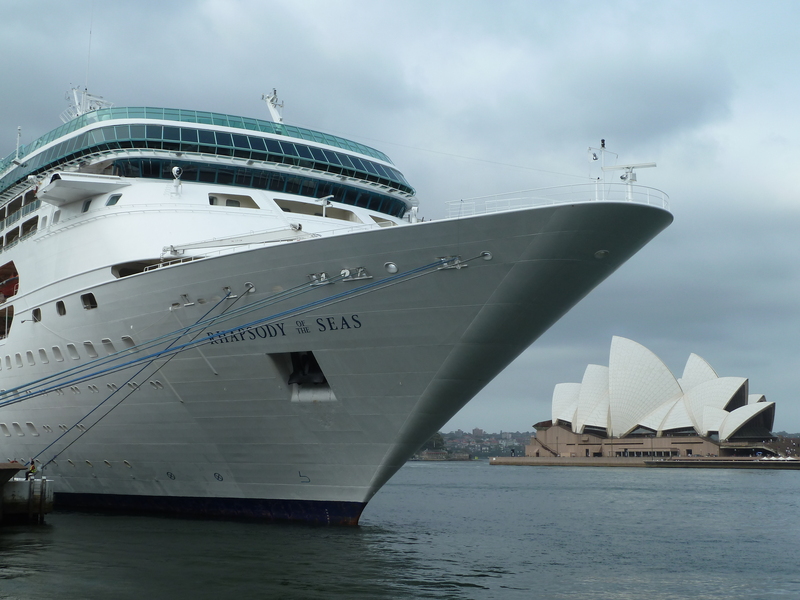 I suggested we catch one of the famous ferries around to Circular Quay, the main transport interchange near the Opera House and Harbour Bridge. 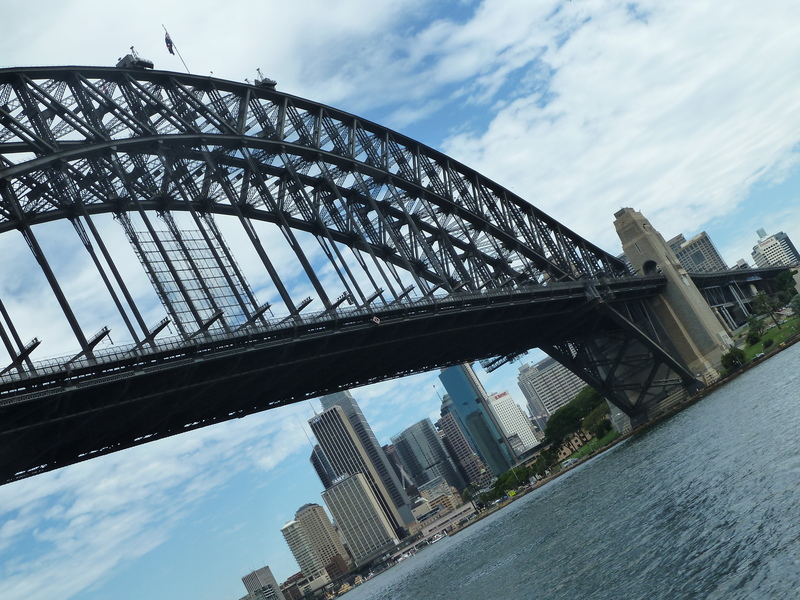 I also knew from my previous visits that the journey from Darling Harbour offers some of the best views of both famous landmarks, with the bridge framing the Opera House perfectly underneath. It soon began to dawn on me how expensive Australia will prove to be. On my journey so far, anyone I have met who was from the country, or fellow backpackers on their way back to Europe in the opposite direction from Australia, would often talk about how even simple things seem to cost a fortune. Its all to do with the powerful Australian Dollar, largely thanks to the huge exports of raw materials the country can offer developing nations. 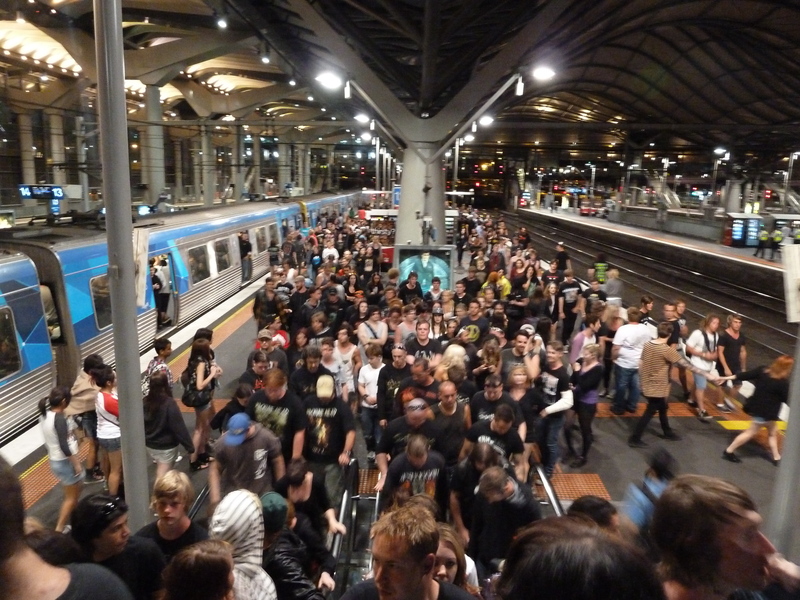 It means that Australia has largely escaped the global recession, and that anyone travelling from overseas gets drastically hit in the pocket. After months of paying anything from a few pence to a couple of pounds for public transport in Asia, it comes as a shock when the short boat journey we’d taken cost almost $5 (about £3) My 15 minute train ride from the airport to the city centre in the morning cost over $16 (£10). The same amount of money in Thailand could almost get you down the entire length of the country on a third class overnight train! It was just a small part of the culture shock that hit me, and in a surprising way. I hadn’t realised just how much I had become used to the organised chaos way of life in Thailand, Vietnam, China et al. Here in Sydney, people were waiting patiently for the green man at pedestrian crossings, rather than just wandering through traffic. Businessmen in smart suits were strolling meaningfully through the streets, everyone seemed to have their eyes fixed on smart phones while walking, so many people were listening to iPods and music. It even seemed strange to see scores of people jogging around parks and harbours, many on their lunch breaks. Of course, this is normal life, a way of life that back in Hull or London, I wouldn’t think twice about. But suddenly, after months of not seeing any of this orderly, sensible normality, it was incredibly noticeable. I can only wonder what it must feel like to be someone from a developing country who steps into the hustle and bustle of one of the world’s greatest cities for the first time if after just a few months it can begin to feel alien to me. It was a strange sensation, and one Cat had noticed in me. I felt a little spaced out at times, although the jet lag that was creeping up on me may have played a part. Others would just say it was normal for me! 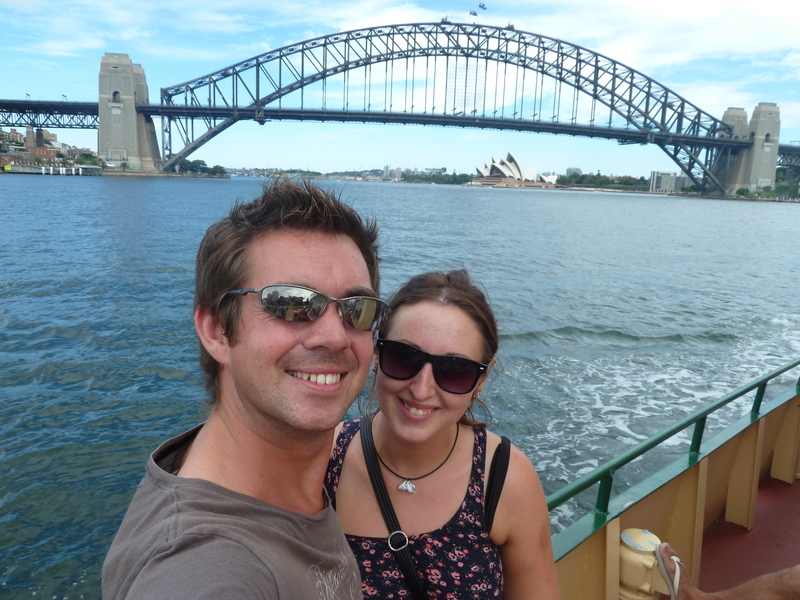 We bobbed our way around and under the famous bridge before arriving at Circular Quay and making our way to the Botanical Gardens. 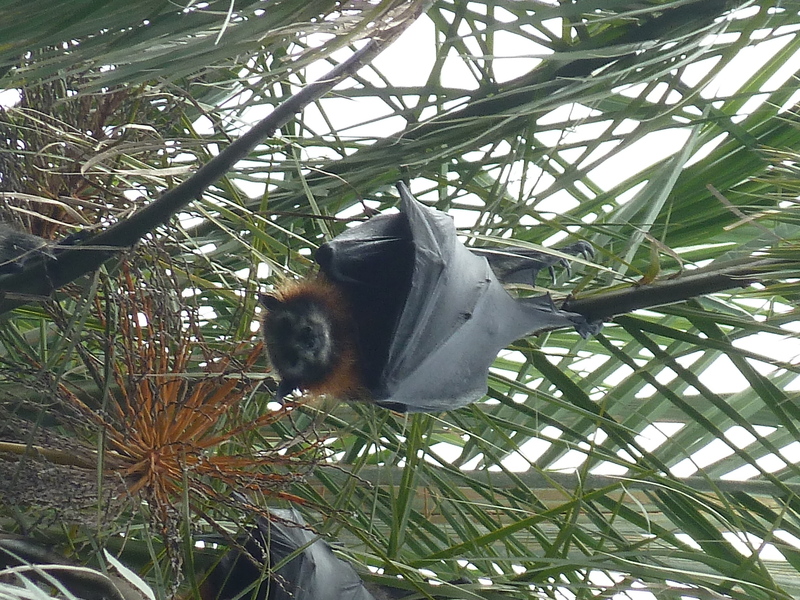 Cat spotted some flying foxes hanging from the trees, one of which decided to have a fly around, only to be promptly chased around by some Chinese tourists. After a brief stop for a sit down on some grass in the centre of the gardens, we headed to Mrs Macquarie’s point, an area of the gardens that juts out into the water and offers great views of the harbour. The water was deep blue and crystal clear, and the waves were bouncing off the rocks that lay around the area. We found a spot on one of the larger ones and spent what could well have been hours on it relaxing in the sun, watching the boats and ferries making their way to the beaches, talking about our travel experiences since we last met up and basically pinching ourselves that we’d managed to meet up. I’d spent some of my nine hour flight working out the dates of when Cat and I first met in the Zest bar on Hull’s Newland Avenue. It was on a Saturday night after the BBC pantomime – I’d spent the day as Baron Hardup in Cinderella, and probably still had far too much eye liner on than was good for me. Back home, my colleagues were once again treading the boards for this year’s panto which made me check the calendar. Incredibly, working out dates and time differences, it was about a year to the exact moment that we’d first began chatting, when Cat told me of her travel plans, and how I mentioned that it was something I was considering. 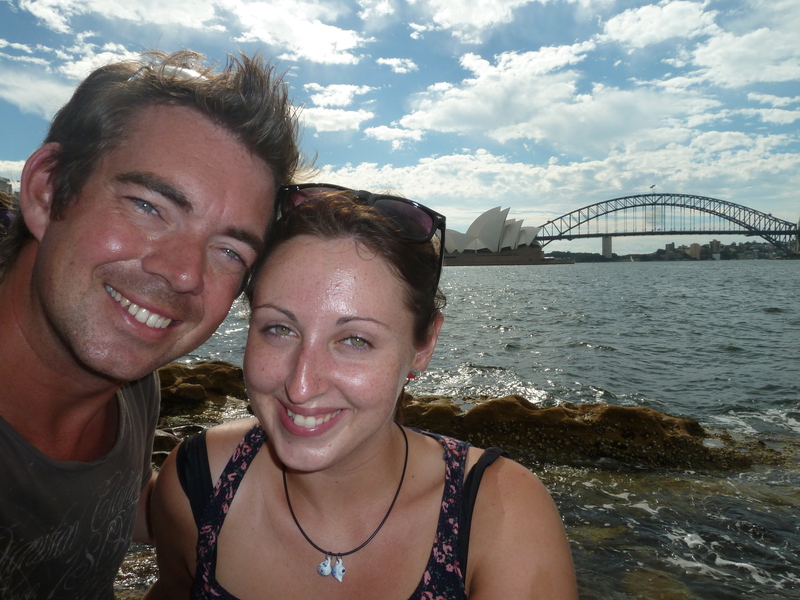 We laughed about what we’d have said if someone had interrupted us that night in Zest to say that in a years’ time we’d both be sitting on rocks on the other side of the world, laughing and joking together with a view of Sydney’s Opera House and Harbour Bridge! A great place to catch up! 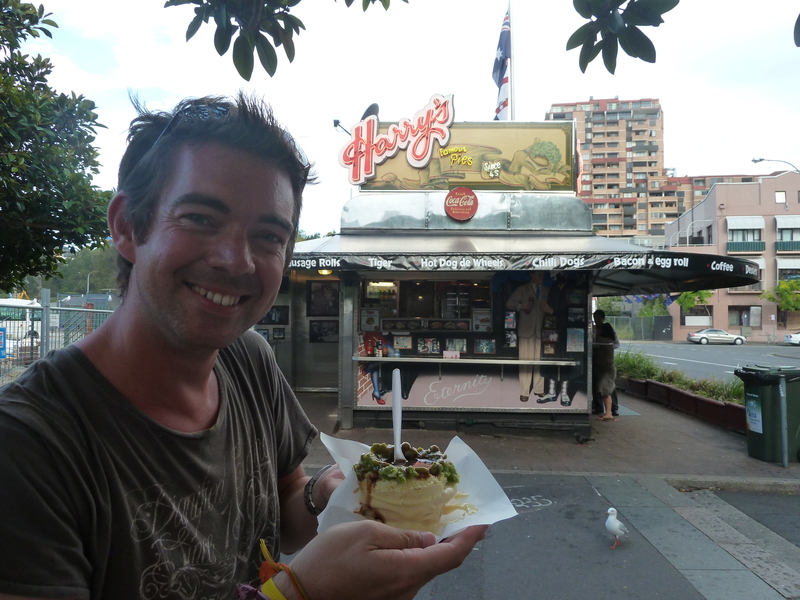 Back in Thailand last year, I’d told Cat about a great little pie place called Harry’s Café De Wheels, somewhere that I’d been to with another friend in my last big visit to Australia seven years ago. I’d actually seen it on a television holiday programme, and it was someone like Ainsley Harriot that had said it was one of the best places they had eaten in the southern hemisphere. Well, Asia isn’t a big lover of pies, and Cat hadn’t been yet, so we decided that was the place to head to for tea. It started out as a cart on wheels, feeding the Navy sailors from the nearby Woolloomooloo naval yard, but established itself both in the local neighbourhood and in local folklore. Over the years, countless famous people and celebrities have stopped by for a pie, as proven by the photos plastered on the walls of the small shack. This place was doing amazing pies well before the whole ‘pie’ craze caught on – right through to the careful positioning of mashed potato on the top of the pie, before a little well is formed for the rich, tasty gravy. For anyone reading this who is heading to Sydney, it’s a little out of the way from the main city centre, but its well worth the visit. Having caught countless hungry eyes from fitness conscious runners who passed by as we were tucking in on the quayside, we headed back towards the city centre and the hostel, where I was introduced to goon, the local cheap wine. It comes in a box, which is removed, and countless silvery foil bags of the stuff can be found in hostel fridges across Australia. With a beer in the pub costing anything up to around $9 (£5+) going out for a drink is expensive business – too expensive for most European backpackers who are struggling with exchange rates. Instead, for around $10, you can buy a big box of cheap wine. Countless bad headaches are clearly included in the price, and while its never going to rival the best glasses of red or white you’ve ever had, it was, almost, drinkable. 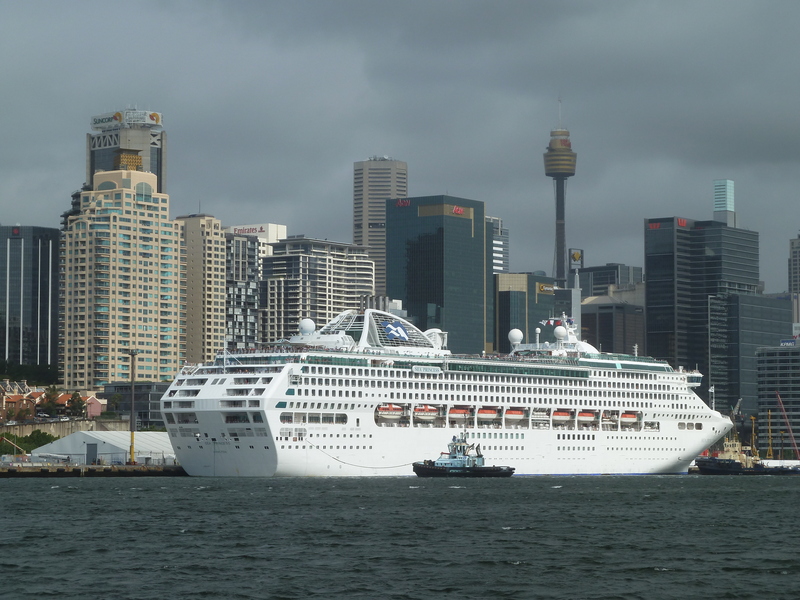 The following day was largely spent searching for a pair of the famous Australian Ugg boots for Cat with her friend Teresa, which she then sent home to Hull, before we went for a relaxing lunch in Darling Harbour. While most main courses on menus here hover around the $20-25 mark (£14-18) there are some great lunchtime deals on offer in some places. We opted for a $10 steak and chips deal, which for the equivalent of £6 was actually a fantastic meal. A huge bit of steak that melted in the mouth and perfectly cooked – this could be something to look out for in the future! That afternoon I went with Cat back to the airport and helped her with her bags. 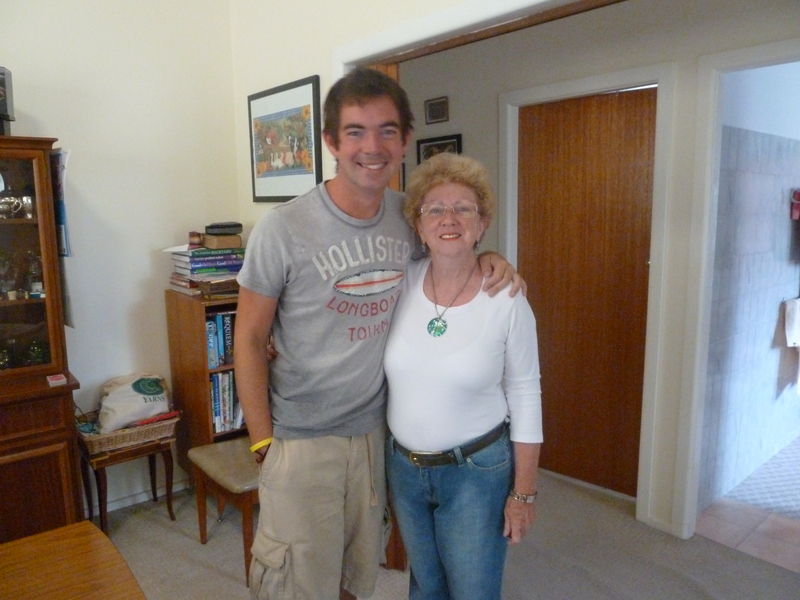 She was heading off to Christchurch, and in just a month’s time, she’ll be heading back home. We’d had a great day together, and we were glad our flights allowed us to at least catch up for a few hours. I’ll always be grateful to Cat for inspiring me to make this trip – if it wasn’t for her, I probably wouldn’t be in Australia right now, and I thanked her for being the kick up the backside I needed to stop me thinking about doing it and to actually book the trip. We gave each other a hug before she walked away waving, and disappeared behind the departure gate screen. Back at the hostel, it was time to start planning exactly how I’m going to spend my time in Australia. Finances are being squeezed, especially by the living costs. My hostel is setting me back £20 a night for a dorm bed, in stark contrast to the £5 or £6 I was paying just a few days ago. Cat told me about how she worked at a roadhouse in the outback, which provided free accommodation and meals in return for doing some work around the place. It sounded like a solution to my problems, and spent hours scouring the Gumtree website for a place to stay. Bingo. I found a place in Mount Gambier, South Australia, which was looking for help around the place. I sent off a letter and a few details about me and awaited the response. 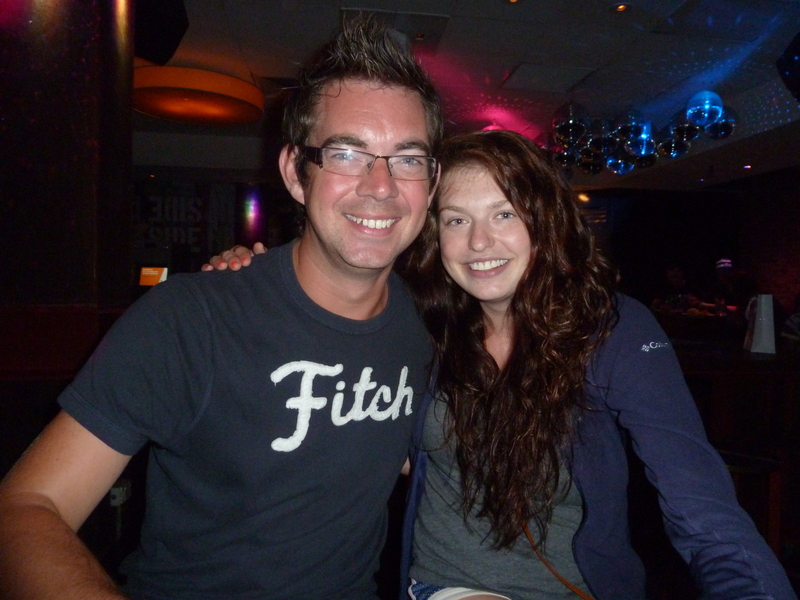 I then set off to meet Alyssa, one of my tour mates from Asia, who was also in the city. We chatted over dinner and laughed about all the good times we had on our tour. Its already seems a long time ago! I went on to have a brilliant couple of days in Sydney, largely down to the fact one of my closest friends from home happened to be working in the city for the week. 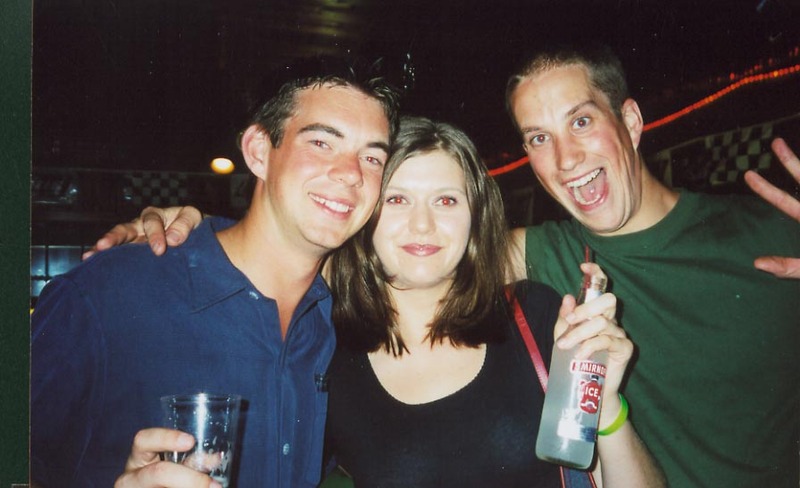 I’ve known Jack since my university days, even living together for the last year of our studies in Southampton. He’s a brilliant, brilliant guy – he works like an absolute trooper for his own photography business, but its all paying off. He’s winning awards, getting countless magazine and journal spreads and covers and setting the world of hair photography on fire with his style and composition of images. In the pouring rain with Jack -the smiles say it all! He was in Sydney to carry out a shoot and meet representatives from one of the world’s largest upmarket hair companies, as well as meeting former editors of some of the world’s leading magazines. Exciting times indeed for him, and a brilliant coincidence that meant we could catch up over lunch. He made the mistake of saying he’d meet me by Pie Face – a chain of hundreds of pie shops which appear as frequently along the streets as 7-Elevens do in Thailand. Eventually we worked out a meeting point that’s easier to find, at a hotel and bar, and sure enough, the moment I walk around the corner, there he was, arm held aloft from his 6ft 6in frame and walking across the street, complete with big cheesy grin. We had a manly hug, and laughed. It seemed a bit surreal – Jack was one of the last friends I’d had a proper conversation with on my final night in London, and we had no idea fate would bring the opportunity to meet up halfway through my trip, and on the other side of the world. For a few hours, we forgot where we were. It was as if he was at my house, or I was in a bar near his north London home. We talked about everything – the travelling, the people I’ve met, how his business was going, life back home. After months of not properly speaking to or seeing any of my close mates, it was brilliant pick-me-up. While there’s no doubt the last few months have been incredible, there are still moments where you think of and miss everyone back home. And when its one of your closest mates, complete with all the banter and laughter we bring out in each other, it really does lift spirits. Jack was struggling too, mainly because he was still operating on British time thanks to having just six days in the city. For those who haven’t met him, he’s by far the tallest person I know, so naturally I asked how he found the 26-hour flight. “Brutal,” was his summary, in one word. He told me how he’d paid for extra legroom, only to be stuck in a seat next to toilets and the galley on the flight, therefore ensuring he got next to no sleep for the entire duration of the flight with him being knocked and bashed by all and sundry in the aisle next to him. Naturally, I cracked up as his exasperated face told more of the story than any words could ever do justice. Jack bought me lunch – yet another steak special – and we agreed to meet again for a few hours the following day in between his meetings. The weather had well and truly turned. 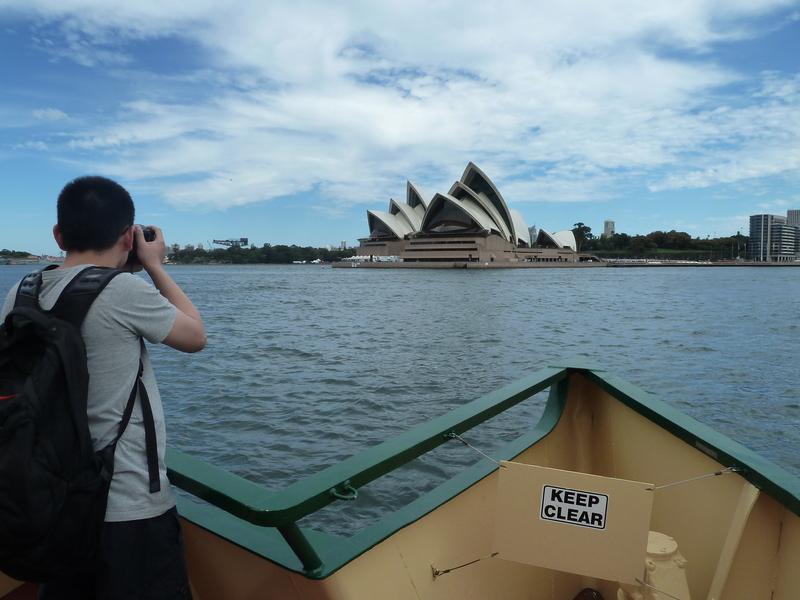 Infact, in the five days since I arrived in Sydney, only my first day had been dry and sunny. “I take great pleasure in the fact that you chose this year, the wettest on record for Sydney, to spend summer in Australia,” Jack laughed in typical fashion when I meet him in pouring rain the following day. I laughed back, and told him it was all about to change in time for me to enjoy some sun at the end of the Aussie summer. We spent some time buying gifts for the family he had been staying with, while he also came back with me to have a look inside the hostel. Jack did a lot of travelling in his younger years (quite a while ago now!) and his stories of times around the world would fascinate me while at university. He also encouraged me to travel to America to work on a summer camp for the summer after my studies, something that would turn out to be one of the best things I’d ever done as far as opening eyes and doors on the world. We stopped for coffee and cake before we had to say goodbye. In a few hours, Jack would be back on another 26-hour flight home via Hong Kong, hopefully being nudged, bashed and bumped into for the entire duration yet again. I took a lot of pleasure in reminding him of the “brutal” journey he yet again has to endure, but I was also sad to see him go. Most people when they set off on round the world trips wave goodbye to close friends on home soil. Yet, by chance, I’d been able to catch up with Cat and spend some quality time with Jack in the middle of my trip. 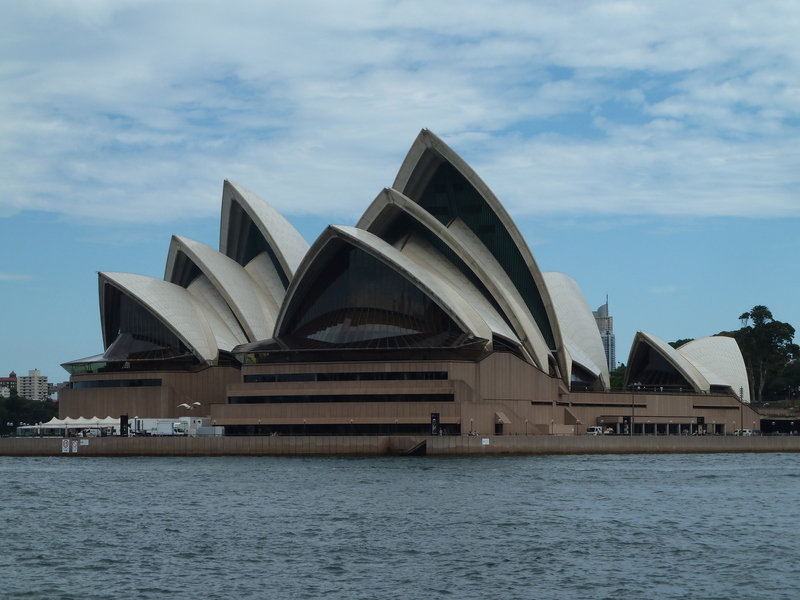 It had perked me up, and made me feel much more at home in Sydney than I could have imagined. 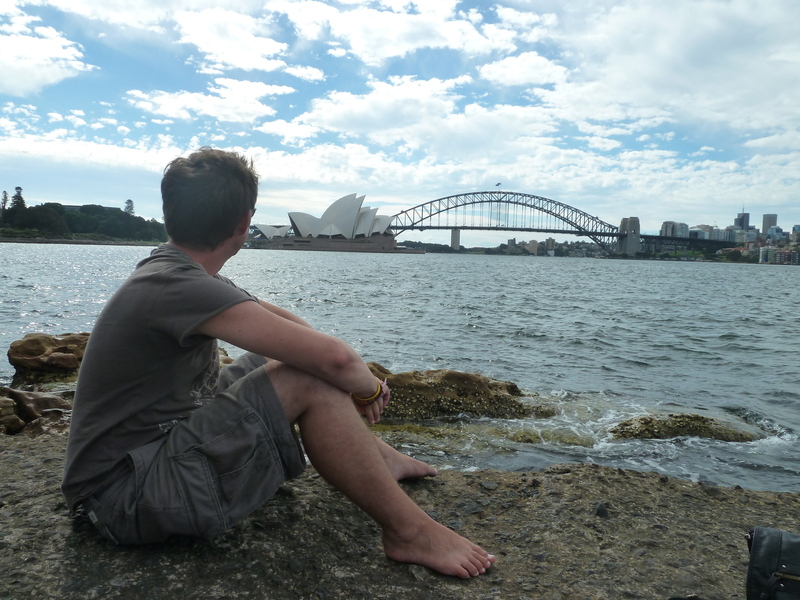 I walked back to the hostel, a broad smile across my face, and feeling ready for Australia. I got back to the hostel and checked my email – the roadhouse had got back to me and asked me to give them a call. Could I be outback bound?